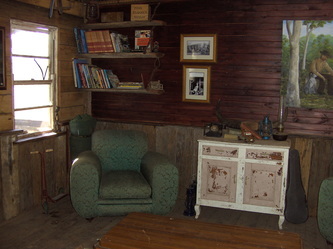 The photo's below are not from shows but will be of interest to members and others who visit our web site. 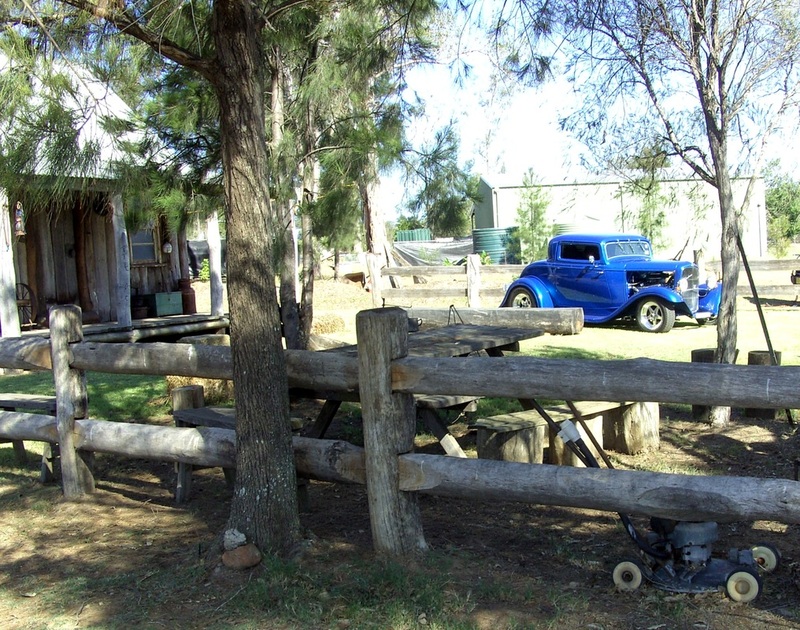 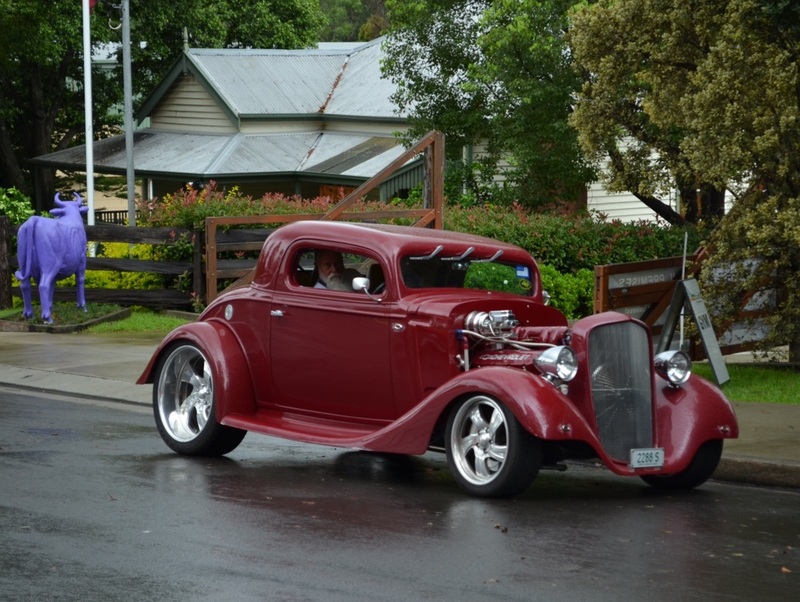 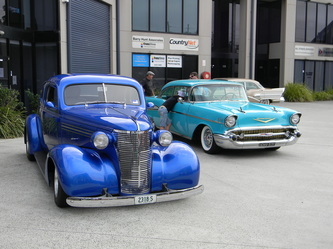 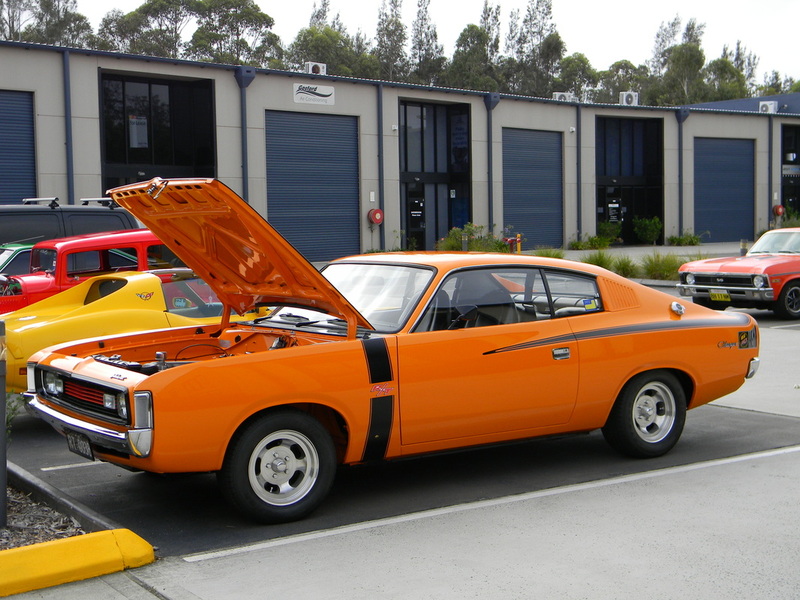 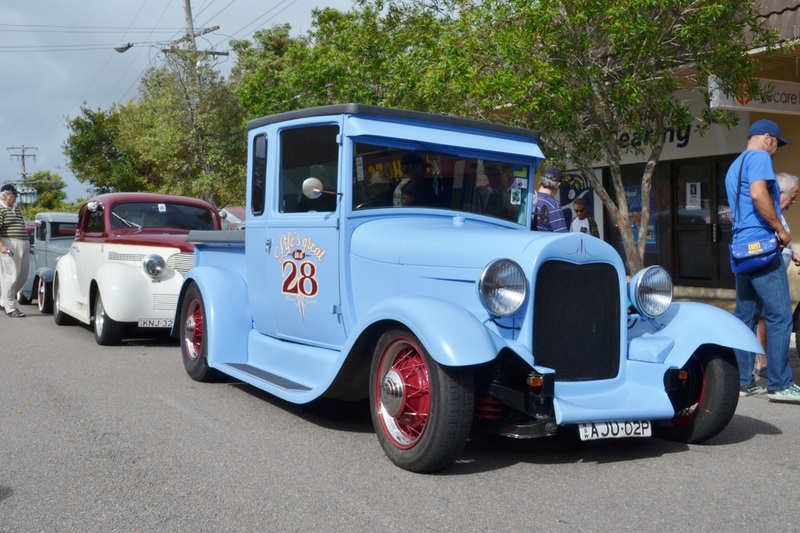 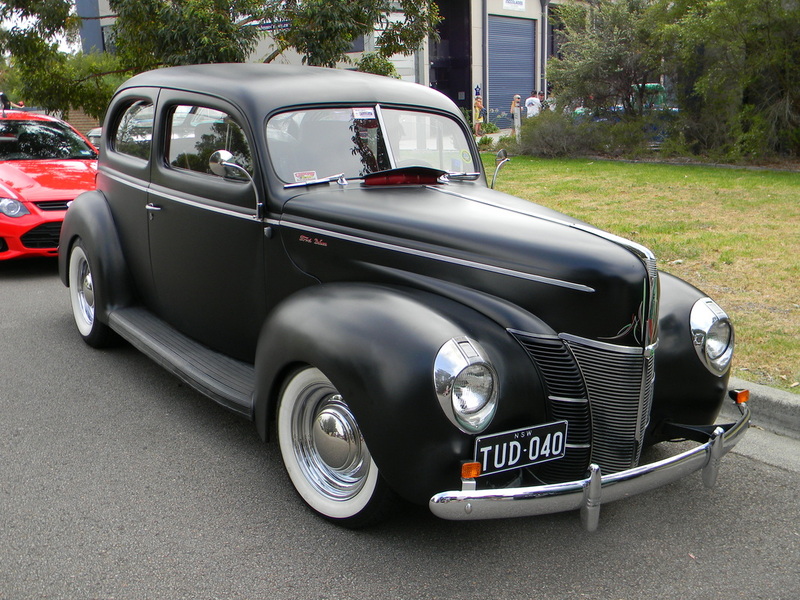 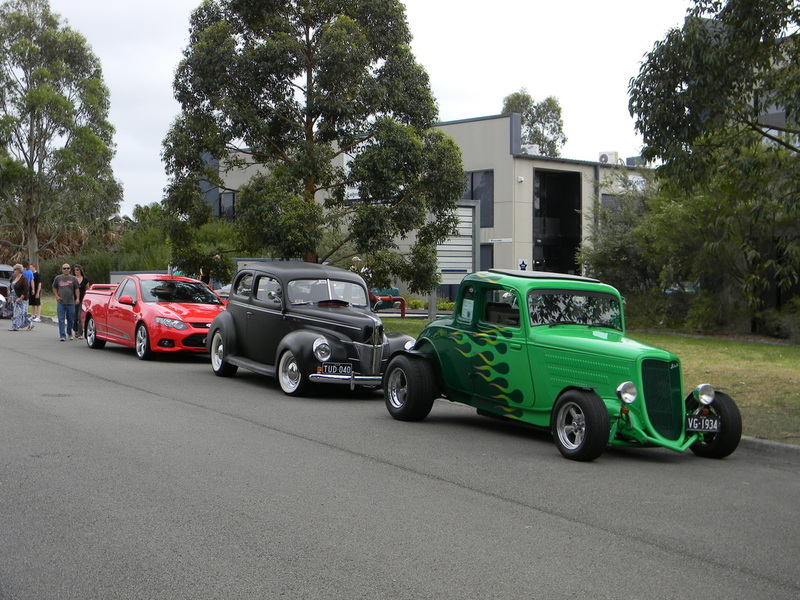 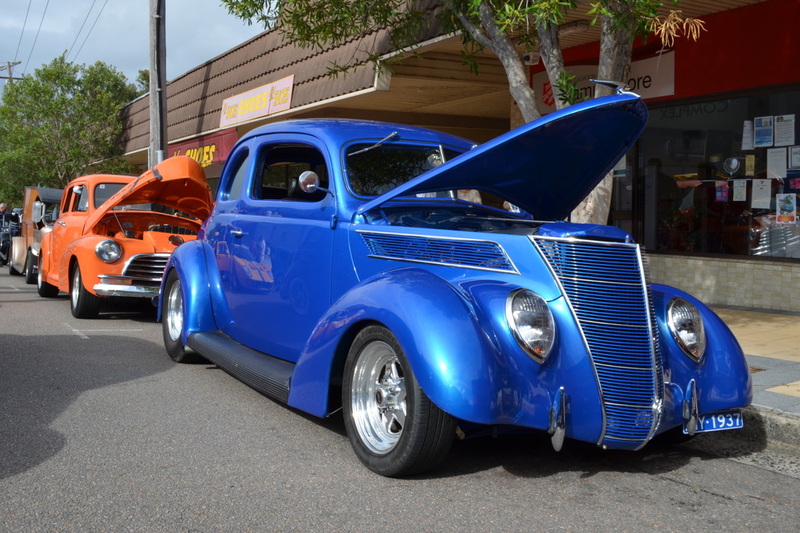 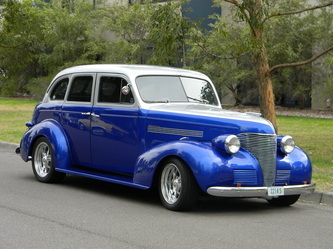 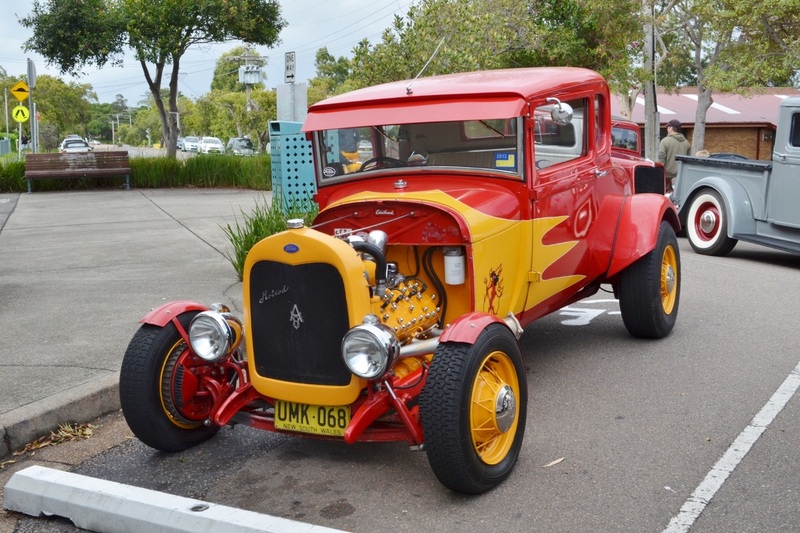 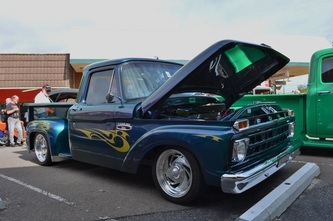 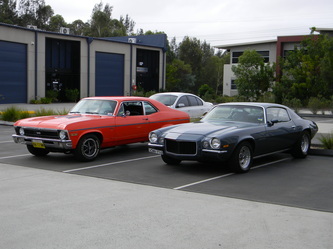 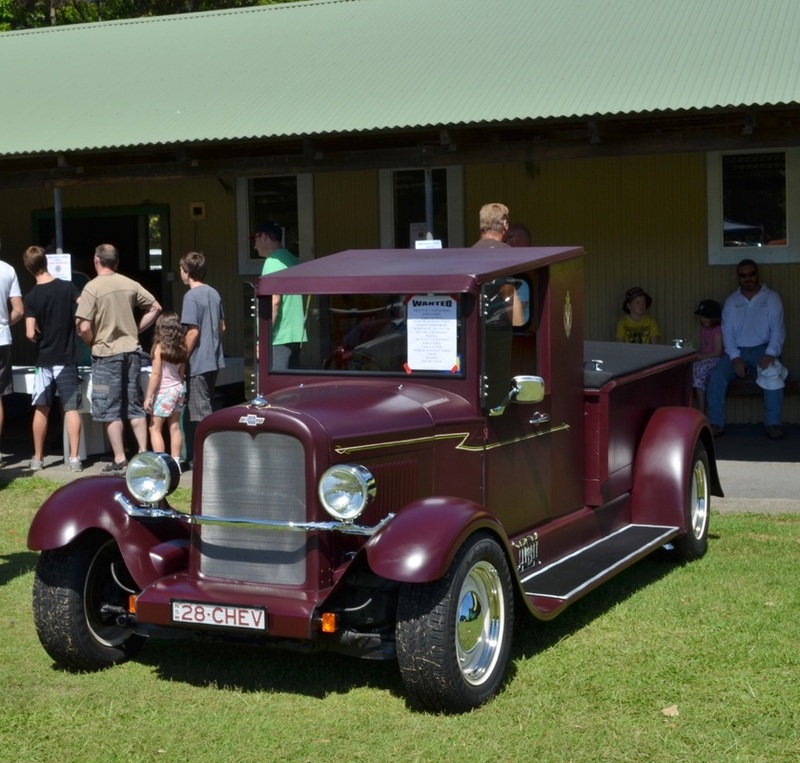 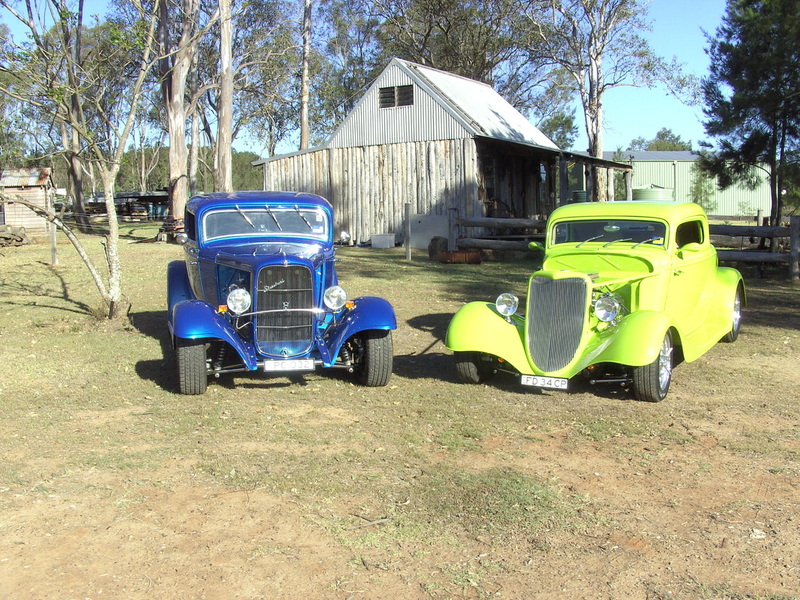 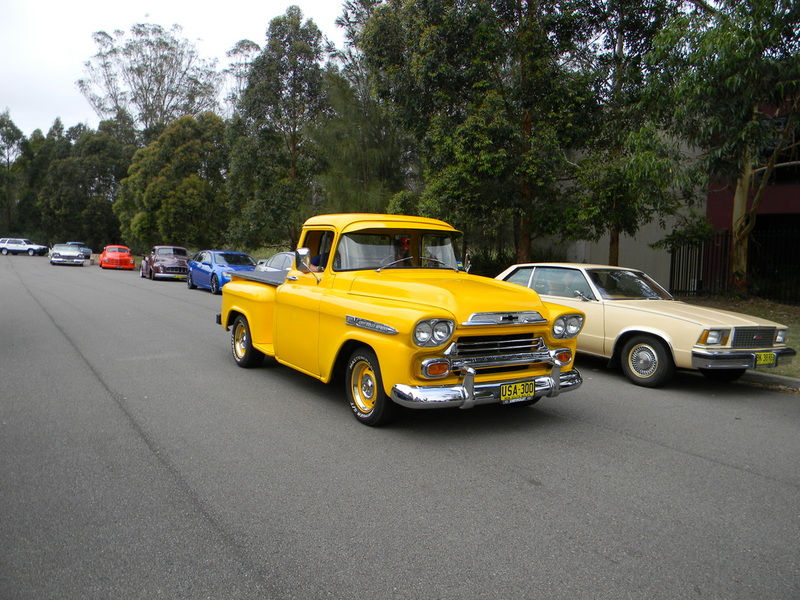 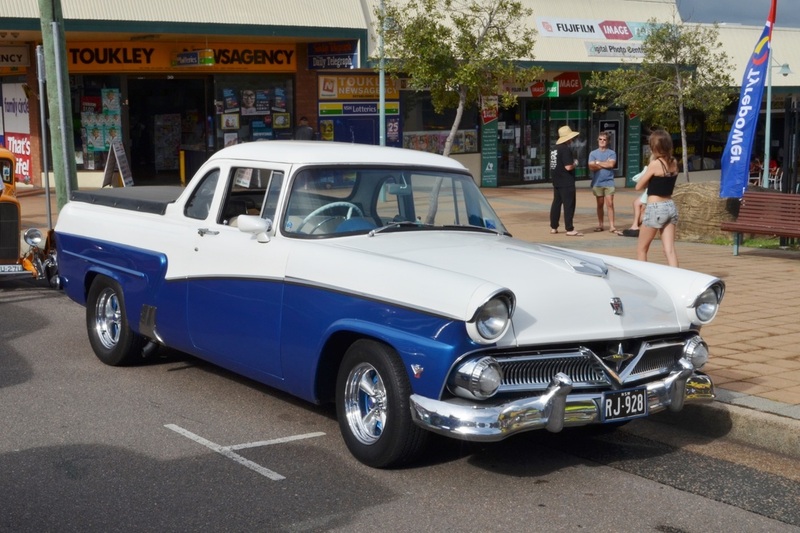 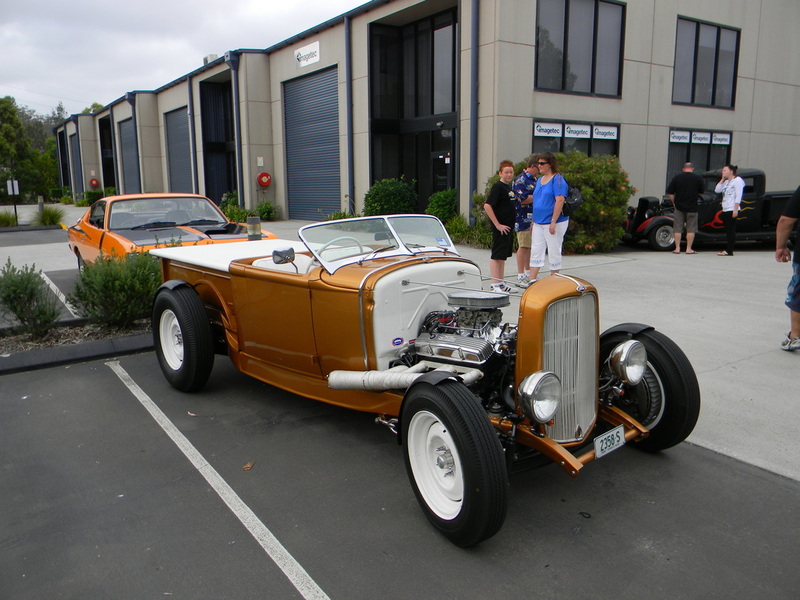 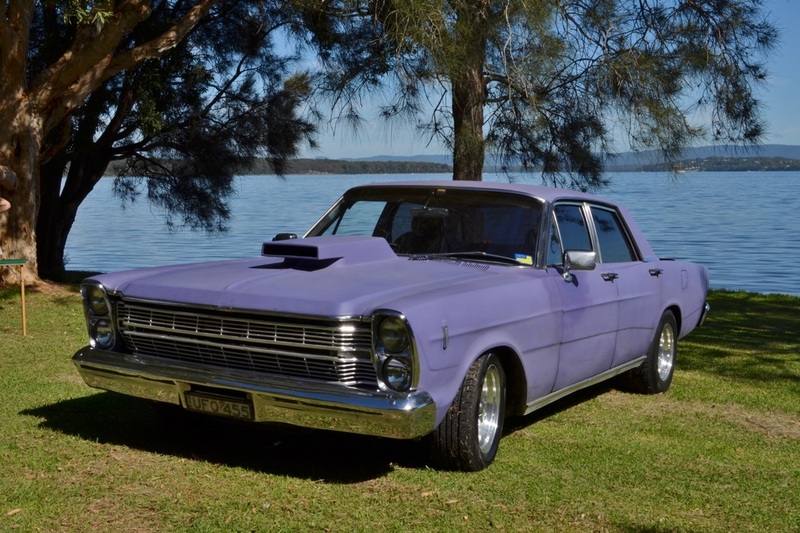 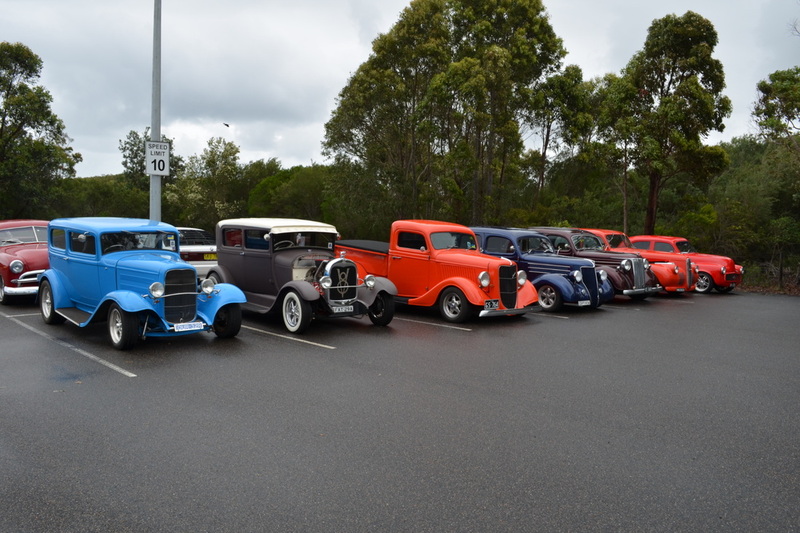 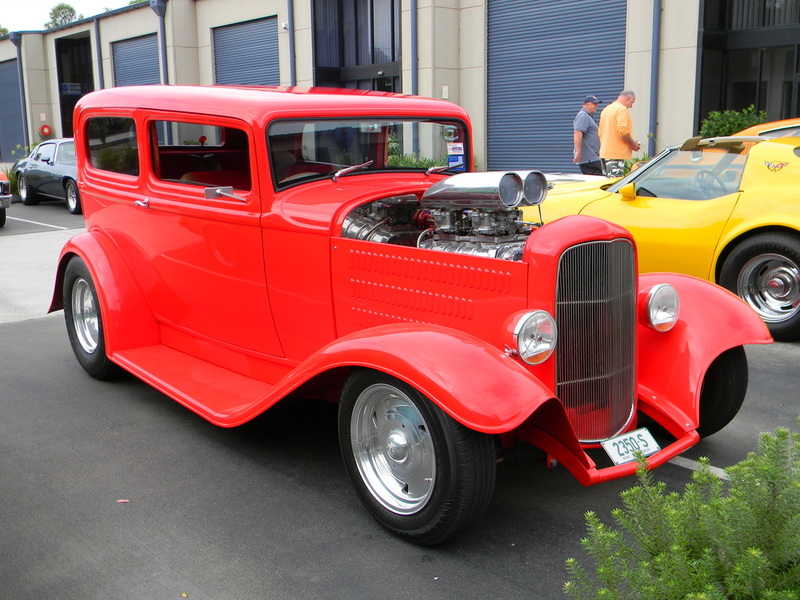 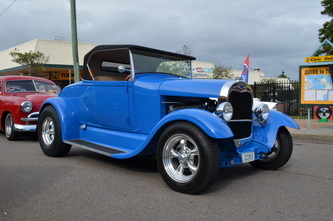 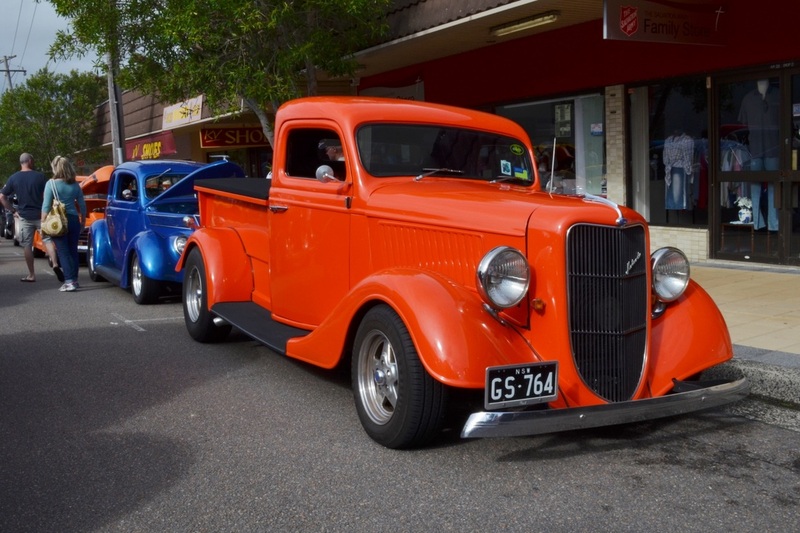 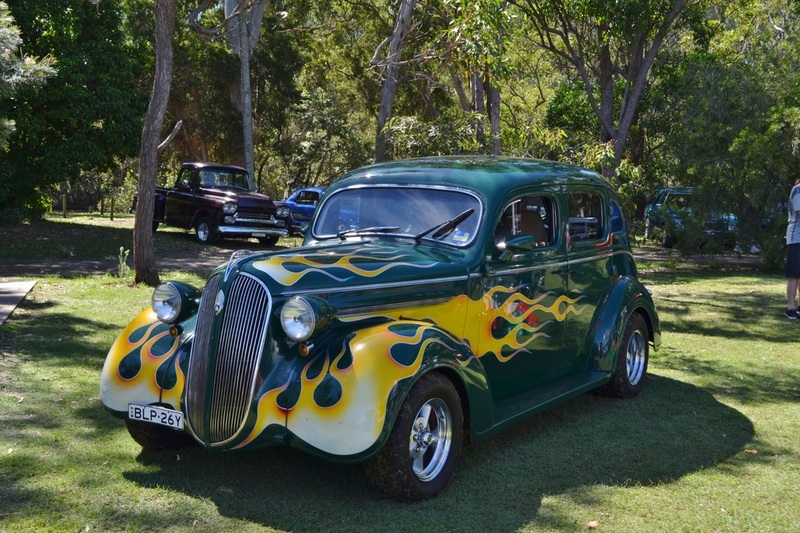 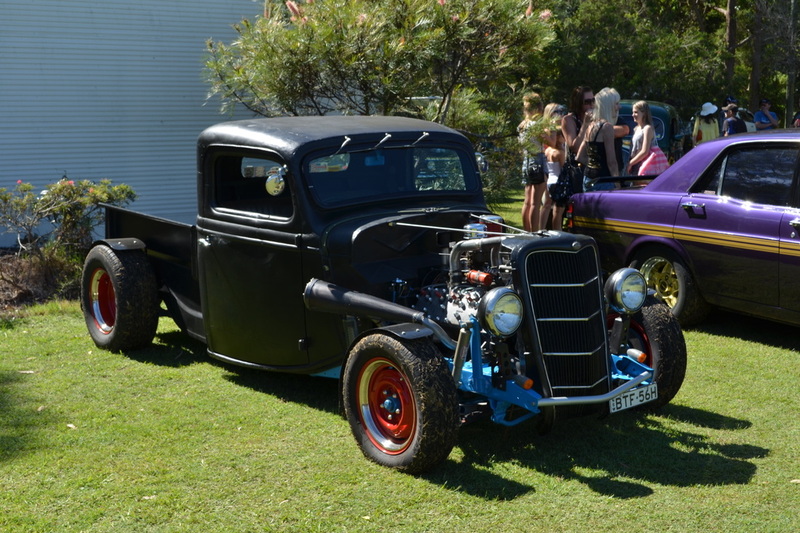 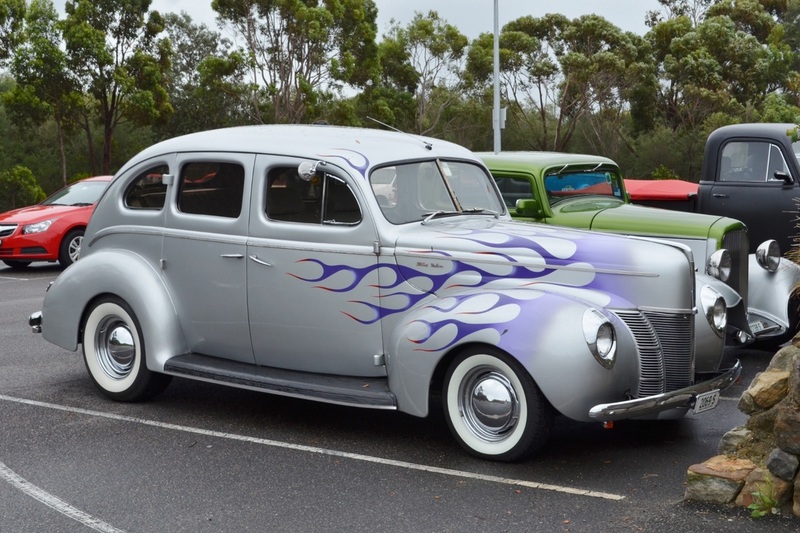 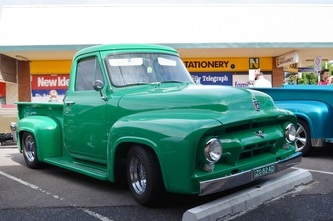 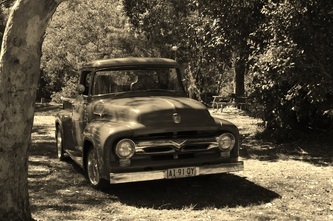 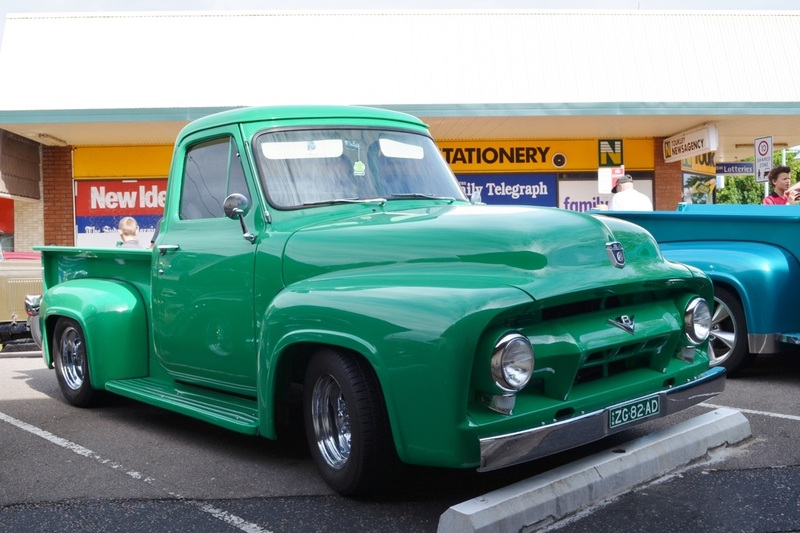 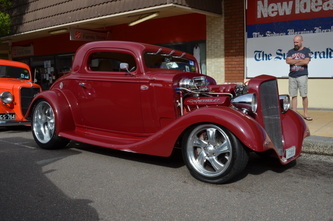 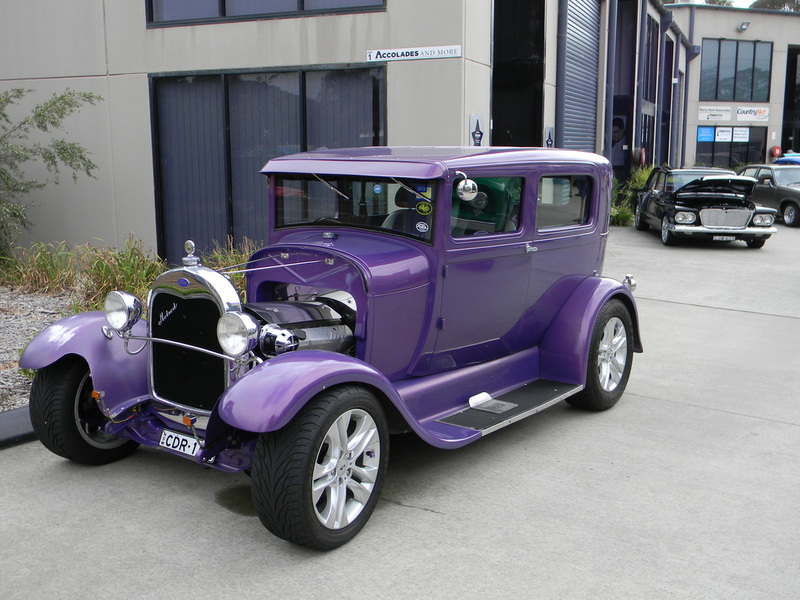 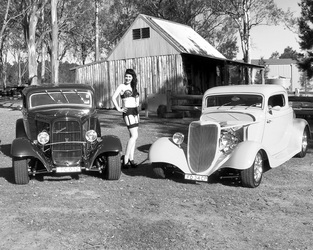 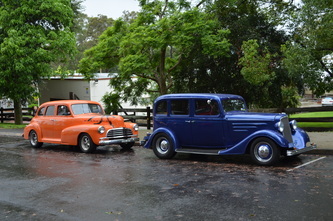 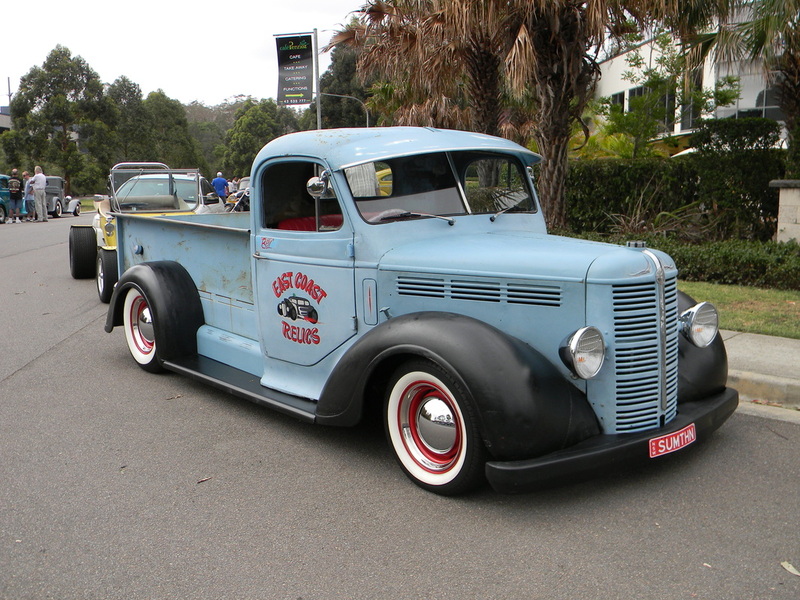 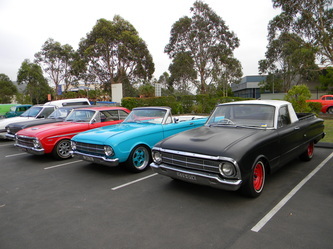 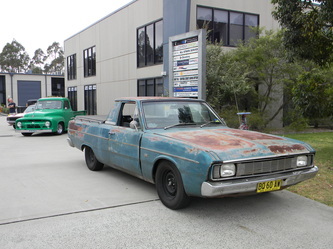 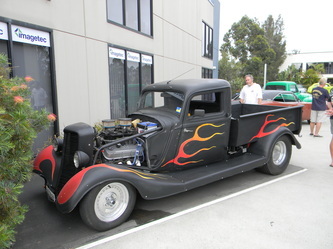 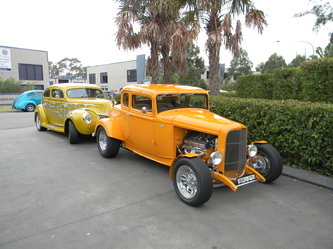 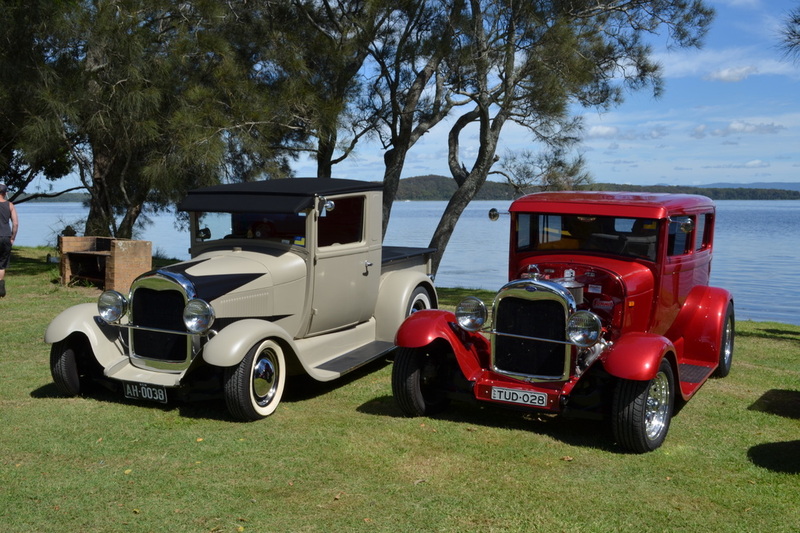 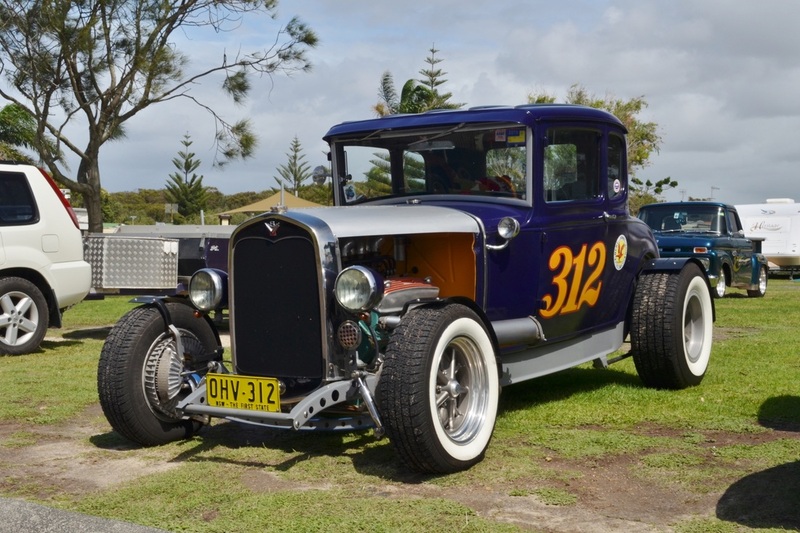 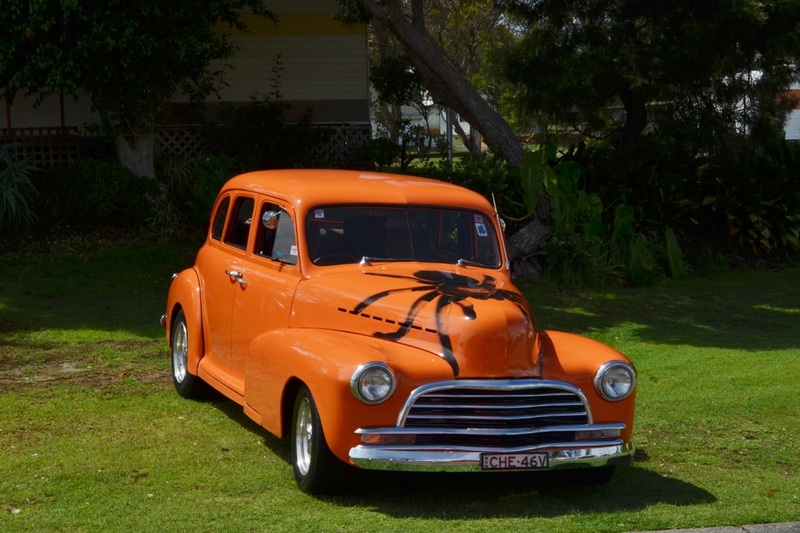 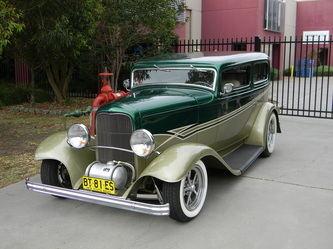 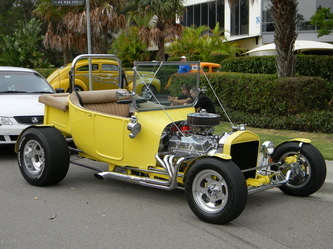 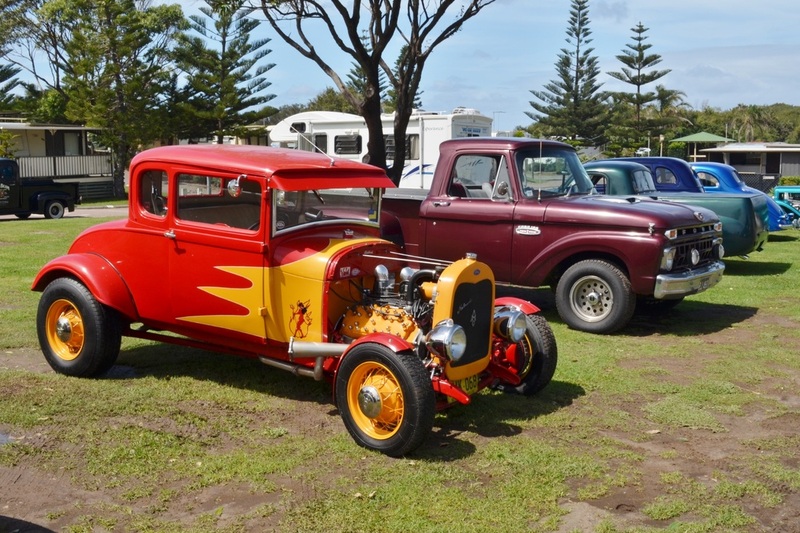 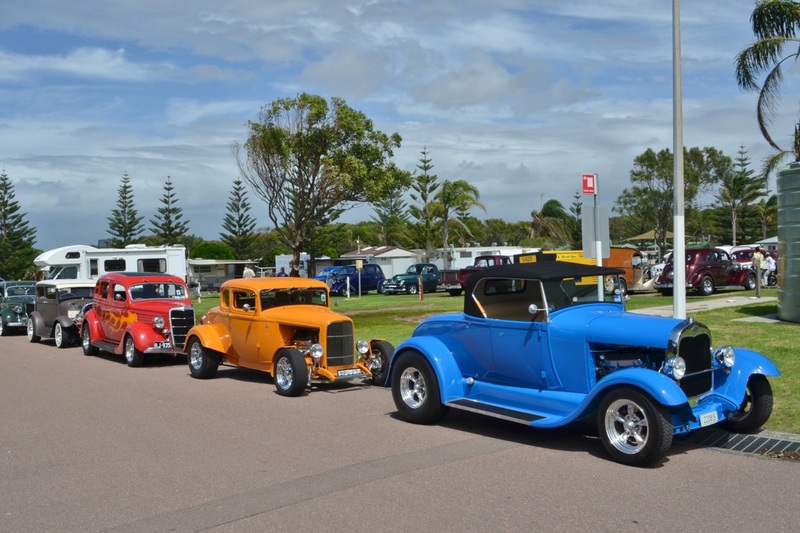 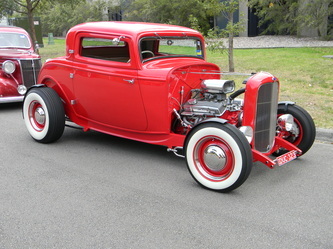 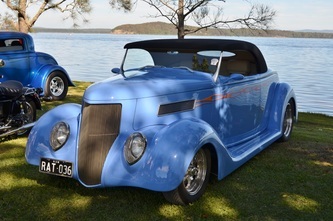 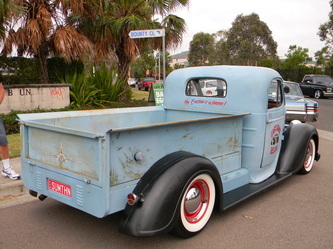 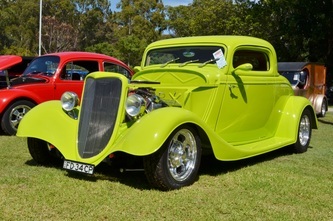 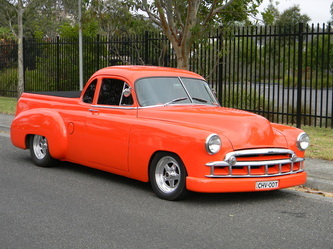 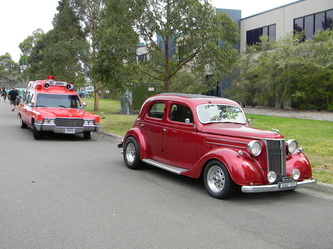 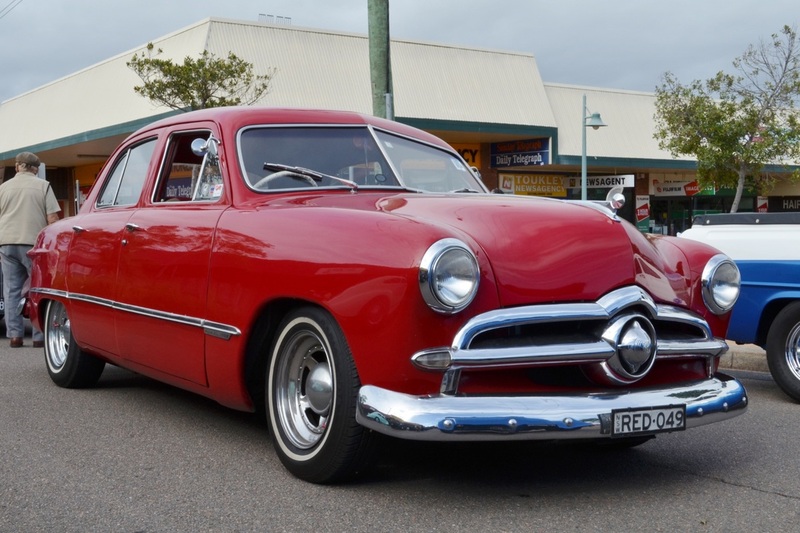 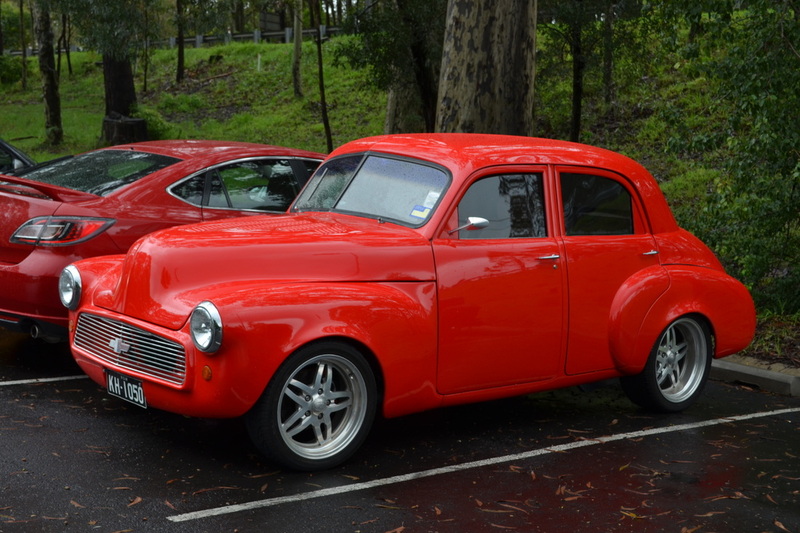 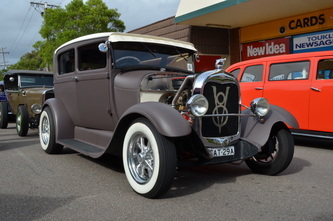 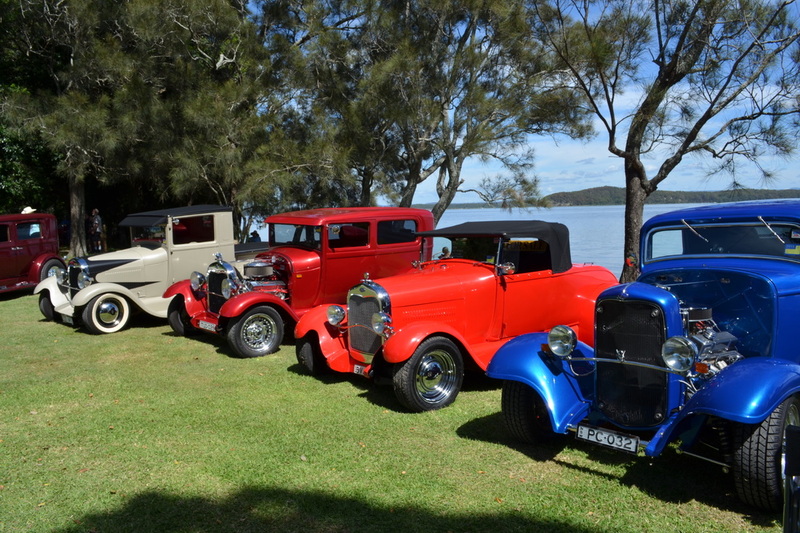 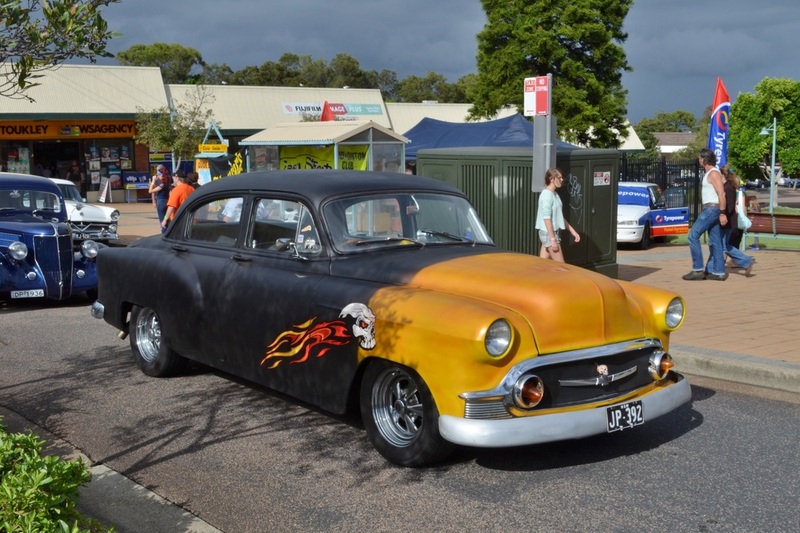 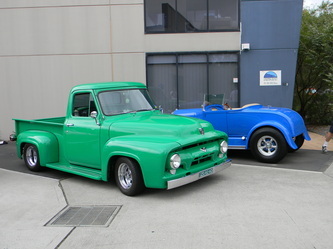 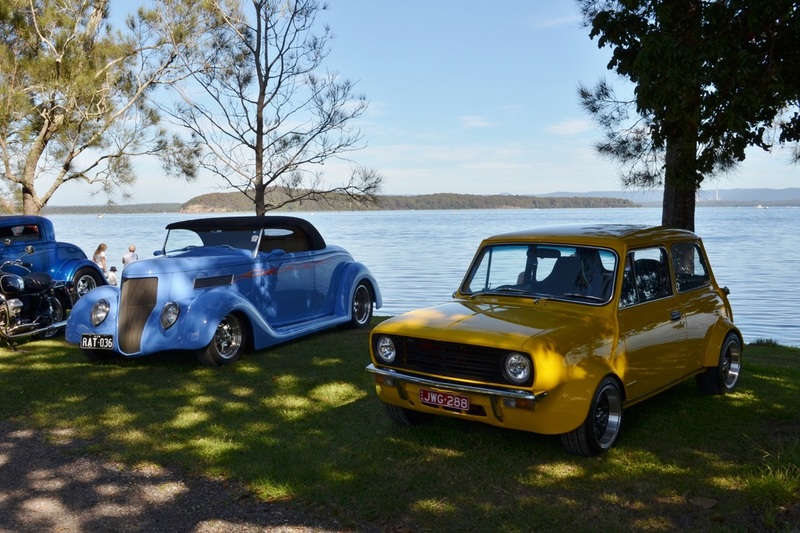 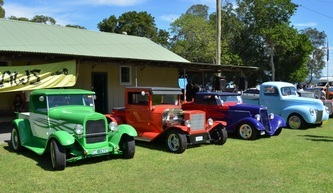 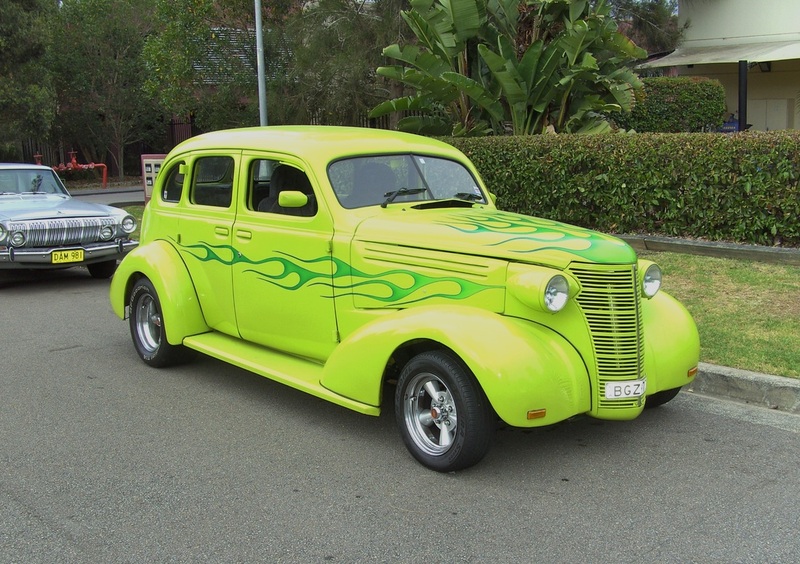 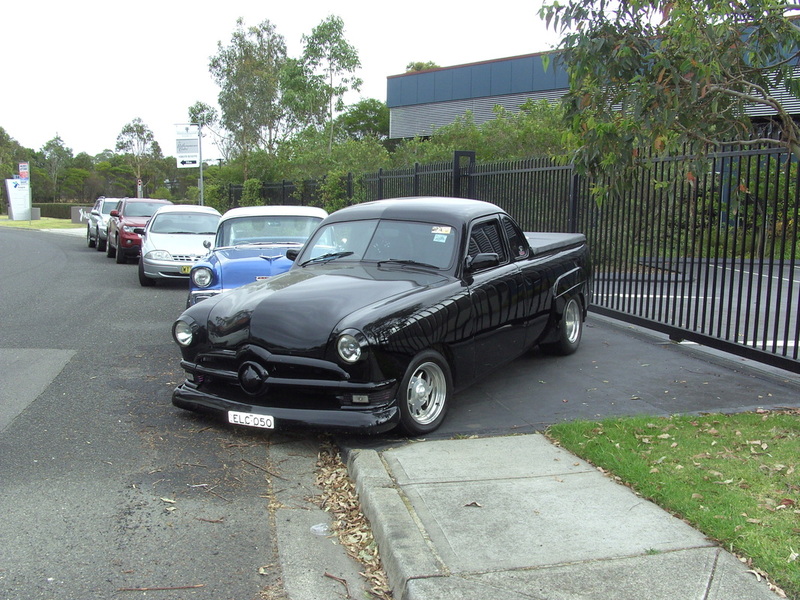 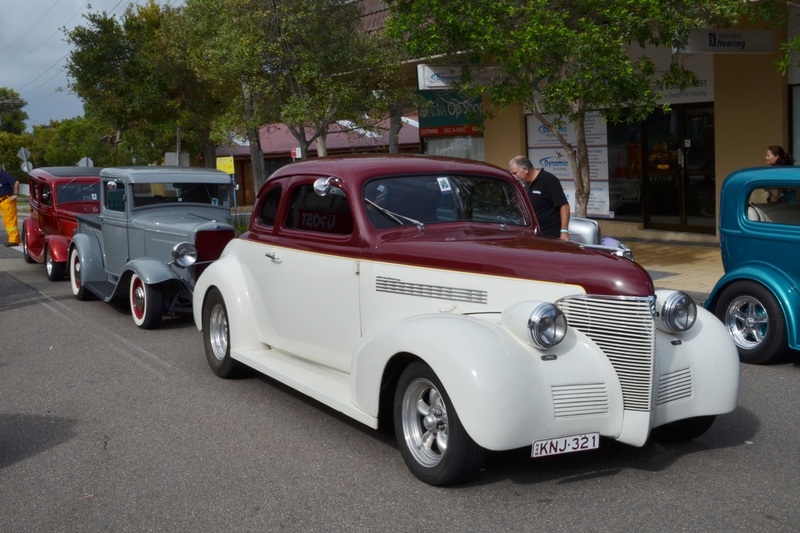 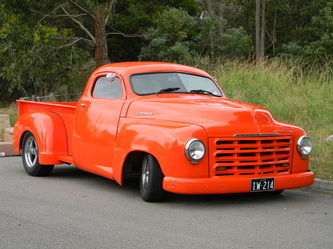 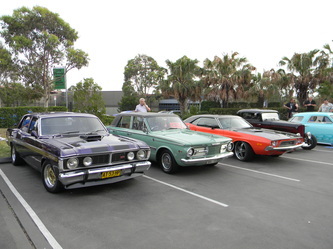 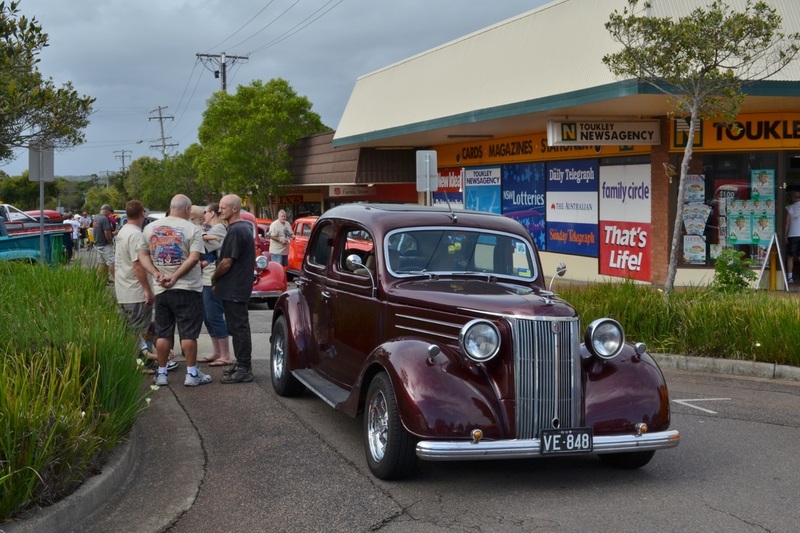 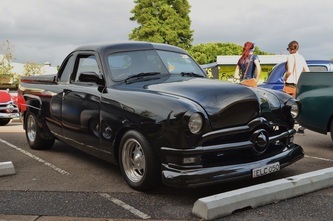 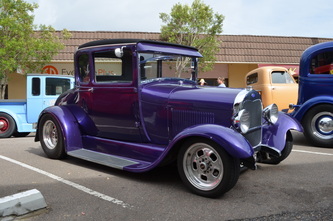 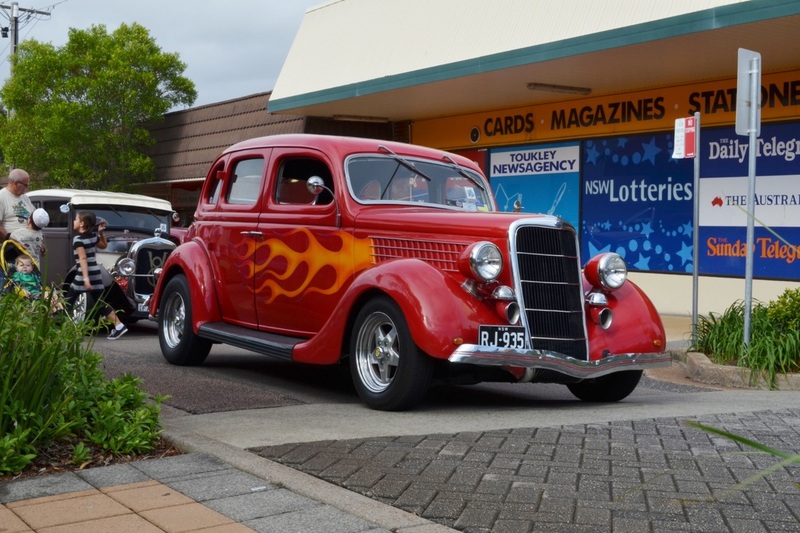 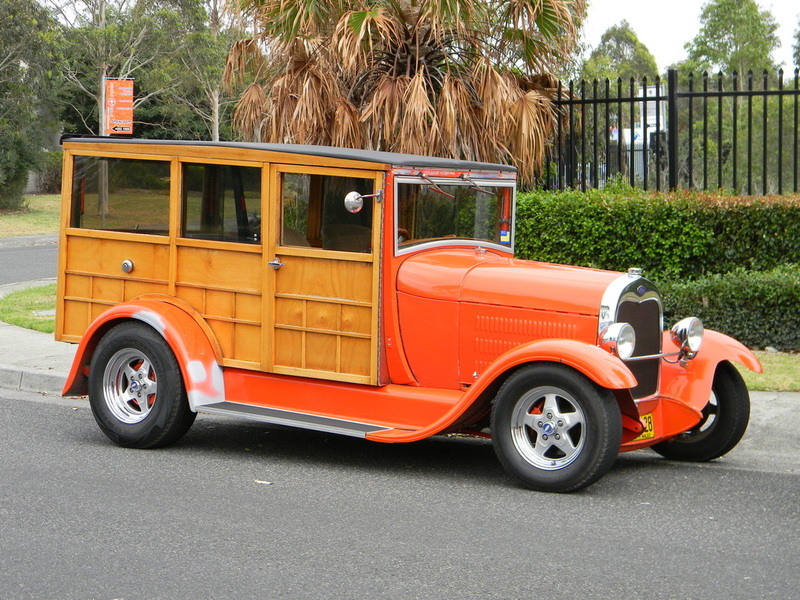 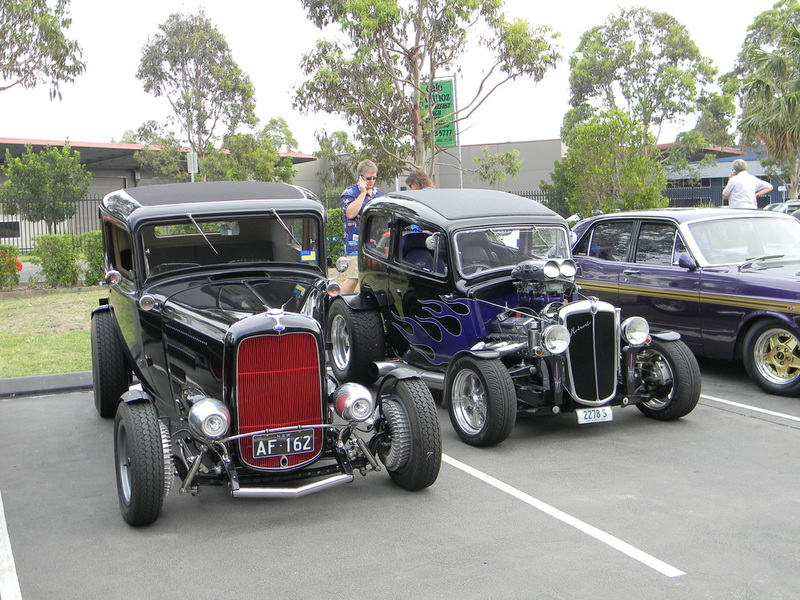 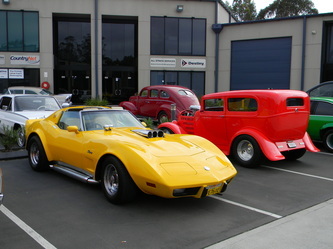 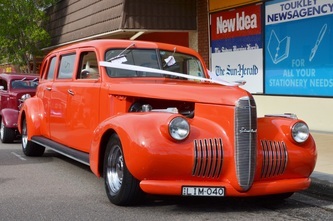 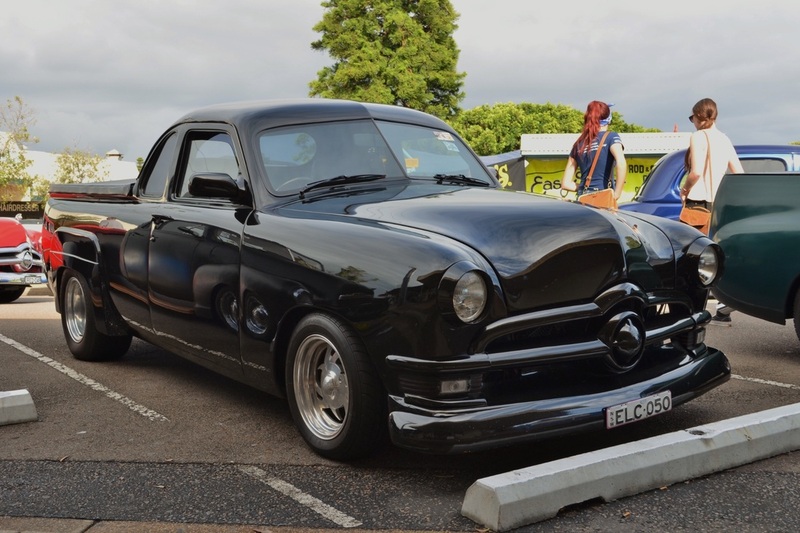 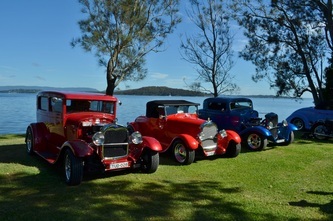 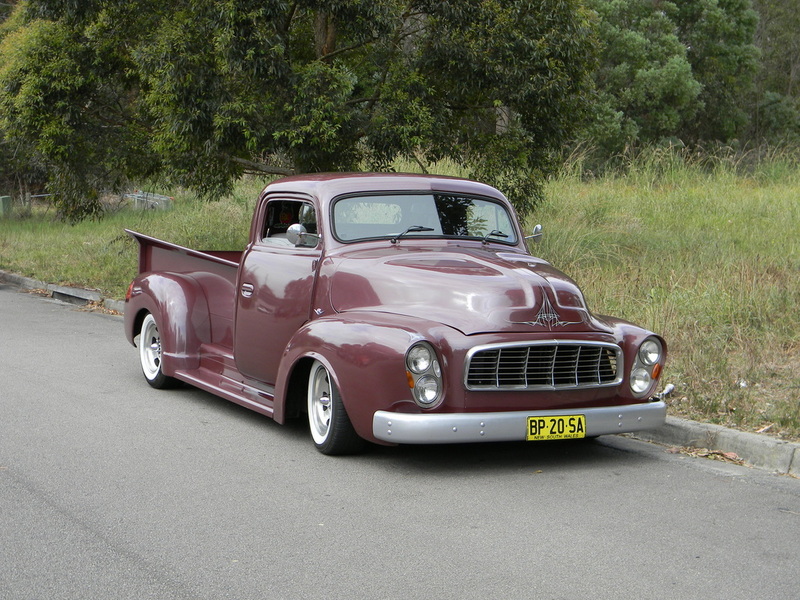 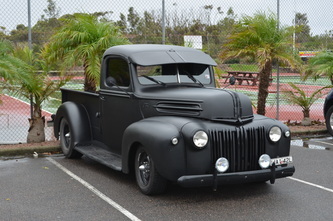 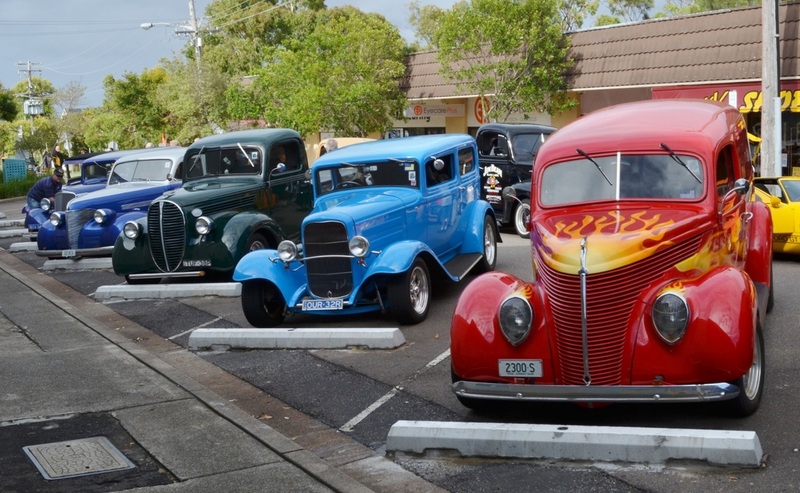 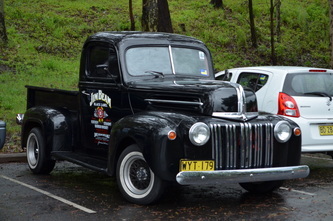 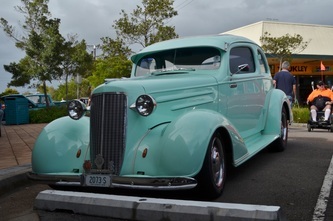 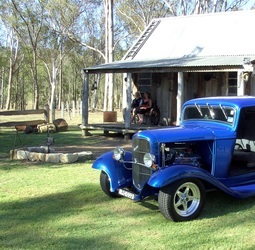 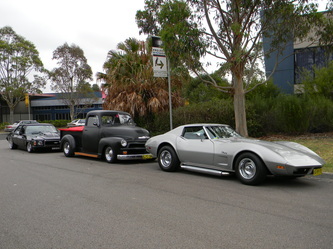 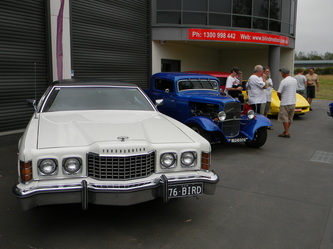 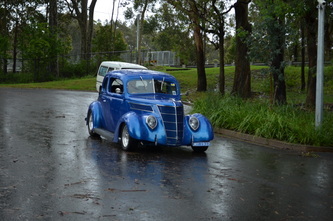 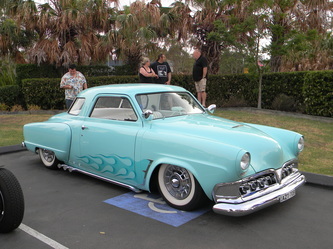 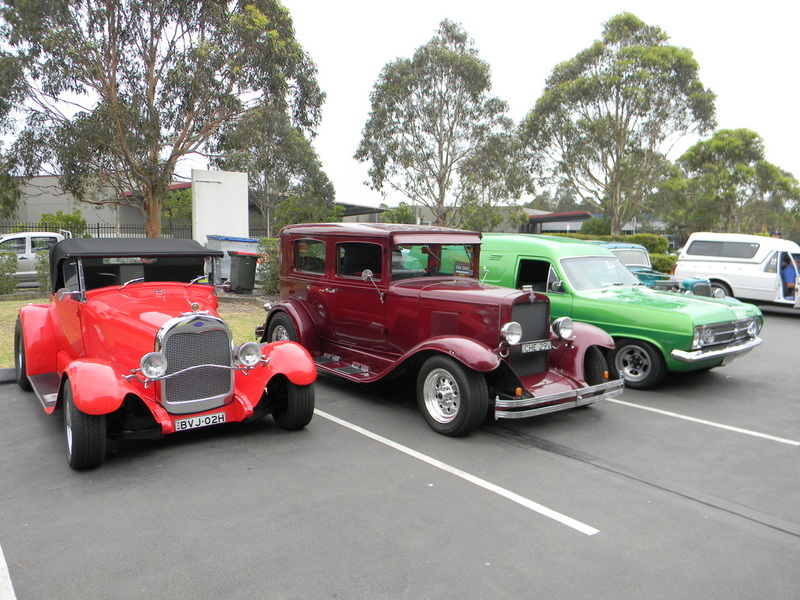 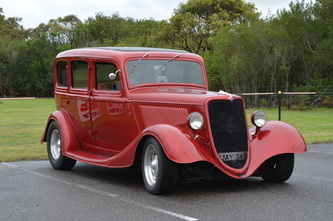 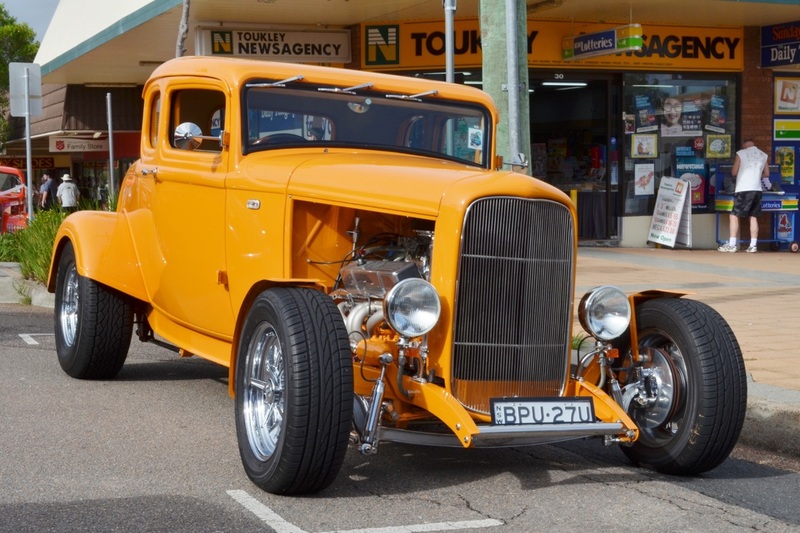 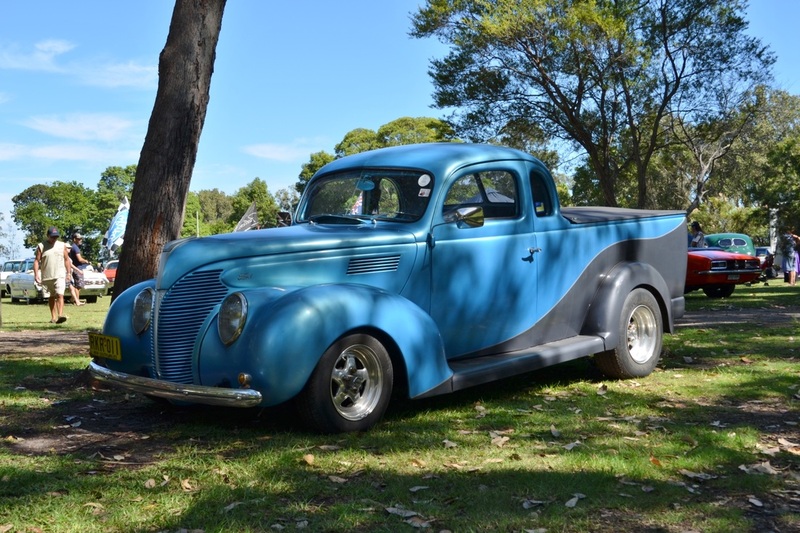 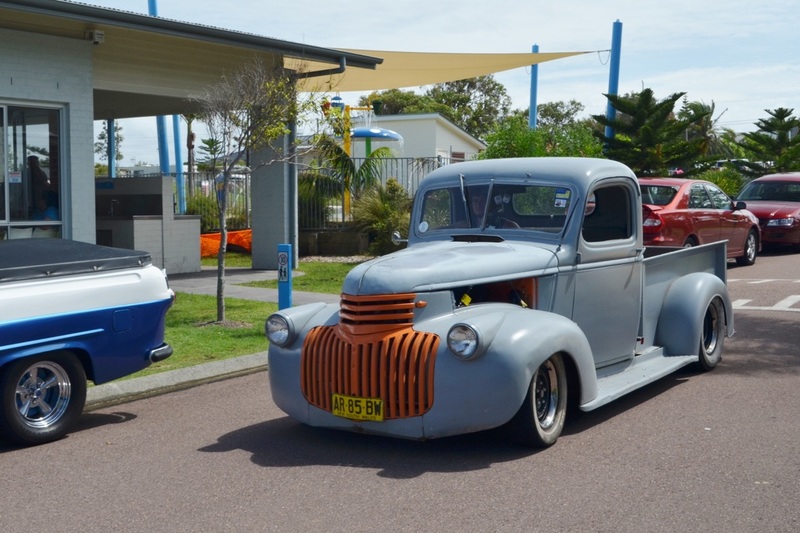 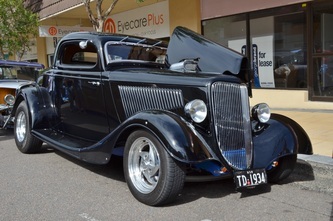 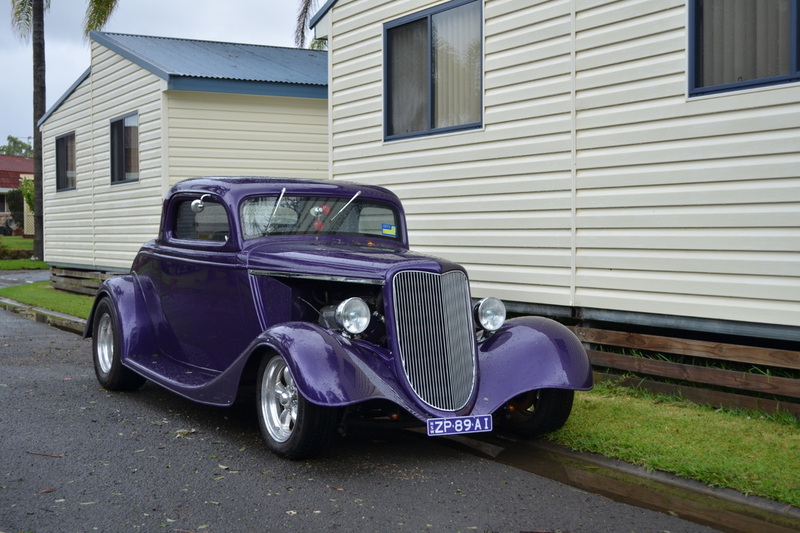 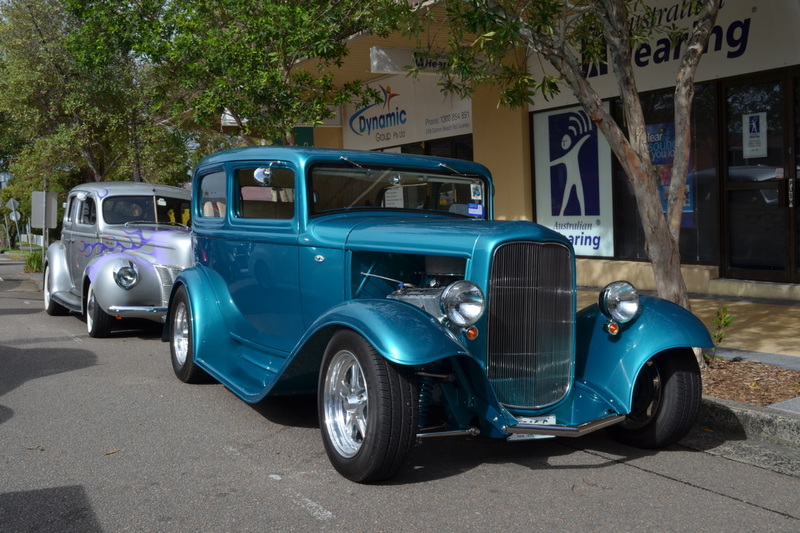 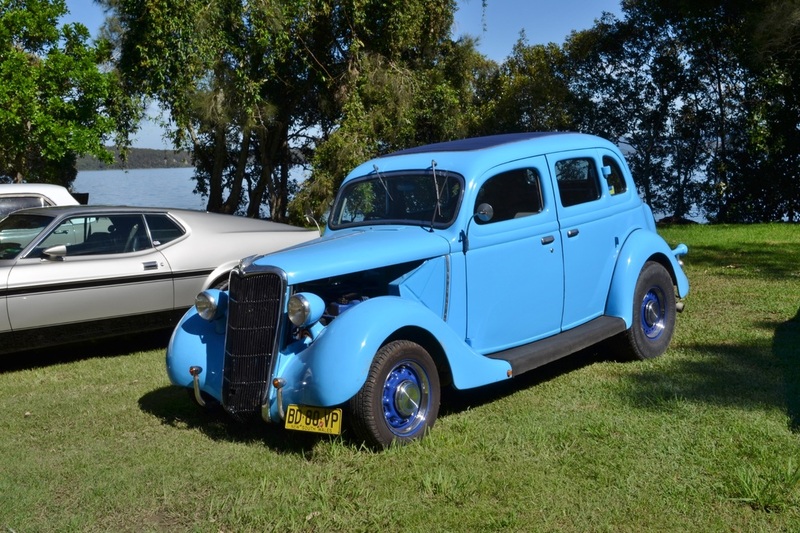 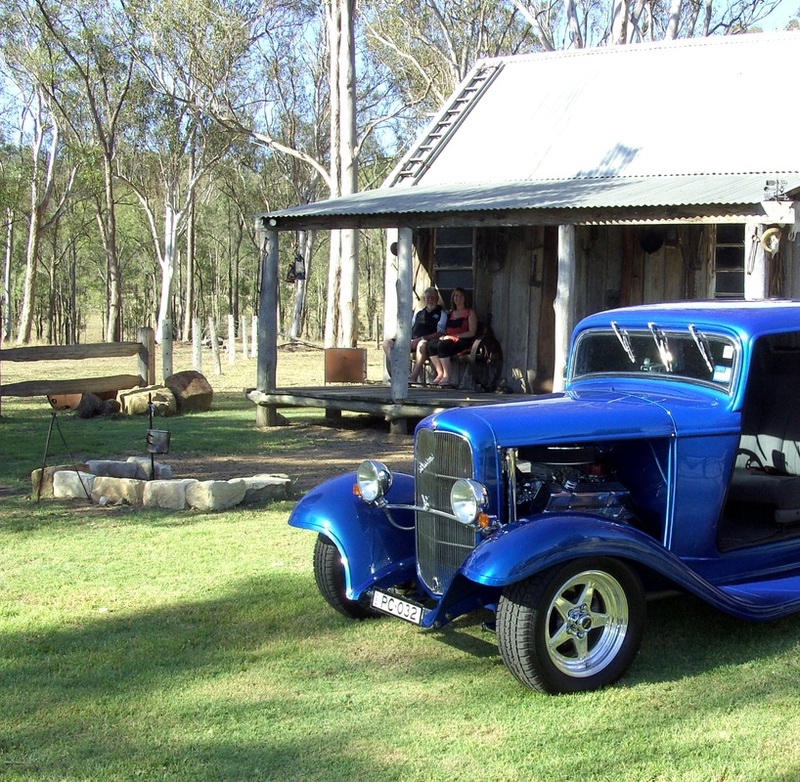 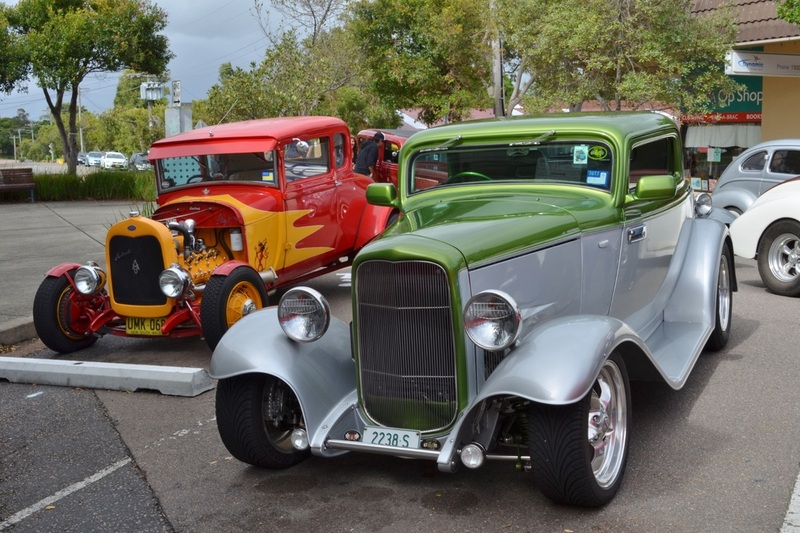 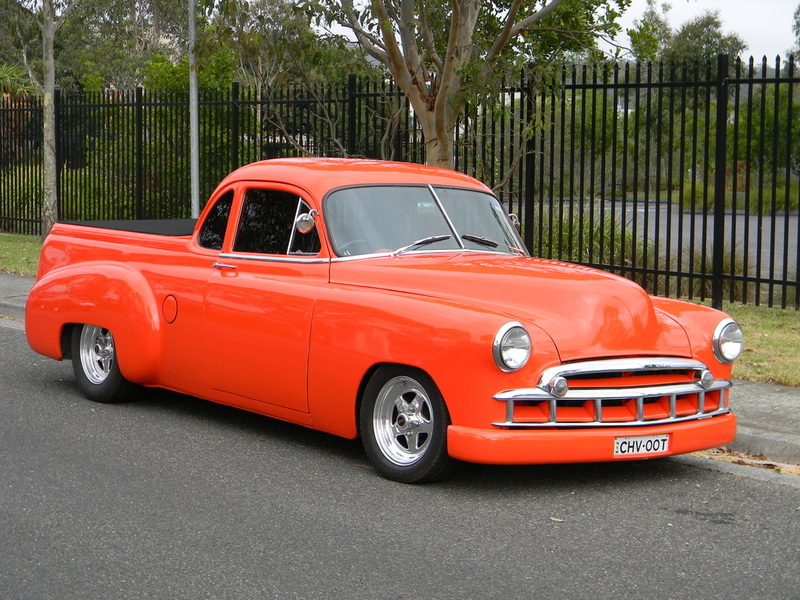 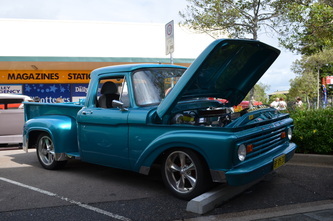 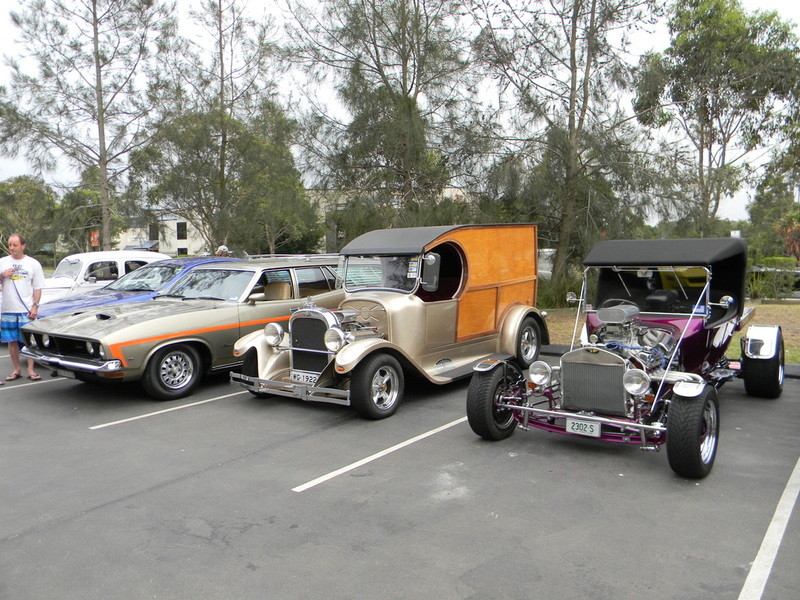 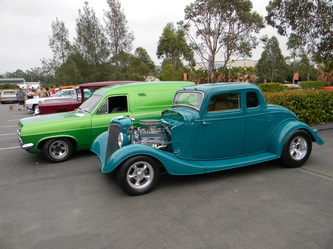 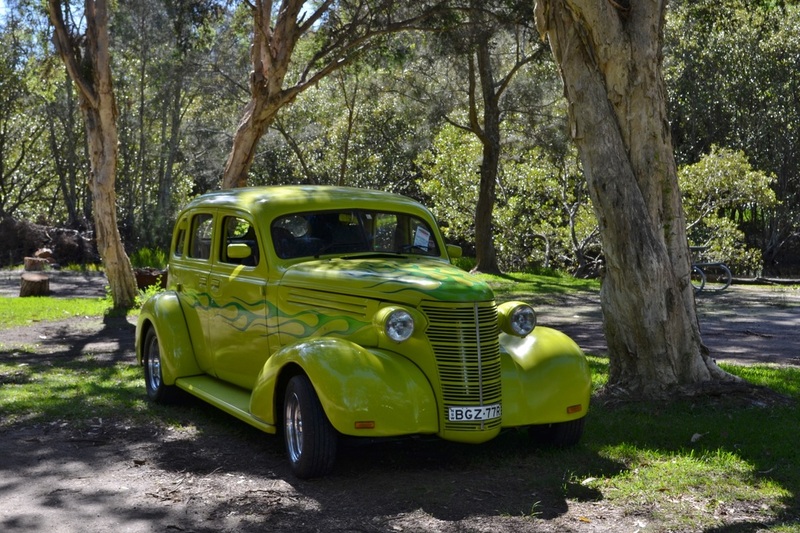 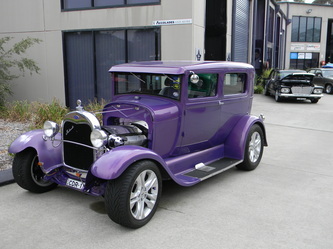 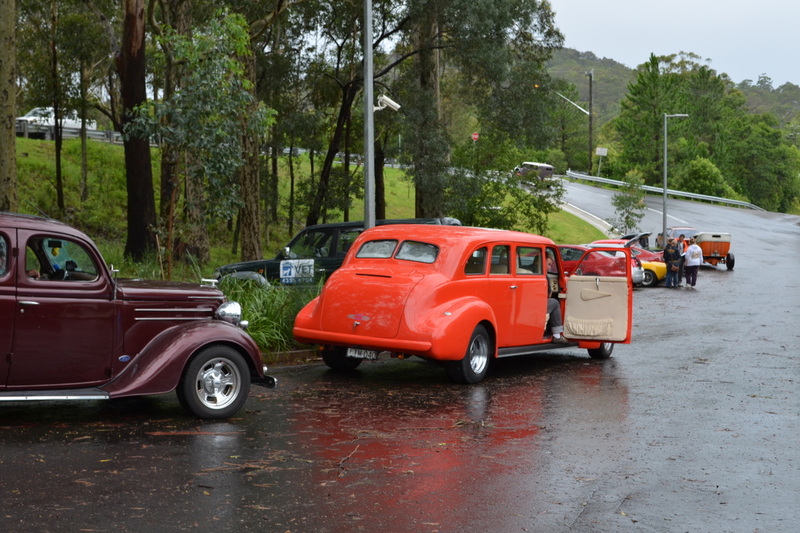 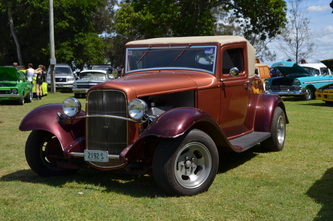 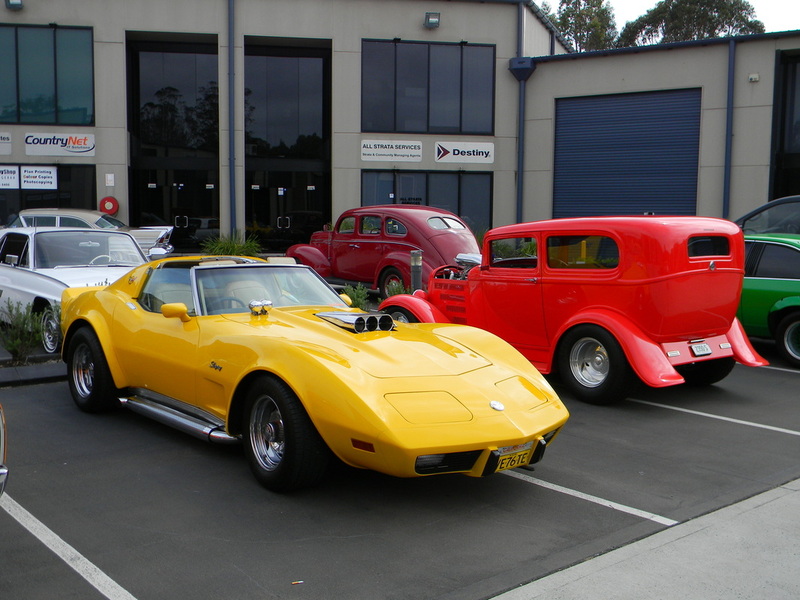 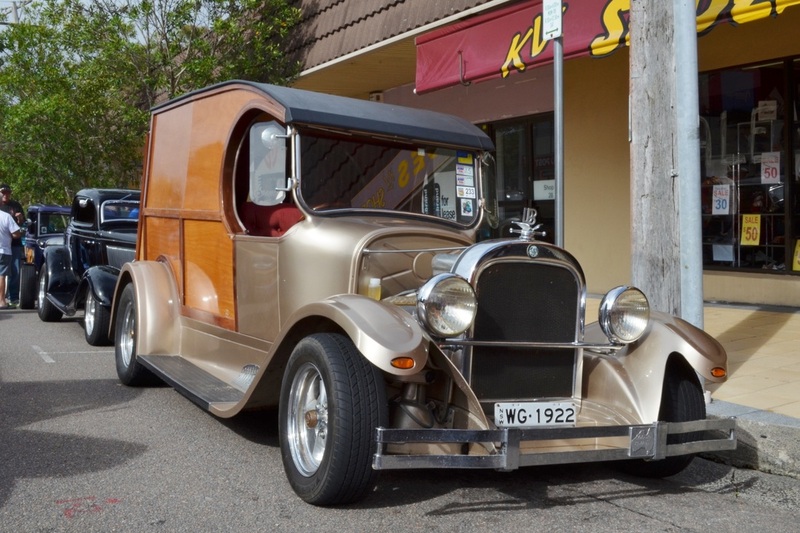 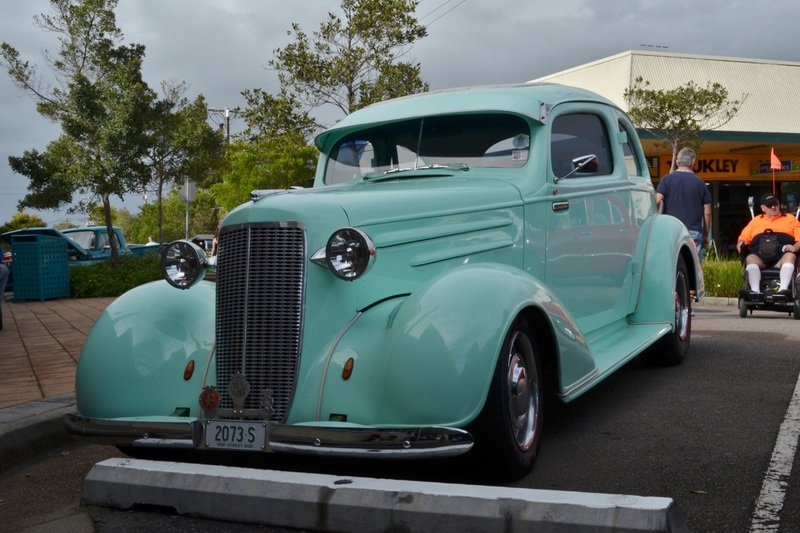 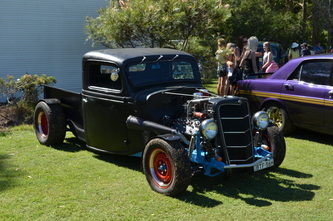 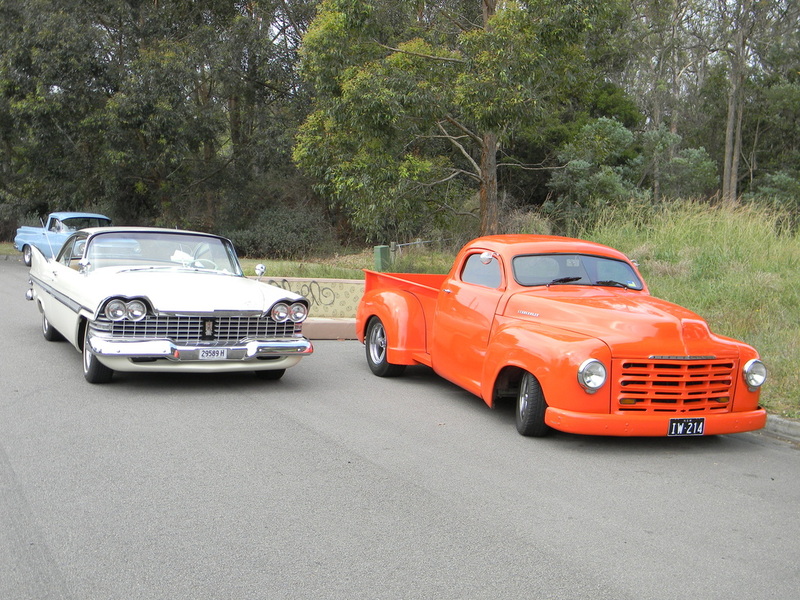 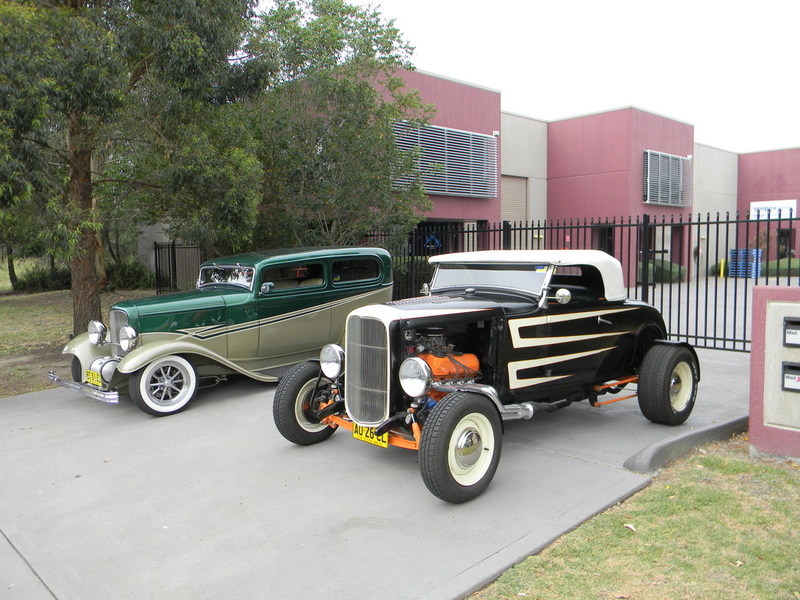 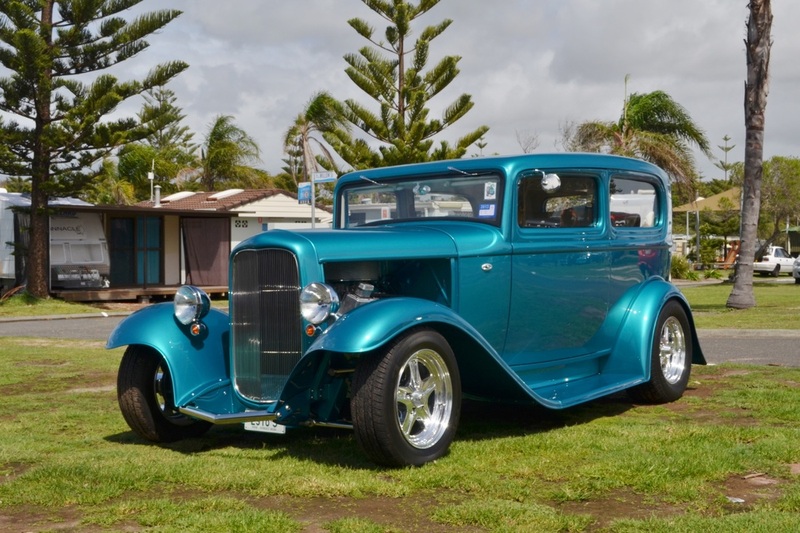 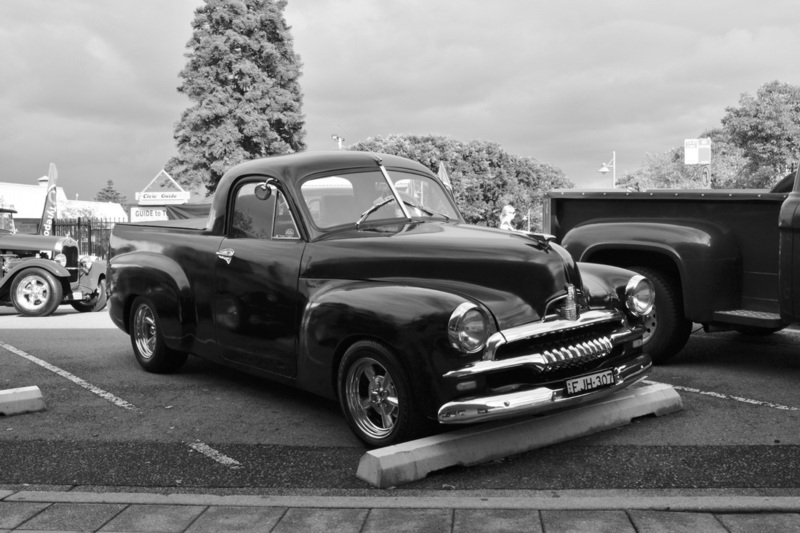 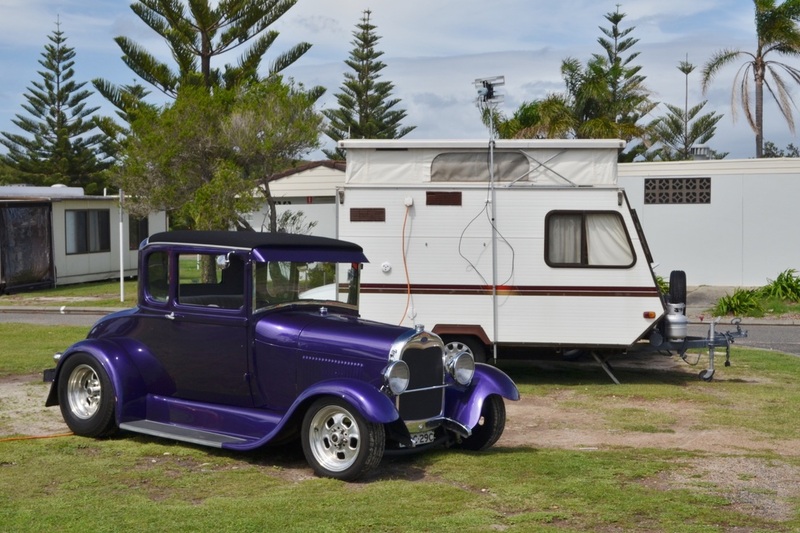 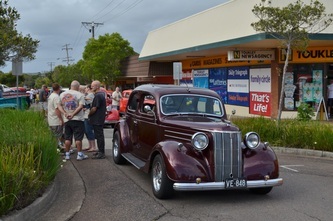 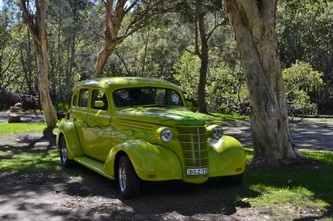 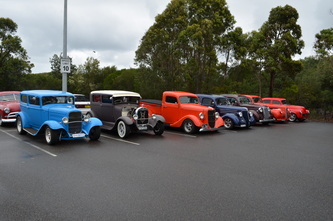 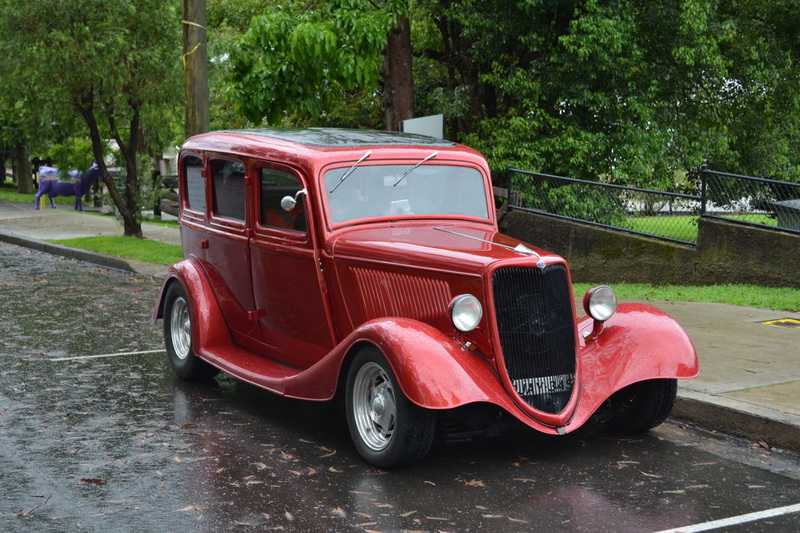 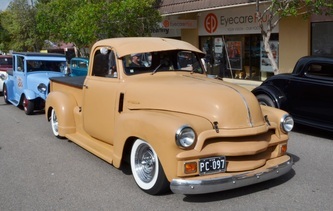 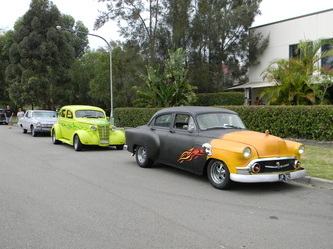 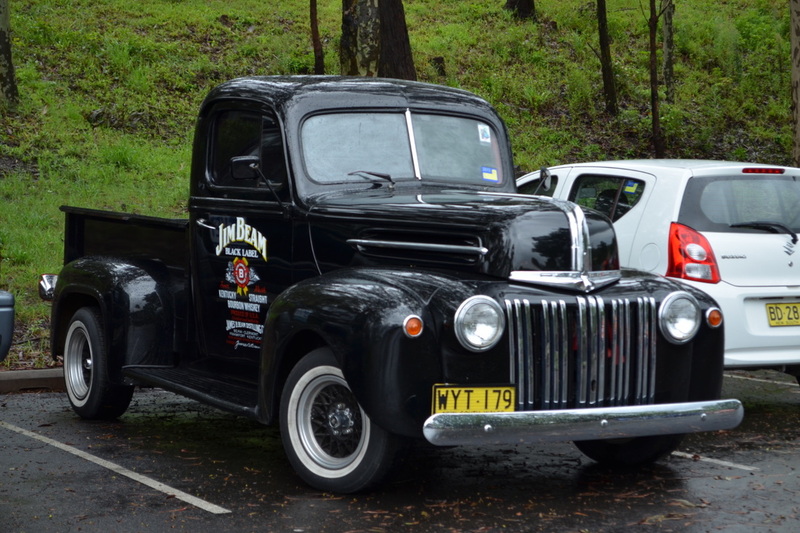 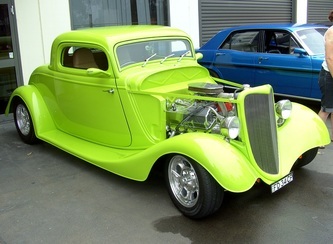 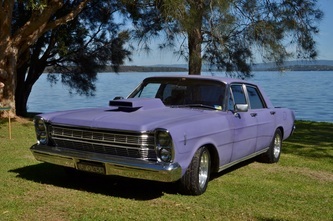 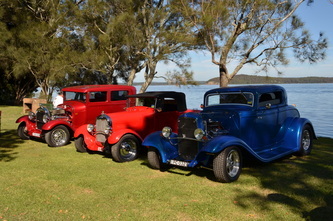 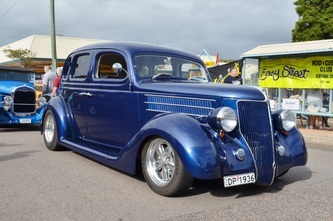 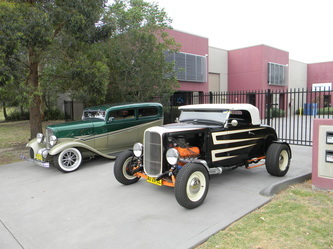 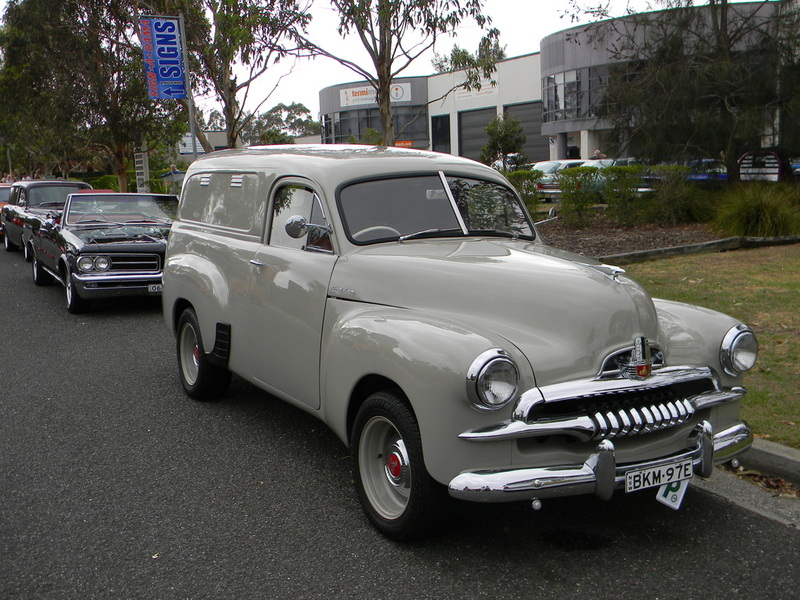 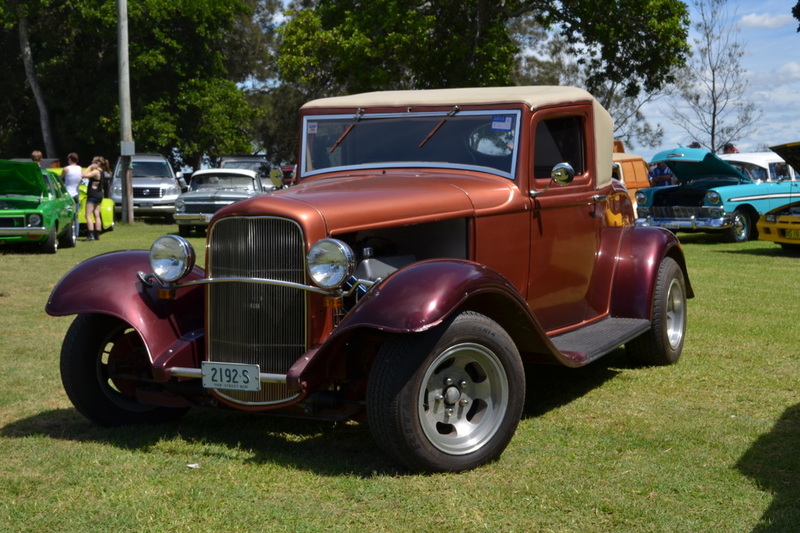 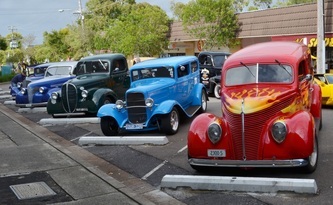 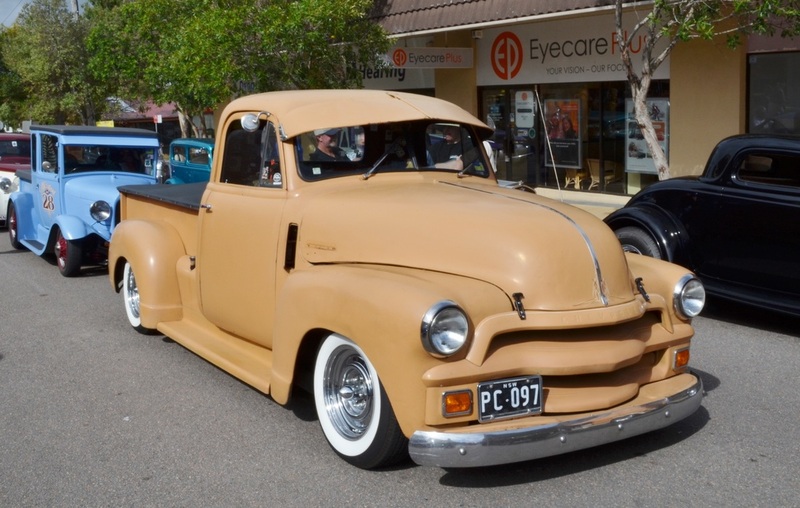 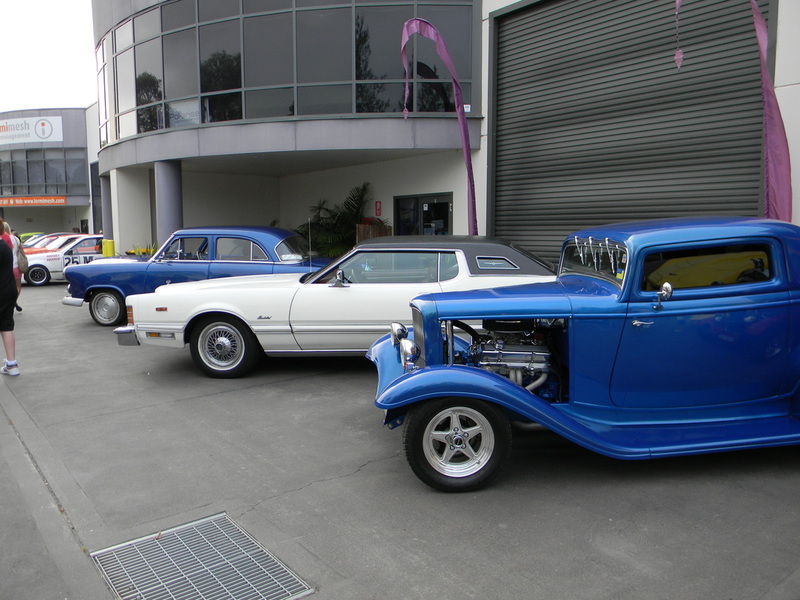 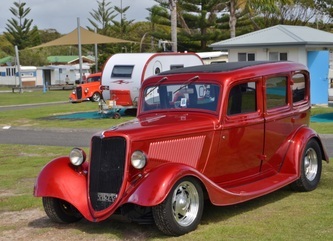 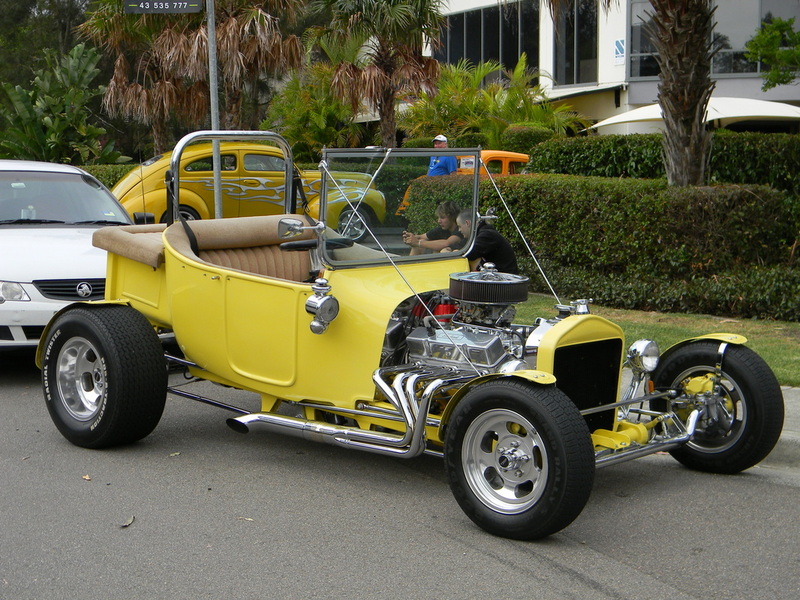 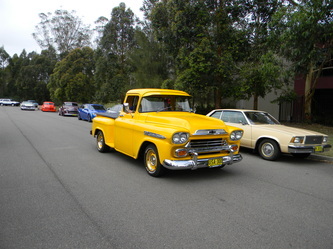 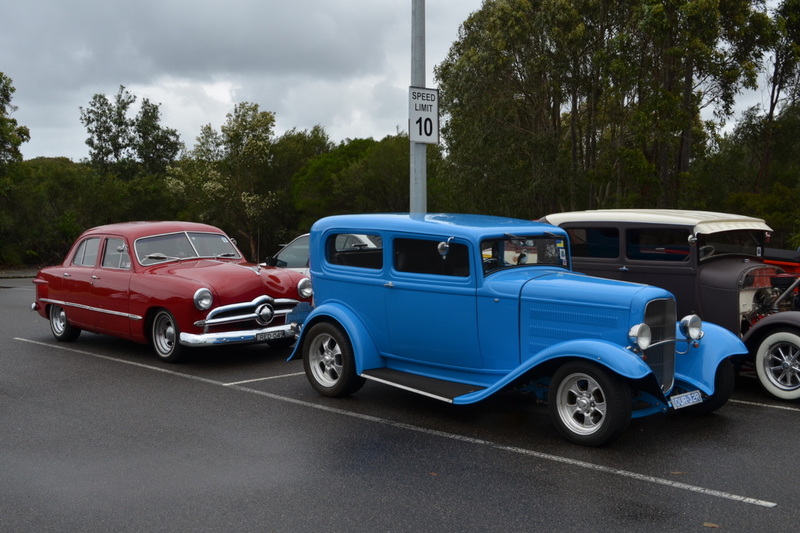 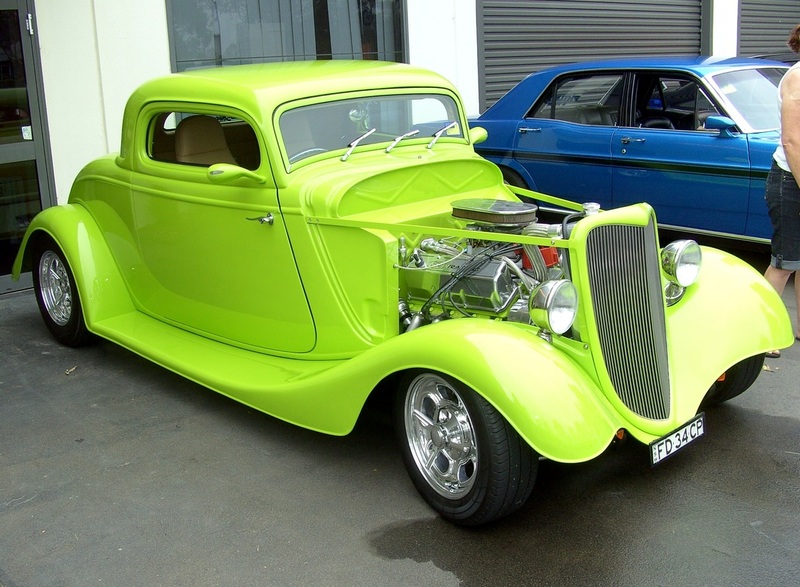 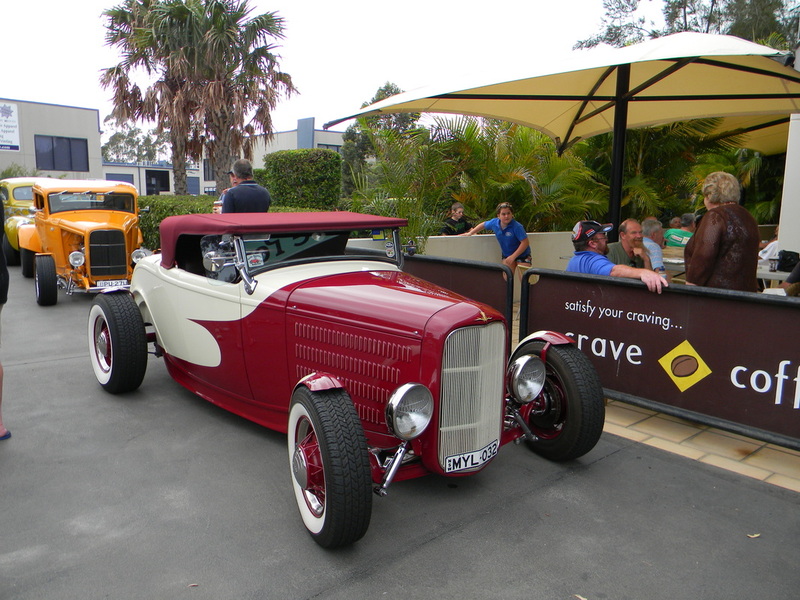 Each month a Hot Rod breakfast run is held at Café Pennoz which is in the Tuggerah Business Park on the Central Coast. 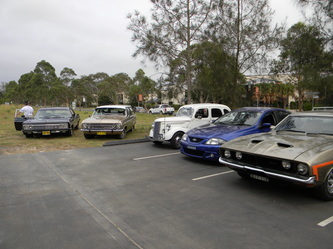 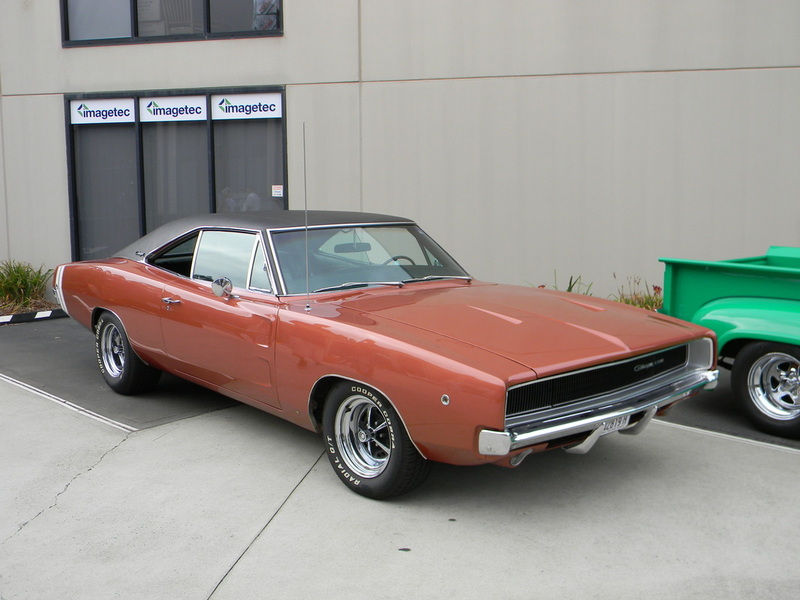 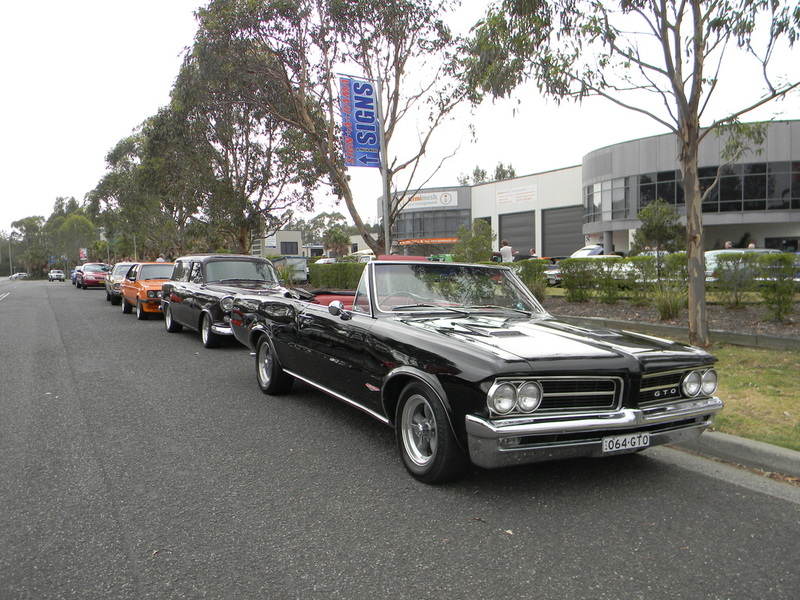 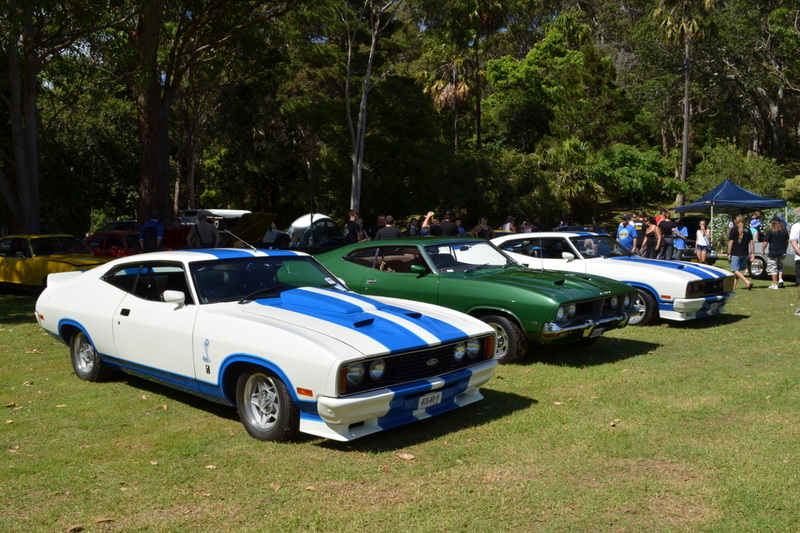 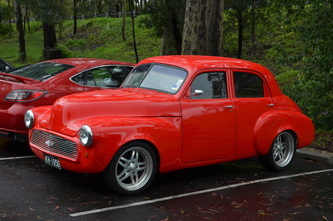 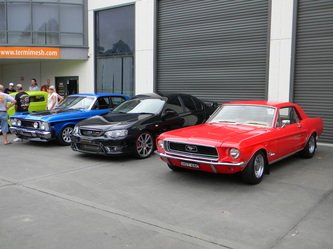 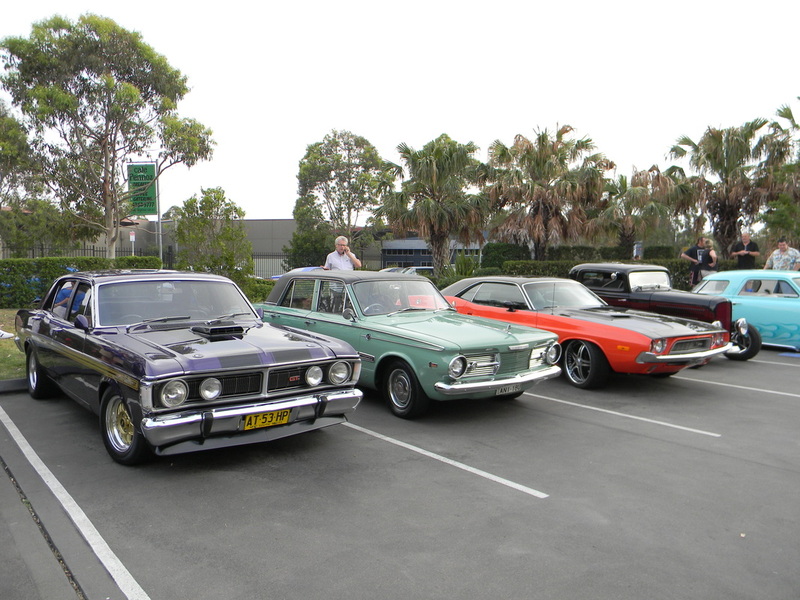 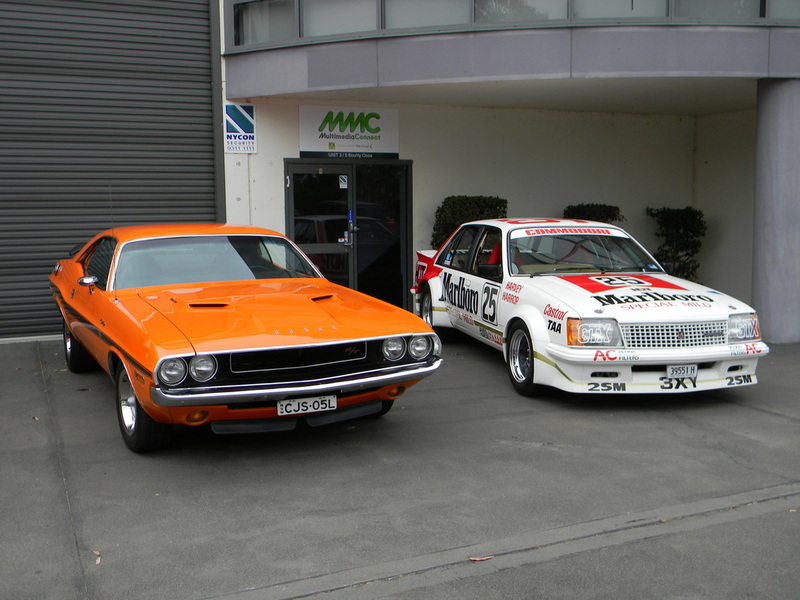 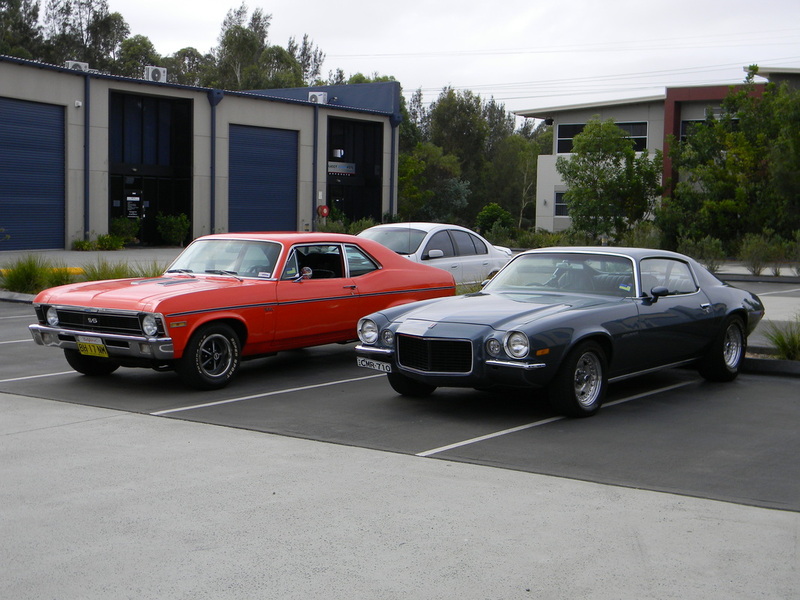 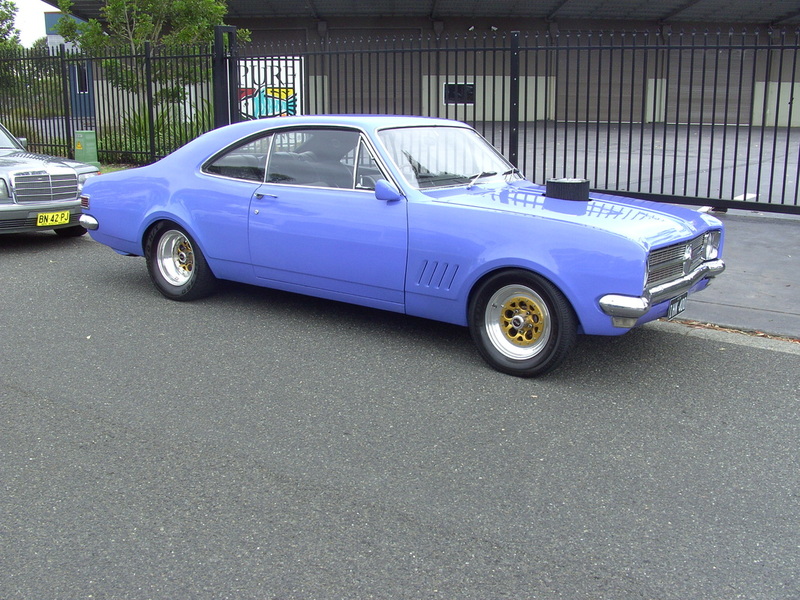 In January a great crowd turned up to the event and we had 15 rods and muscle cars travel down from Newcastle. 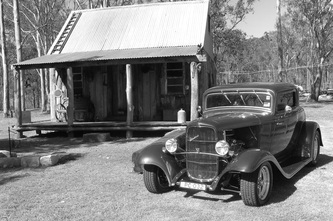 After Breakfast and a chat with other Rodders we travelled through The Entrance then onto the Catho pub where we had lunch. 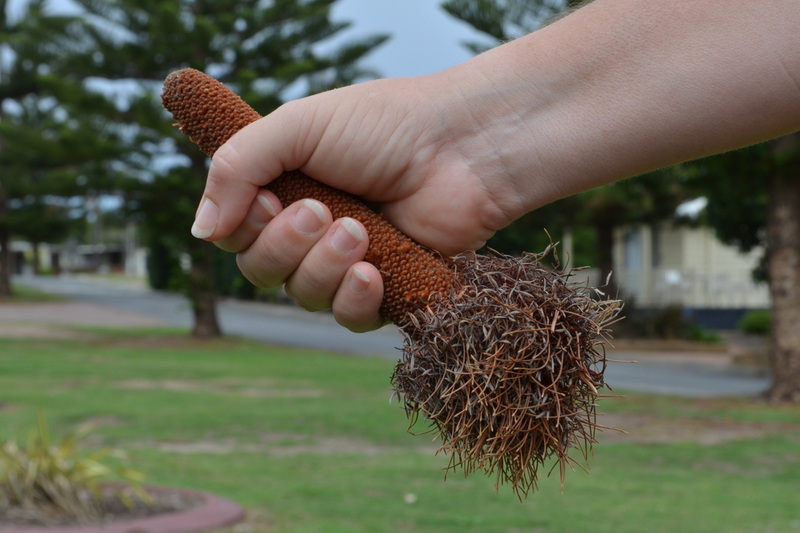 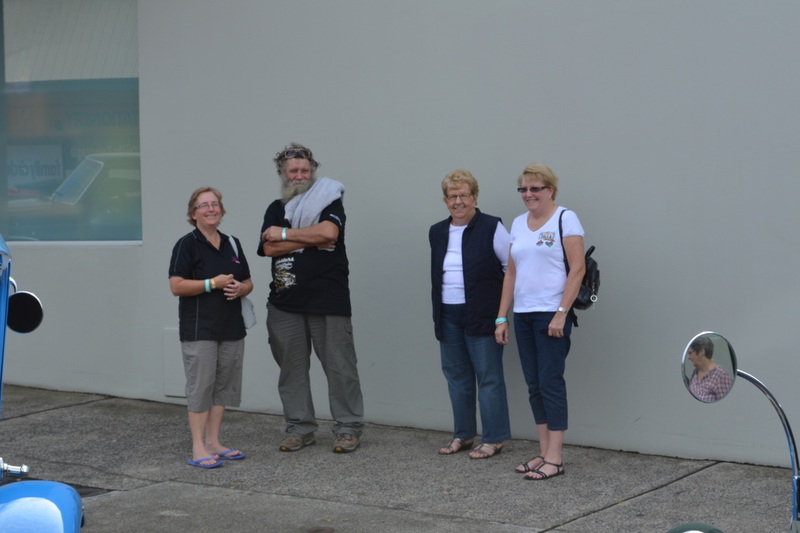 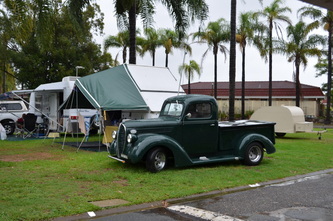 The Coasters Port Macquarie run this year was wet, wet and wet. 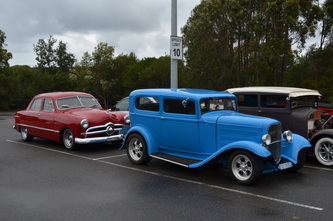 So poor was the weather that you could not get a camera out to take any photos but it was still a great weekend and the Coasters are to be congratulated on the way they looked after those that stuck the event out. 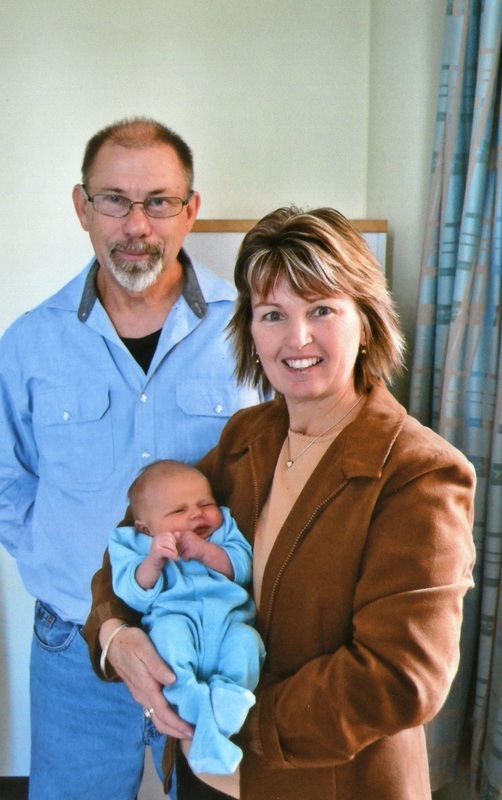 They fed us well with dinner Friday and Saturday nights, breakfasts on Saturday and Sunday and even lunch on the Saturday. The Saturday cruise was shortened and we went to the opening of Tyreright where Alan Moffett signed whatever was placed in front of him. 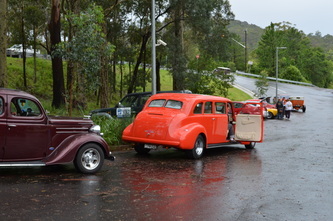 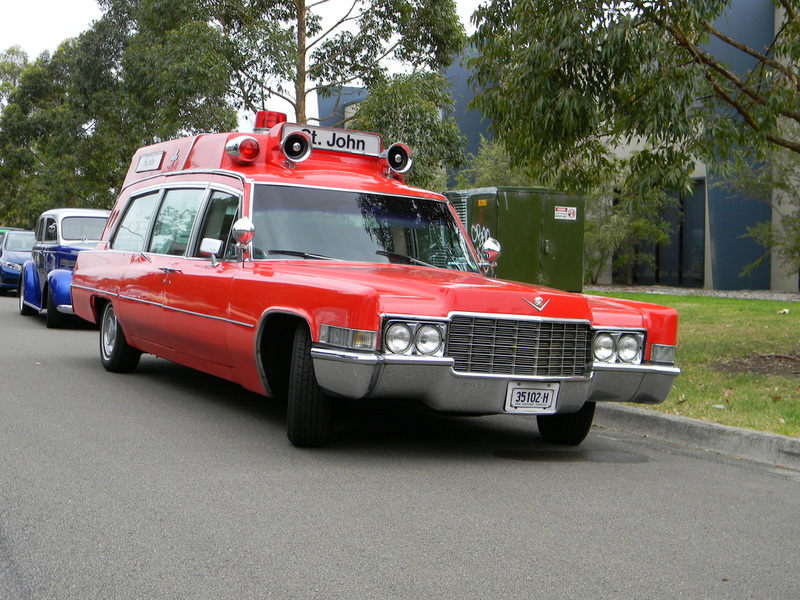 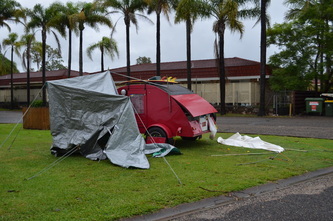 The Show and Shine was cancelled as the SES who run the event were busy saving everyone from floods. 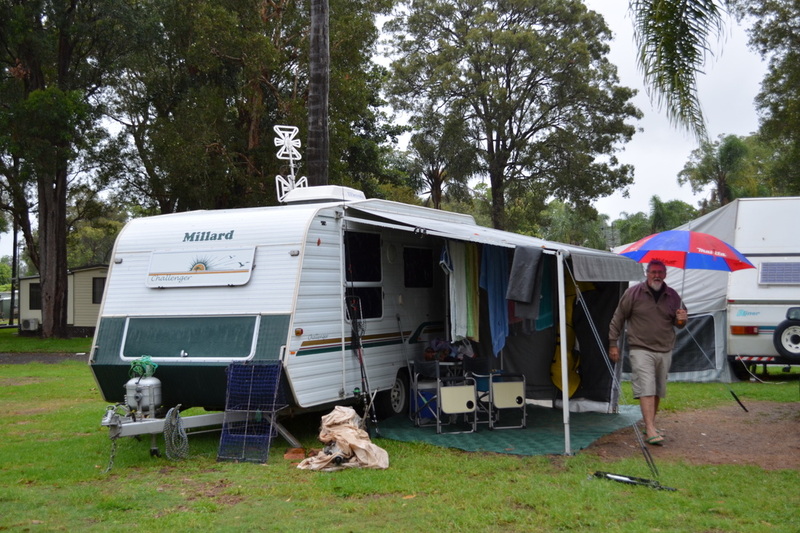 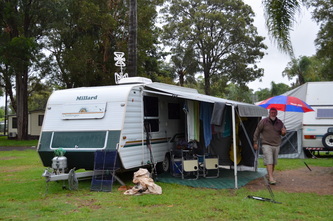 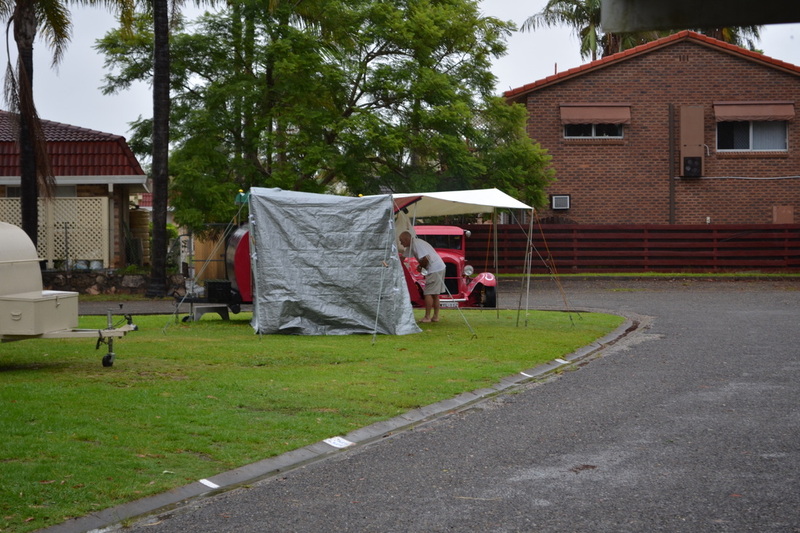 Barry once again entertained us as the pictures show his campsite before the Friday night deluge and as he awoke to the site on Saturday morning. 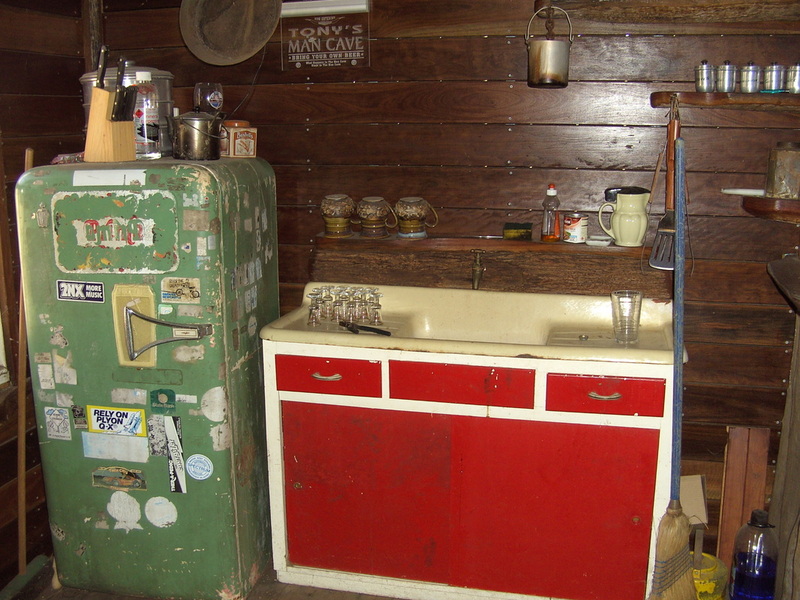 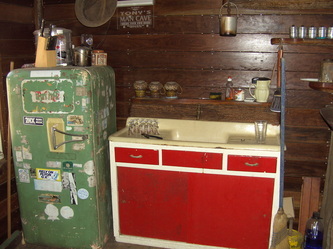 Noel had the hard luck story all wrapped up by breaking down on the way up and if that wasn't enough he also broke down on the way home and when he finally did get home the freezer had turned itself off and all its contents were rotten. Never the less we will all be back again next year. 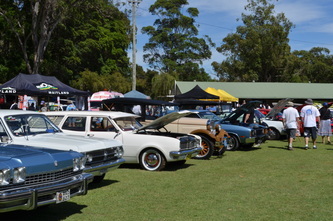 Easy Street held there annual event for the first time at Norah Head and like the week before at the Coasters run it rained and the wind blew a gale on the Friday and Saturday. 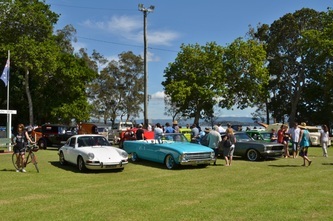 The Sunday however was fine and unlike Port Macquarie all events organized were able to be conducted. 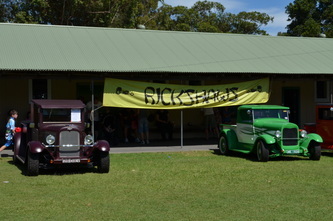 Easy Street members are also to be commended for their efforts and they looked after all entrants with great food and activities. On Saturday we went for a cruise to a cheese factory and then to the local club for lunch. 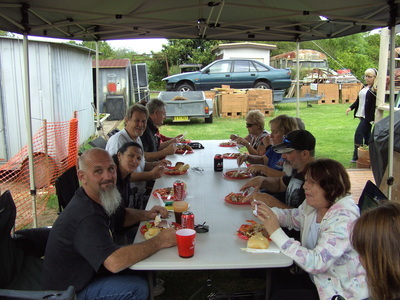 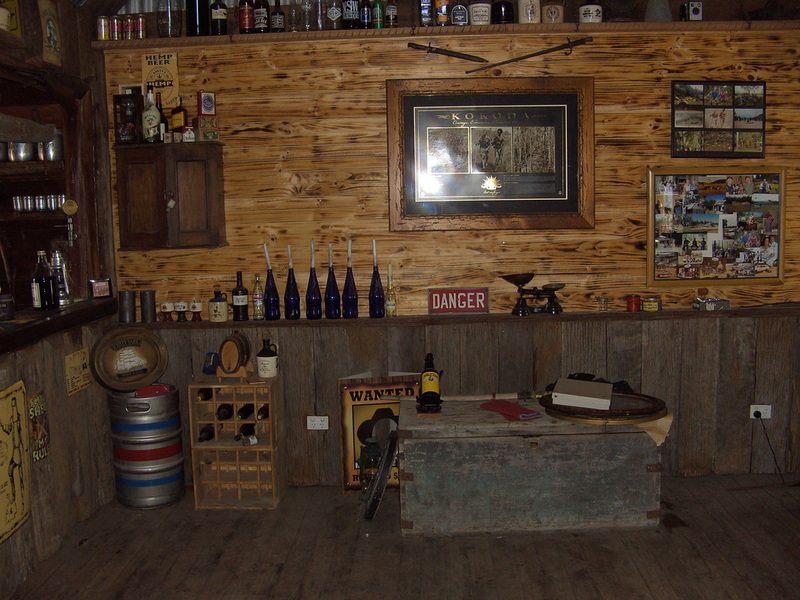 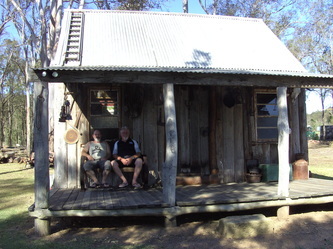 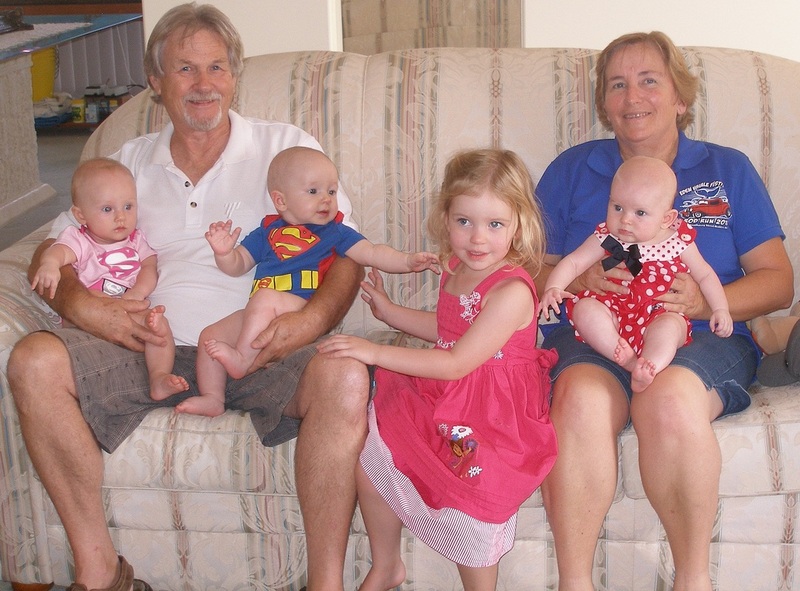 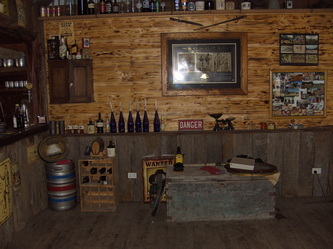 In the evening they had a spit roast dinner and trivia night which was great fun. 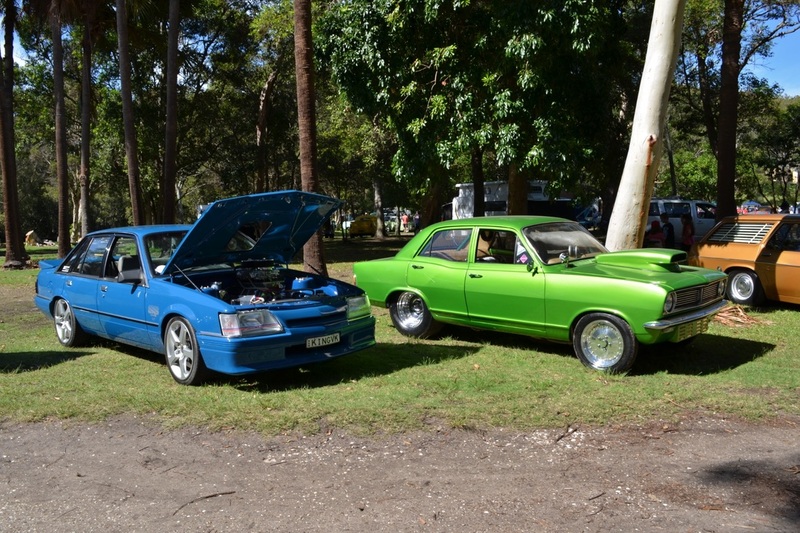 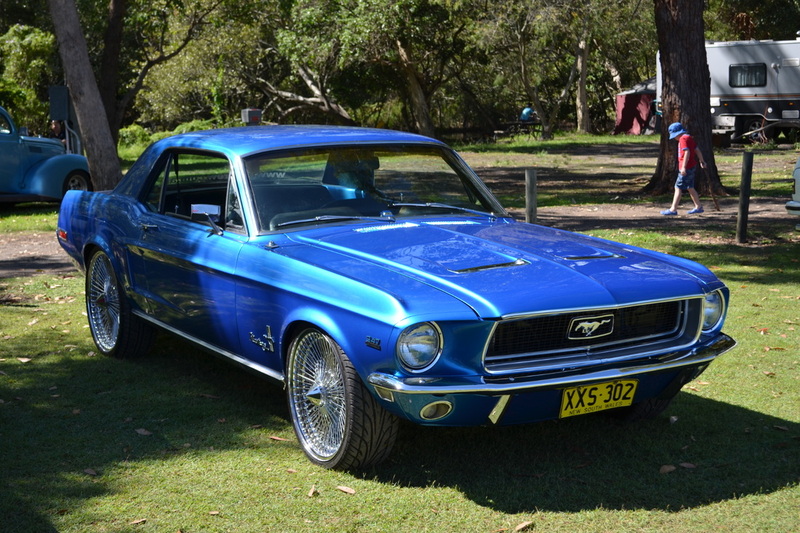 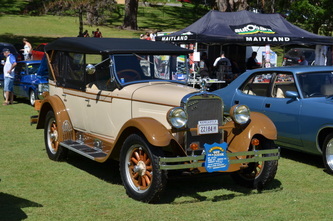 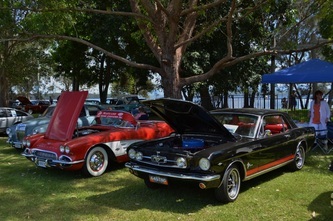 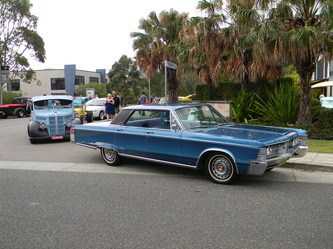 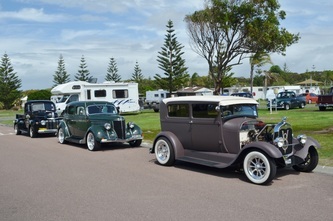 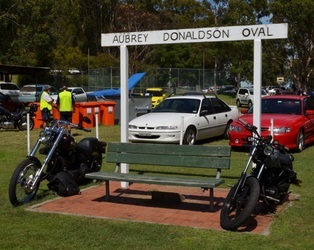 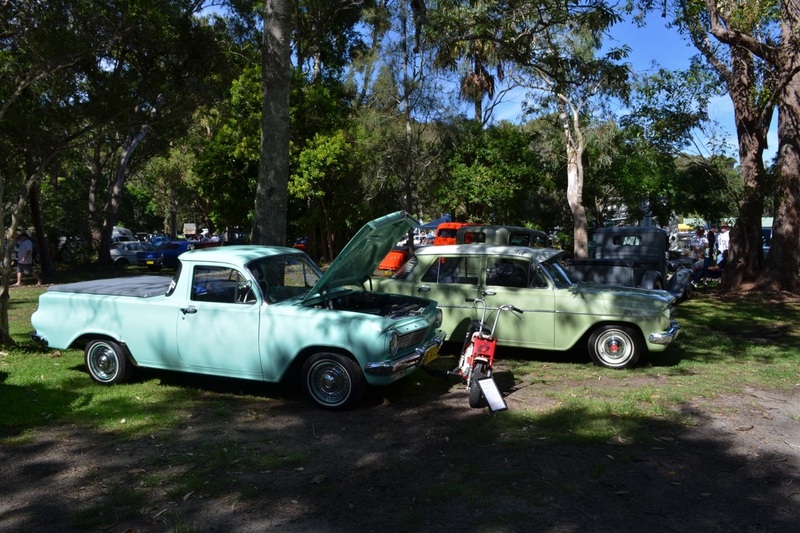 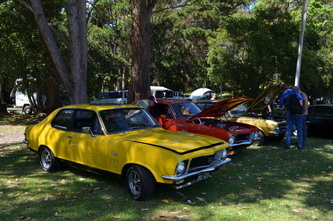 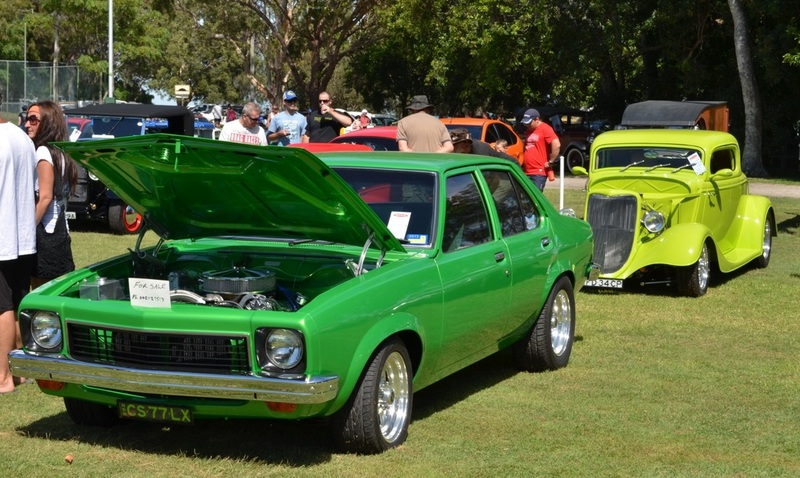 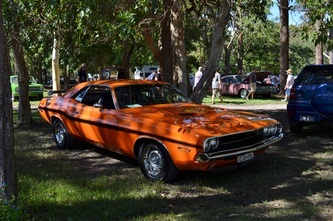 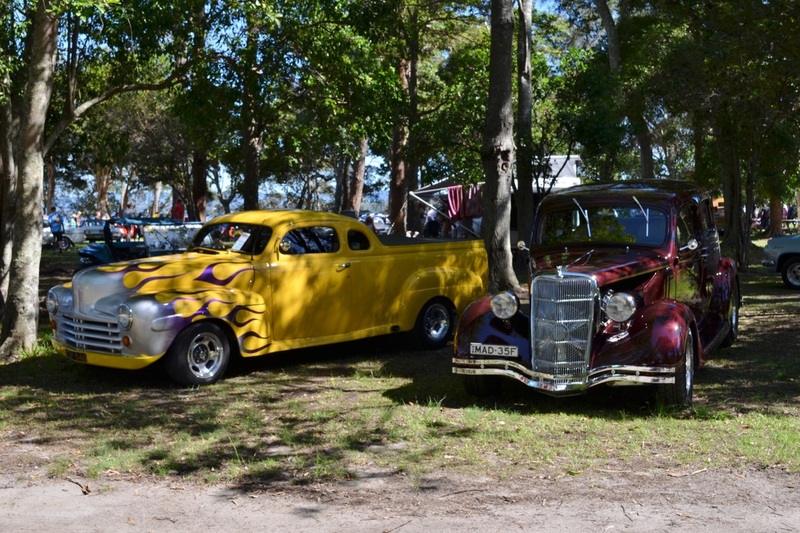 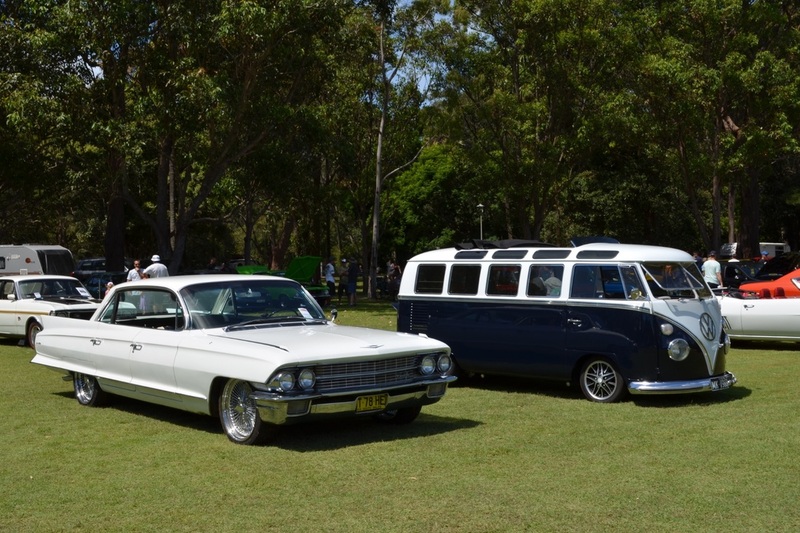 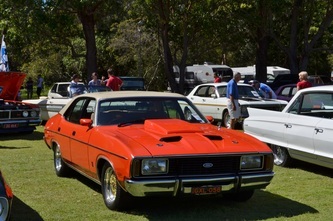 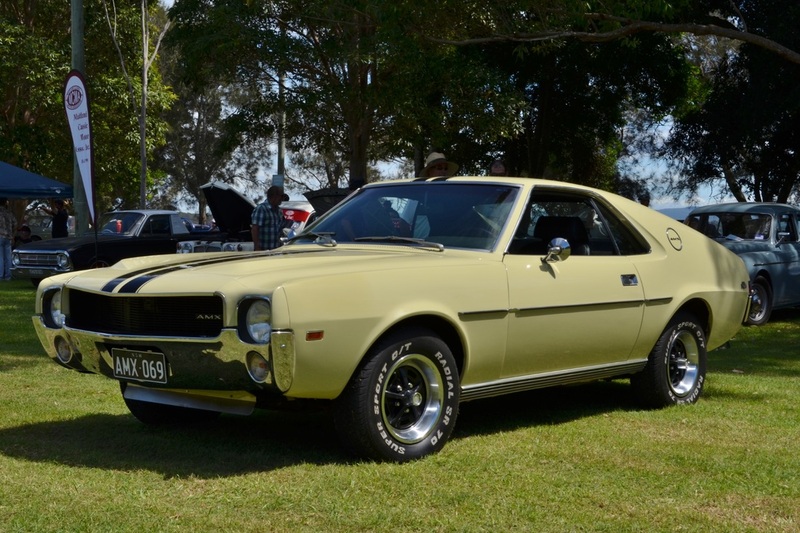 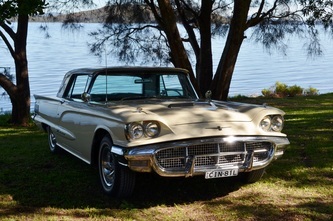 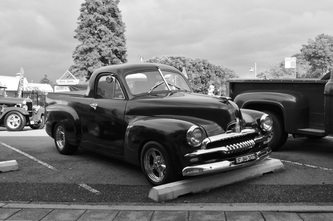 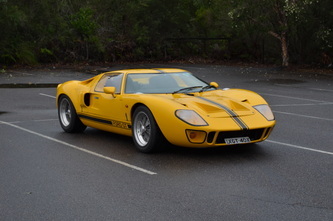 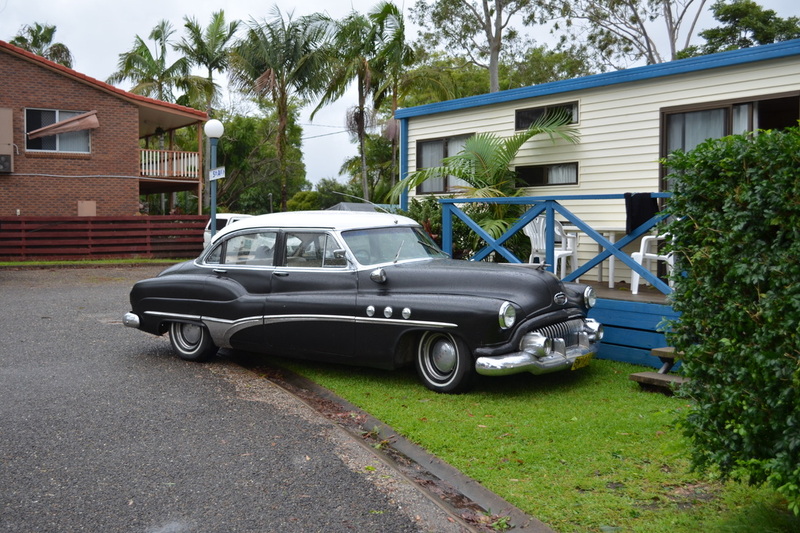 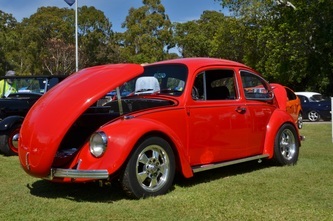 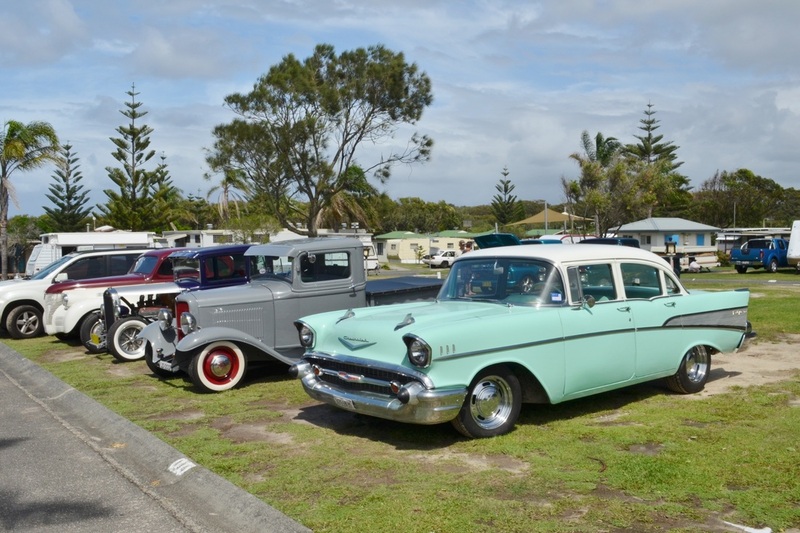 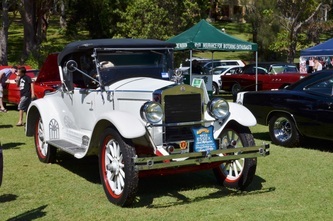 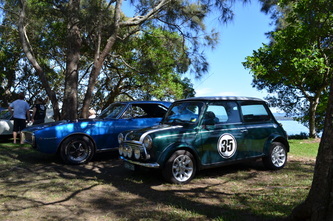 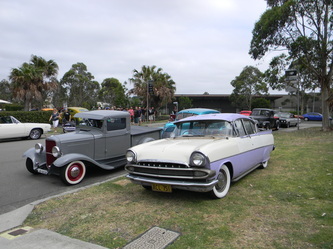 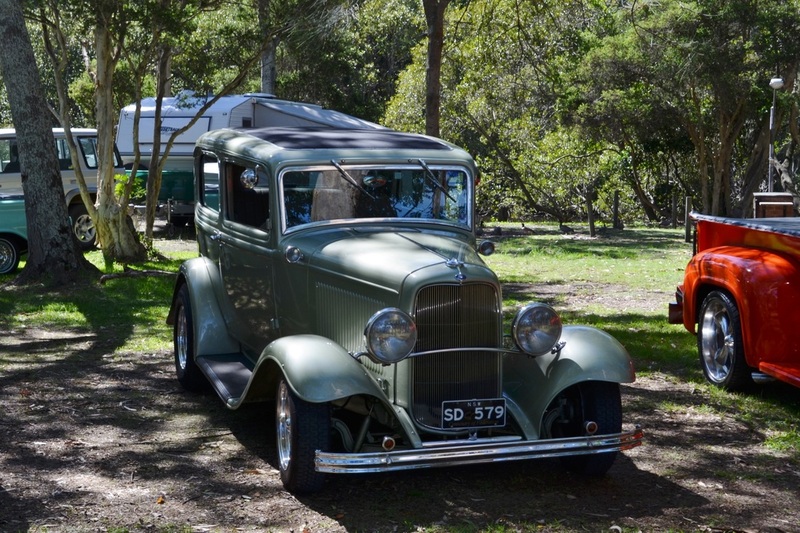 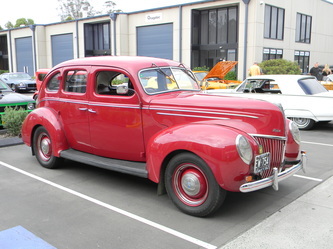 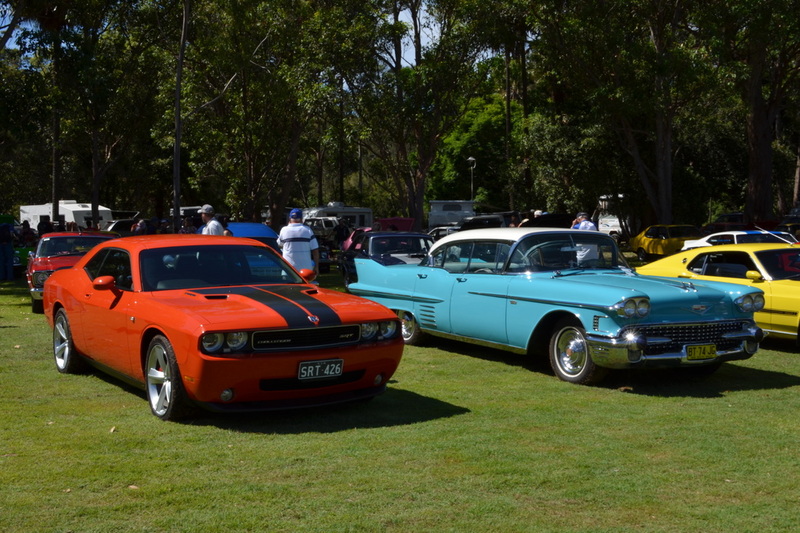 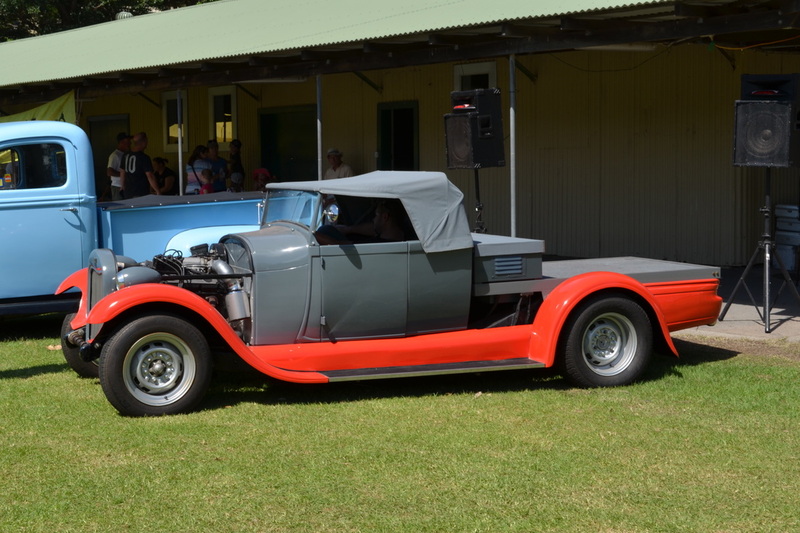 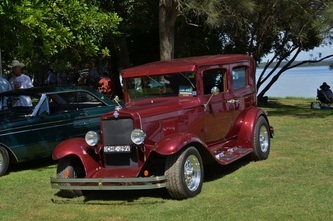 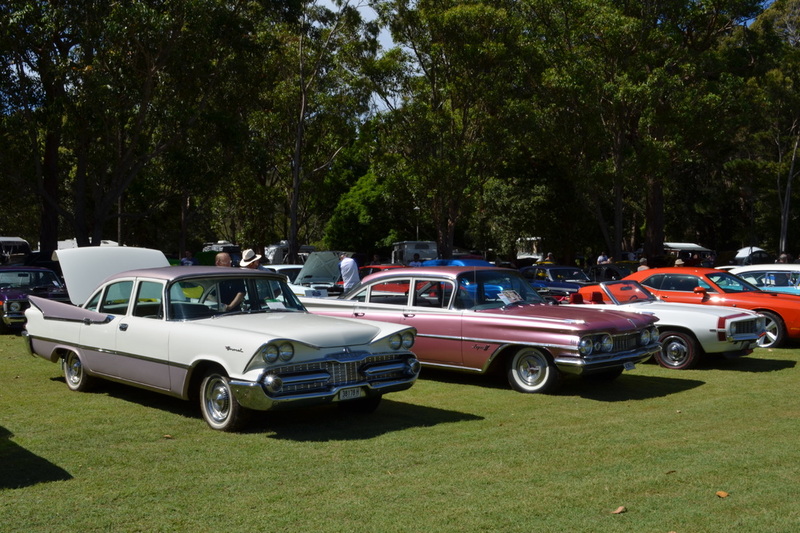 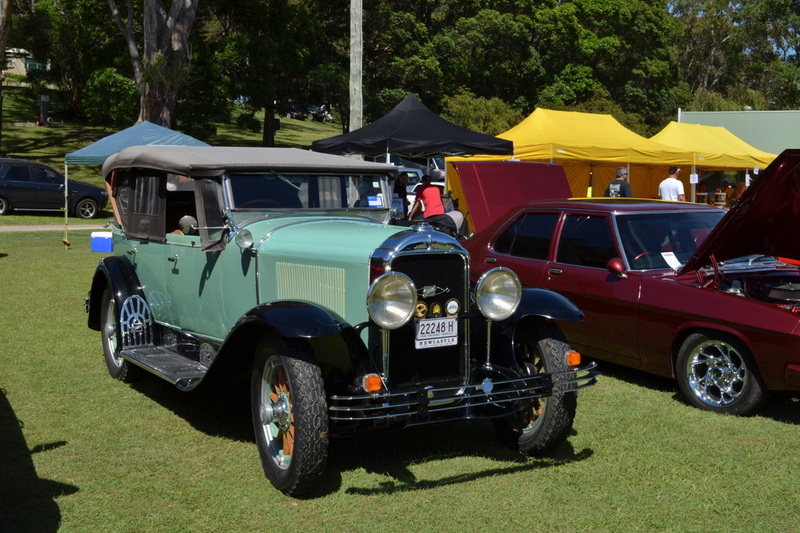 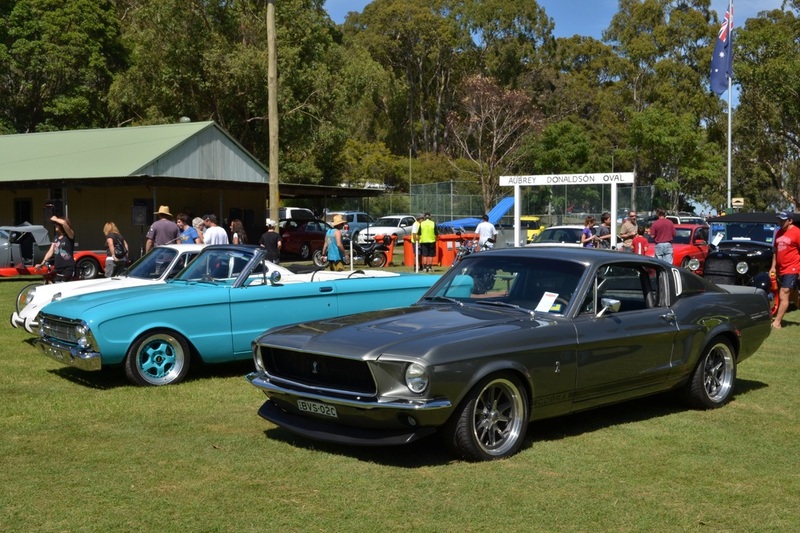 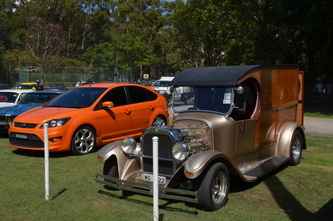 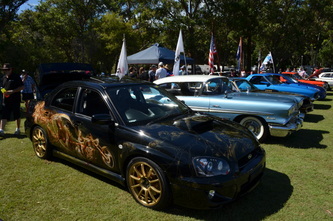 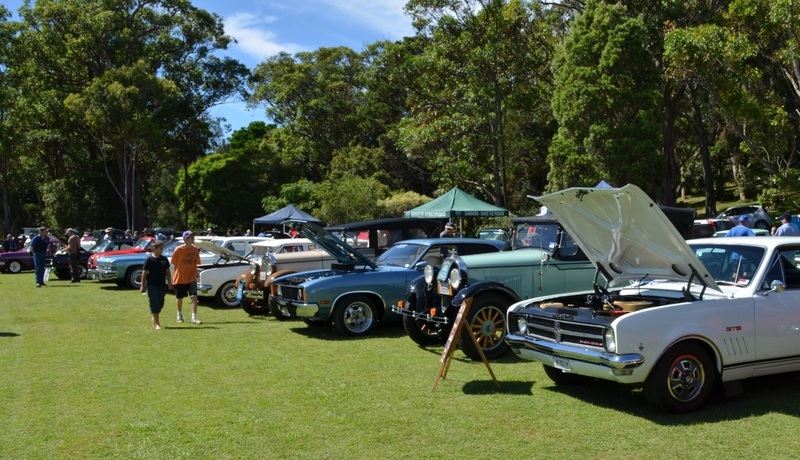 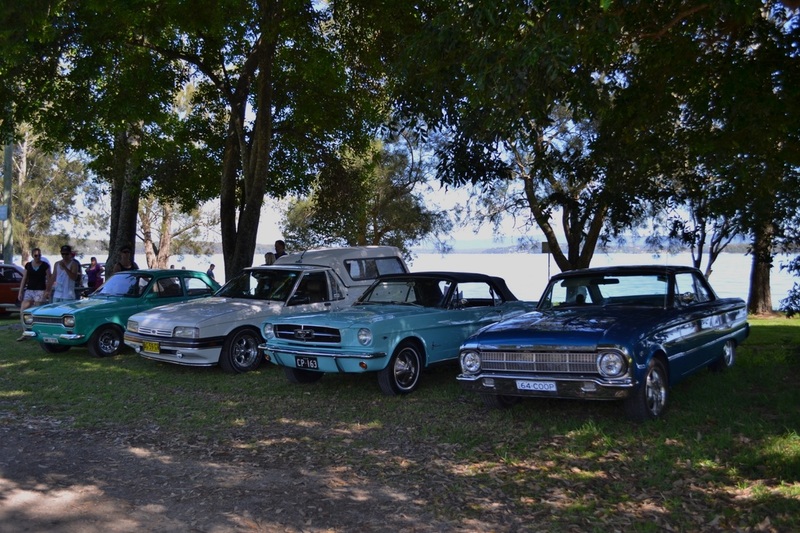 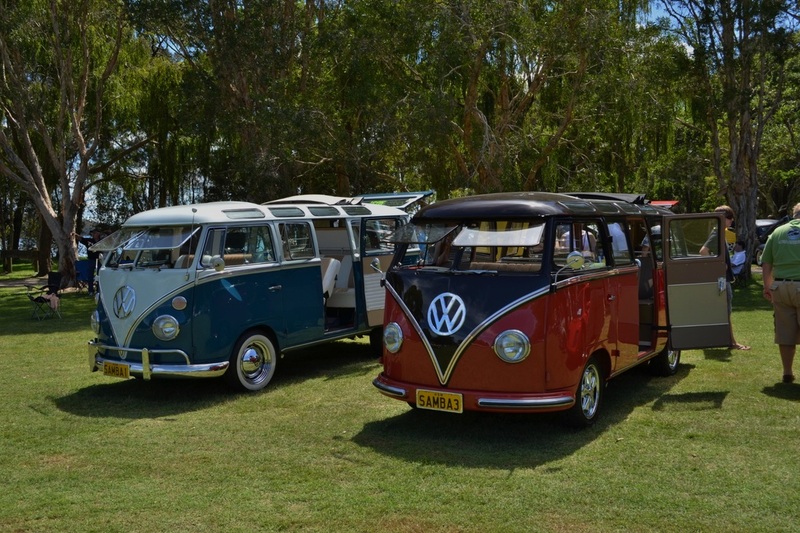 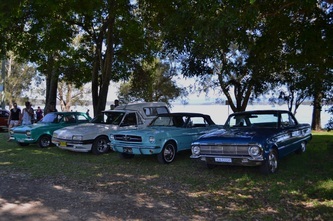 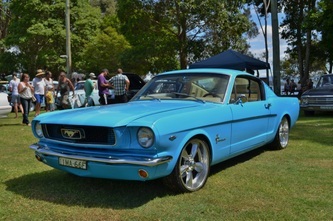 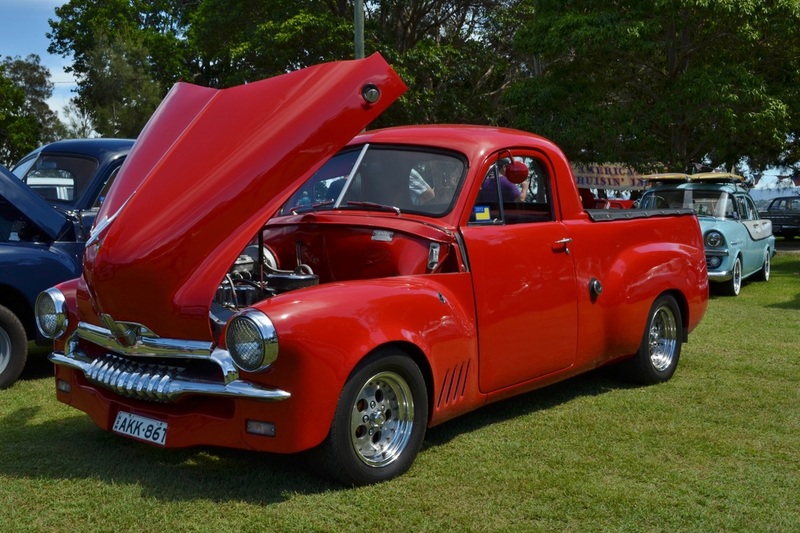 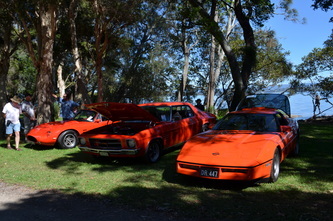 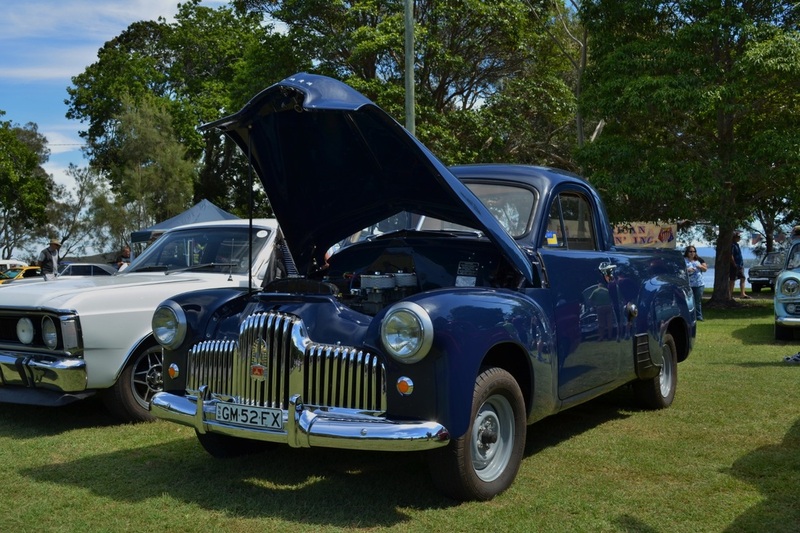 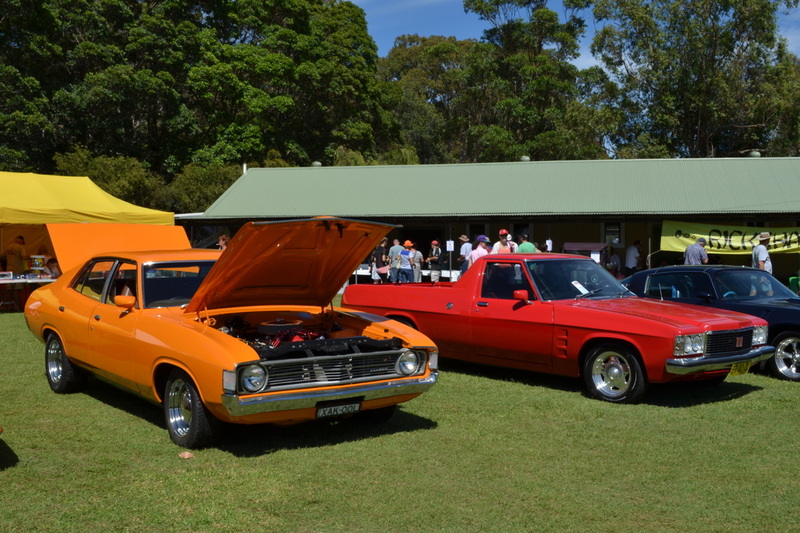 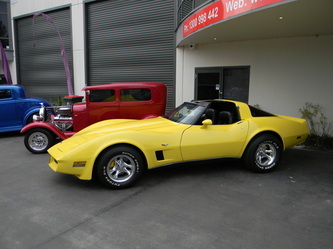 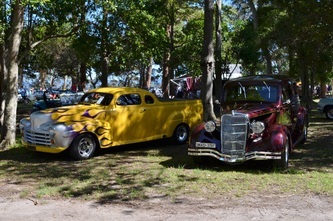 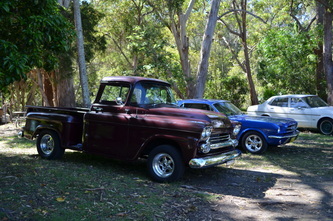 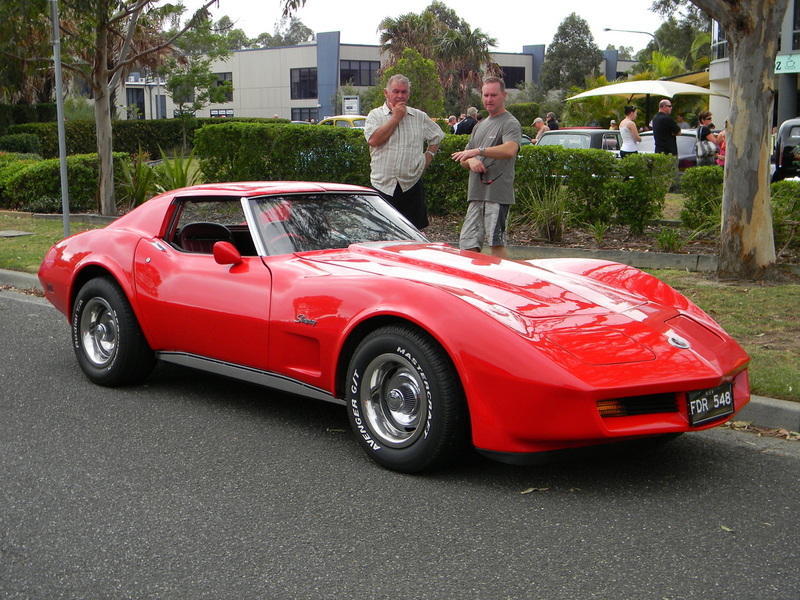 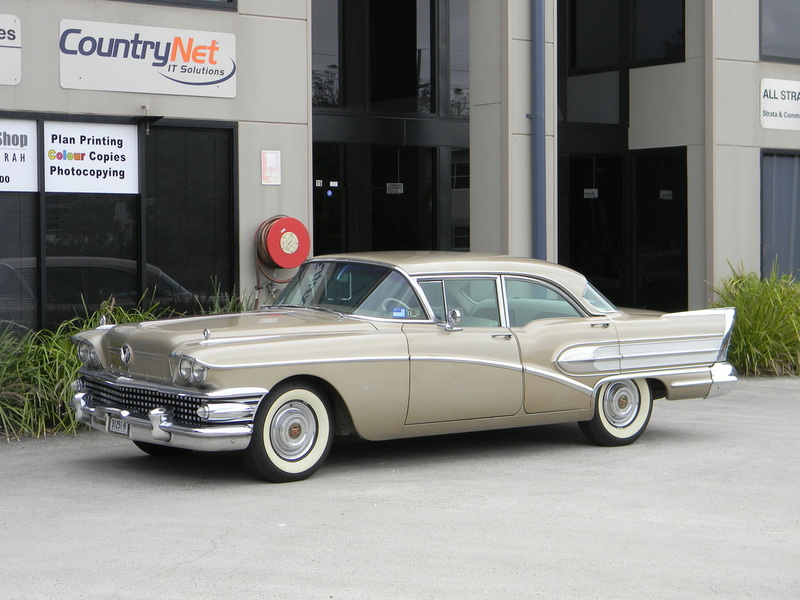 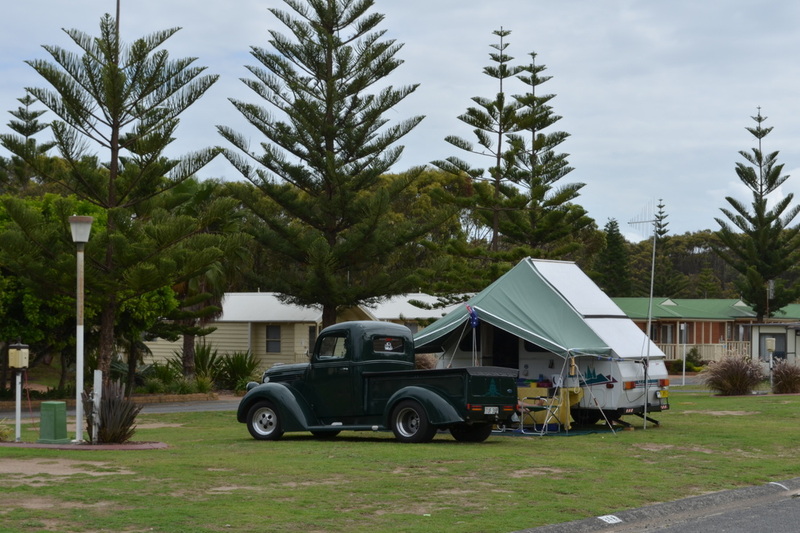 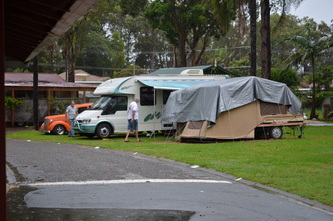 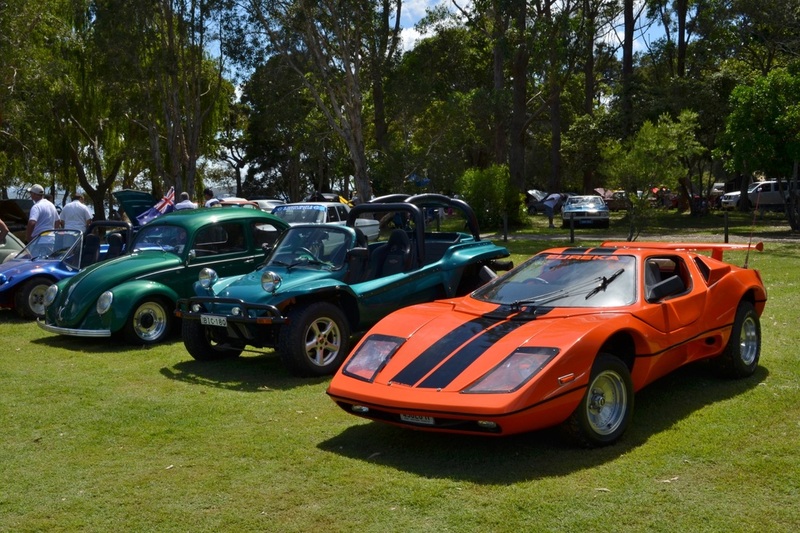 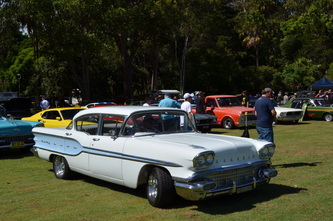 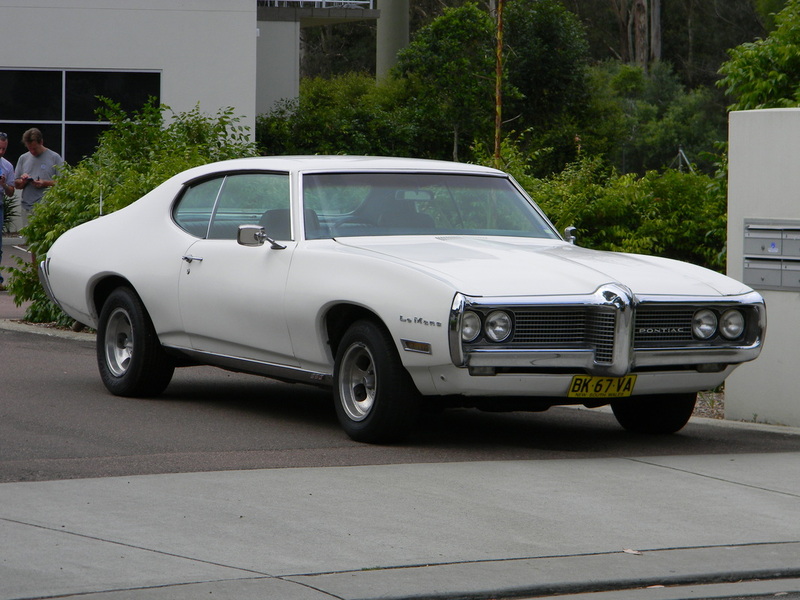 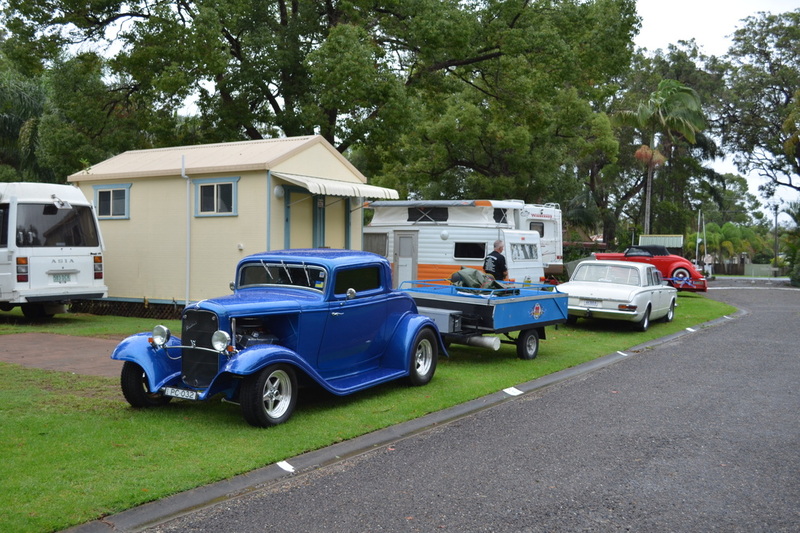 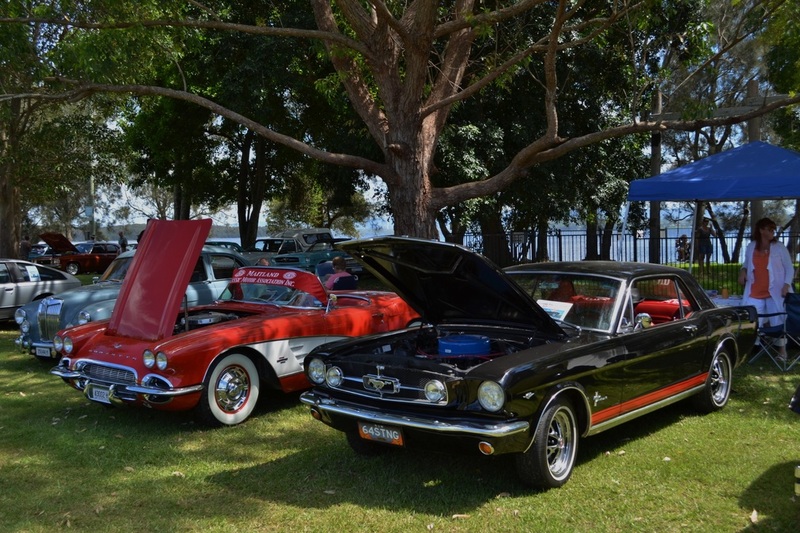 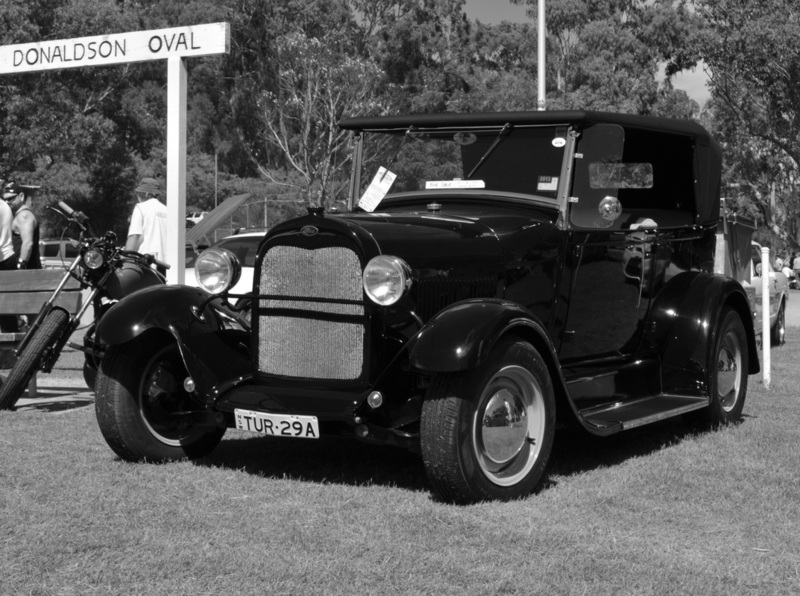 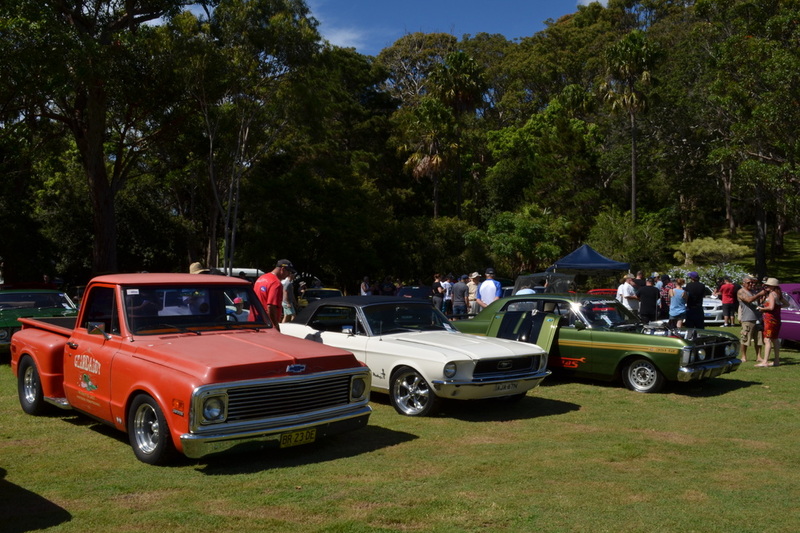 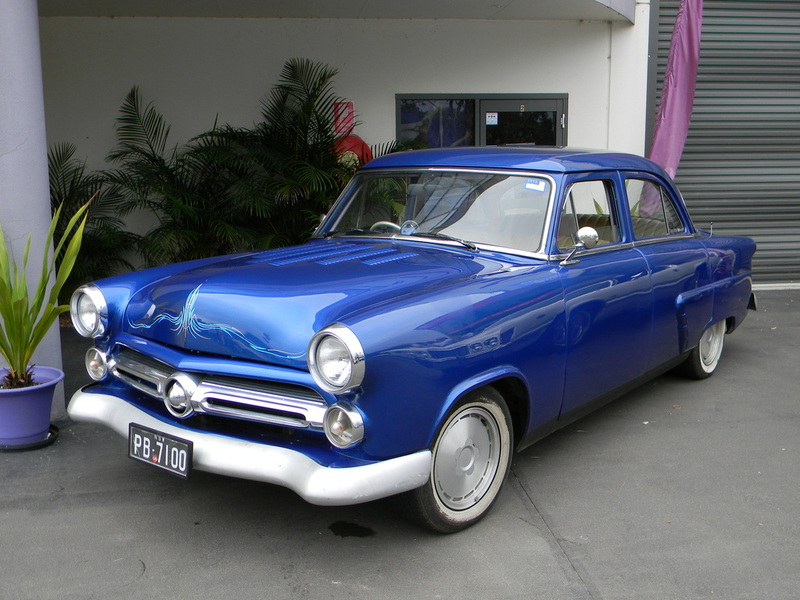 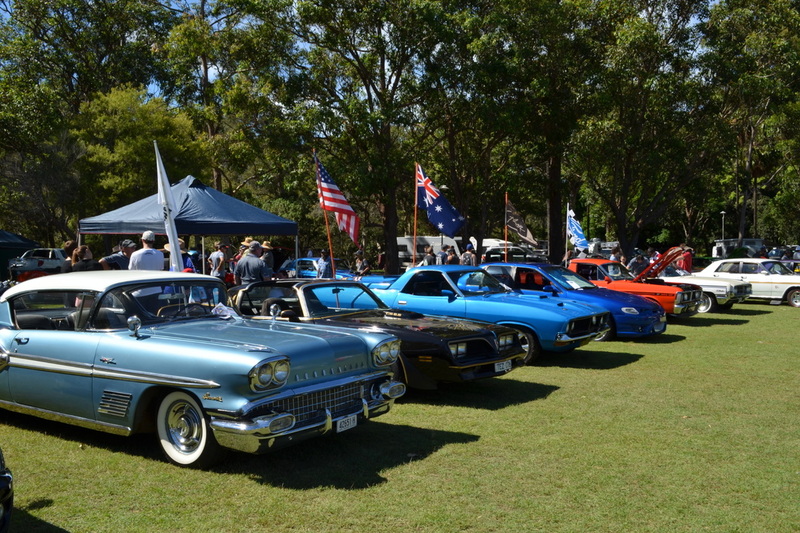 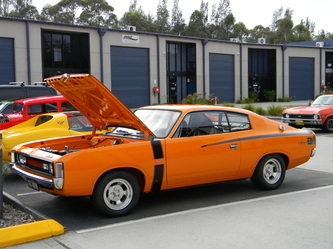 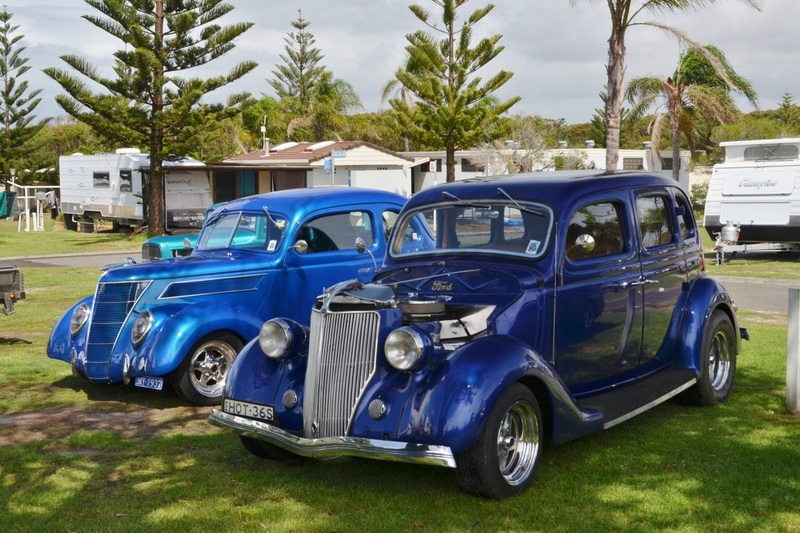 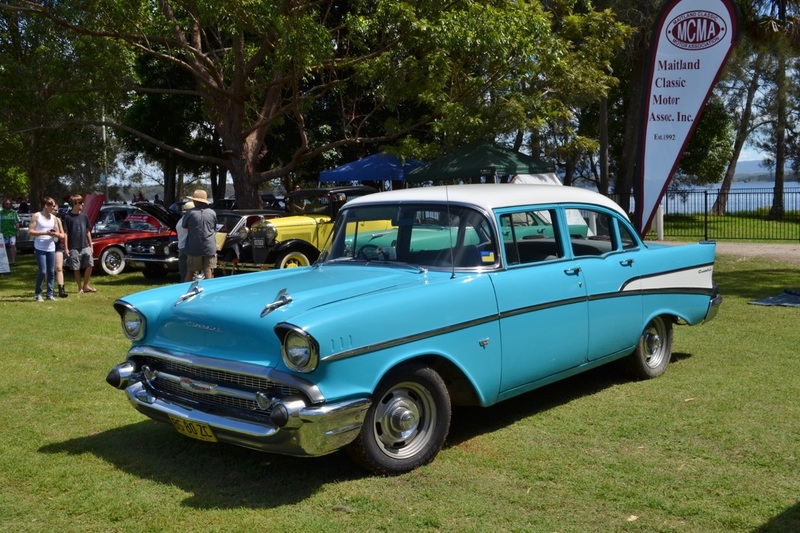 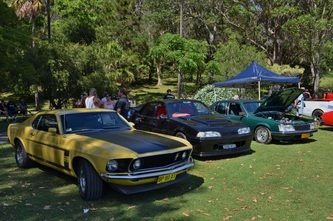 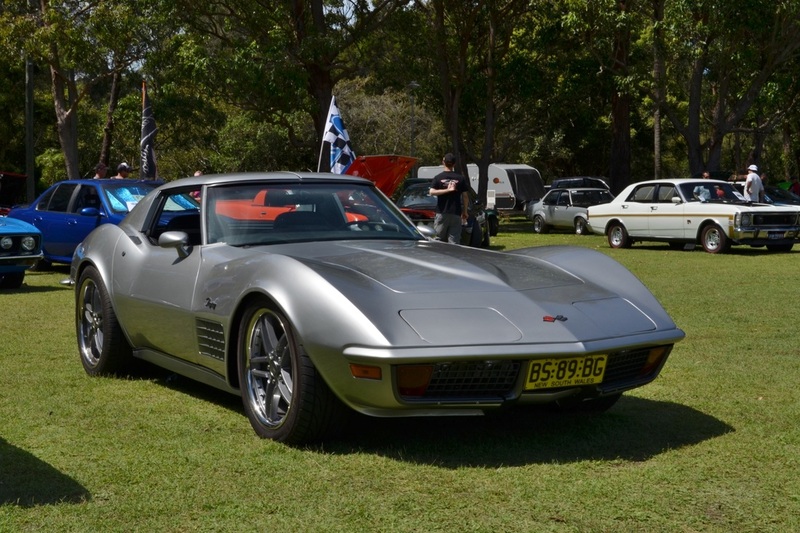 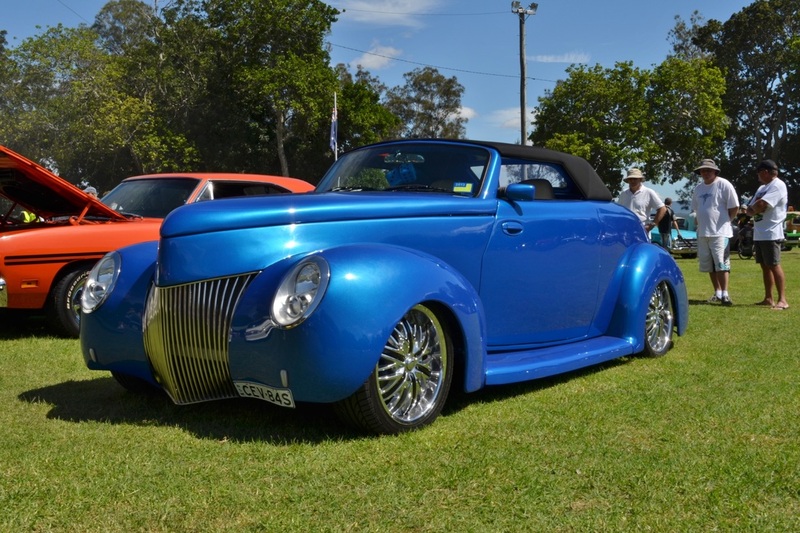 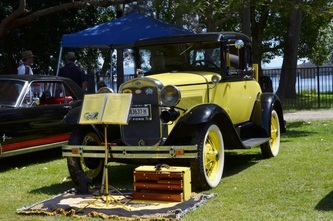 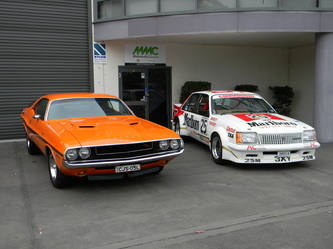 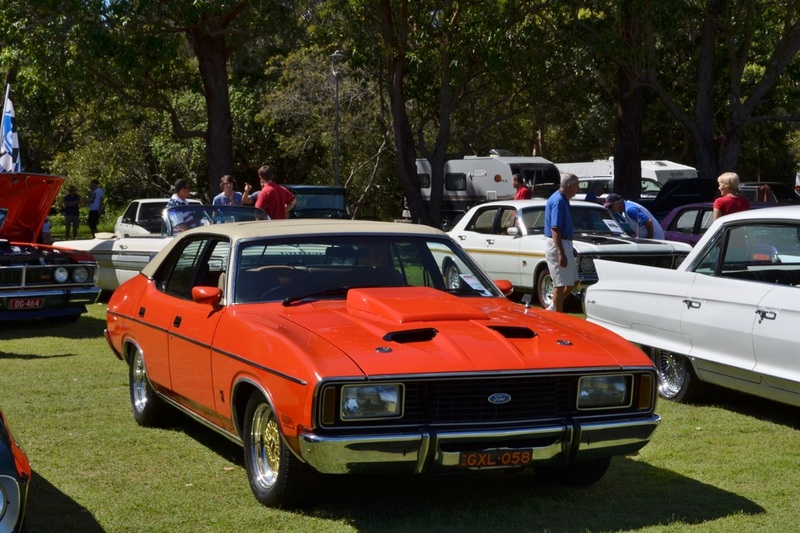 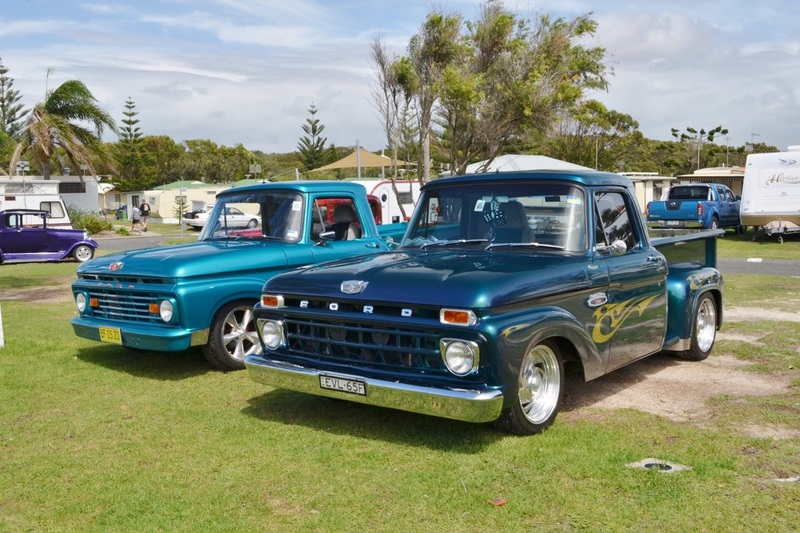 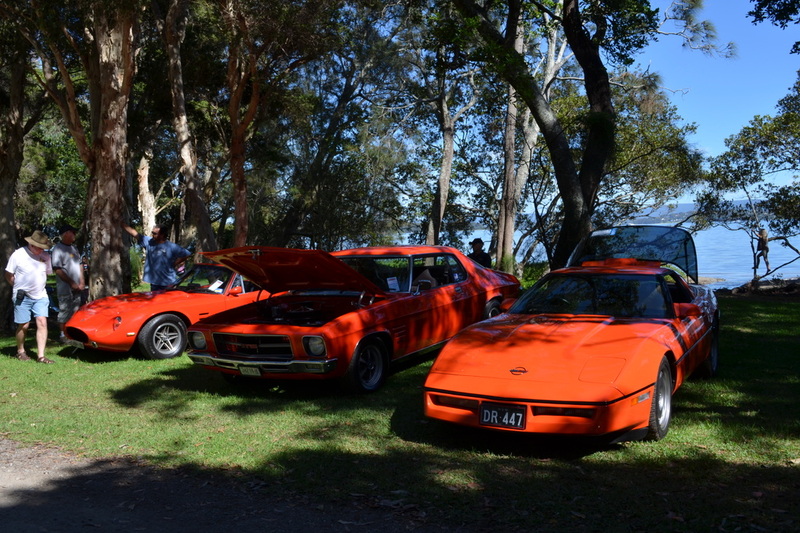 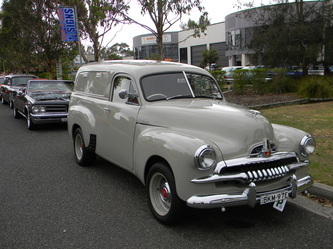 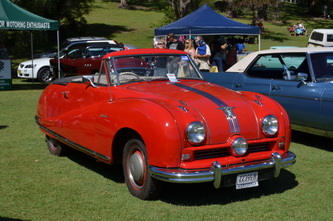 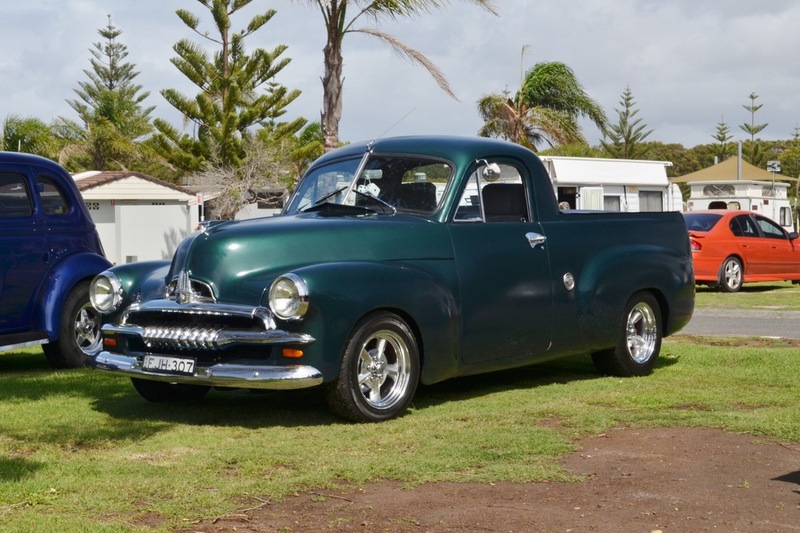 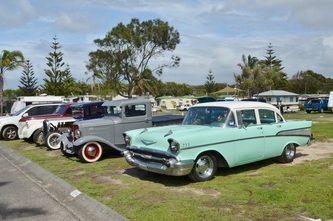 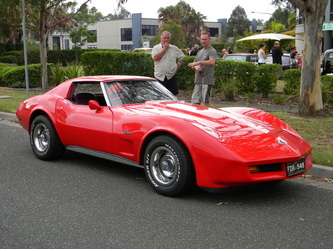 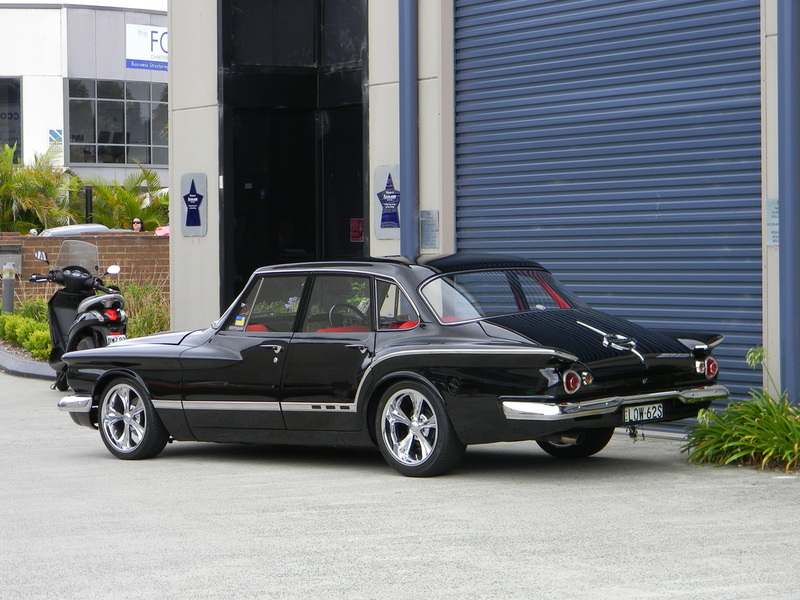 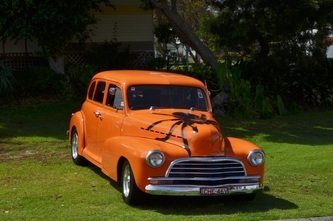 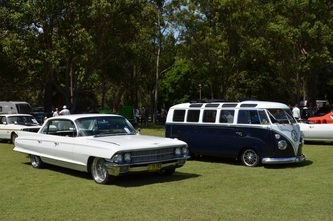 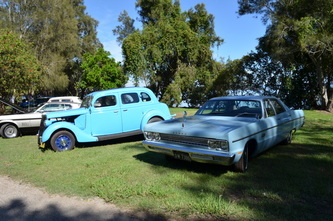 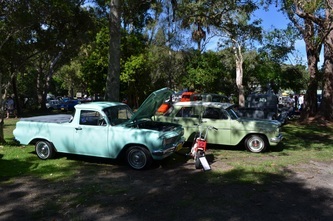 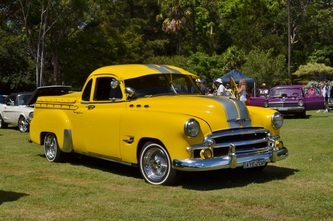 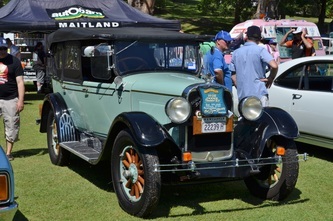 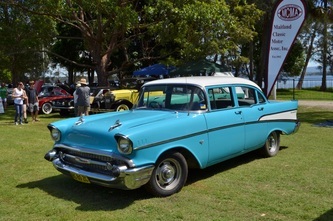 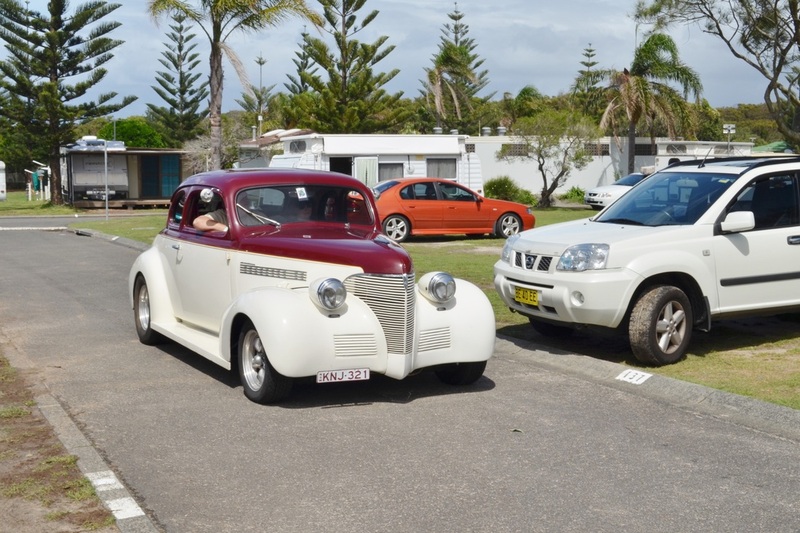 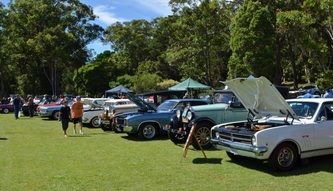 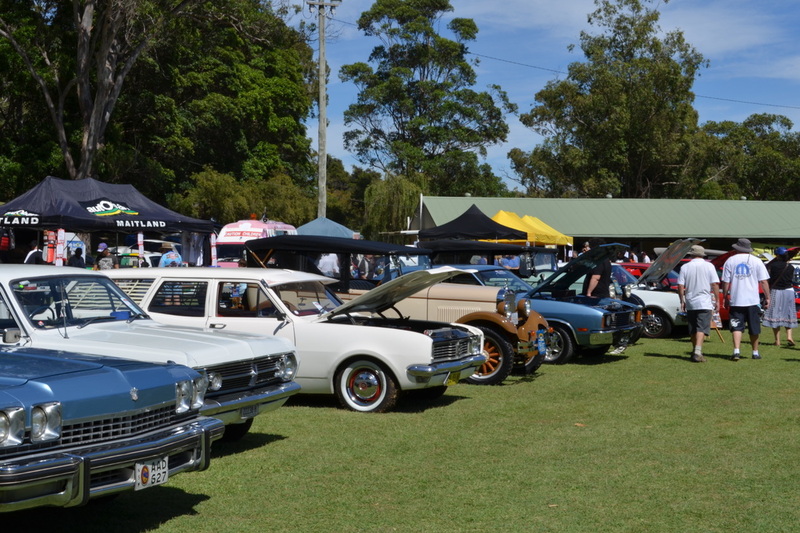 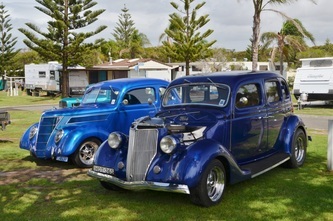 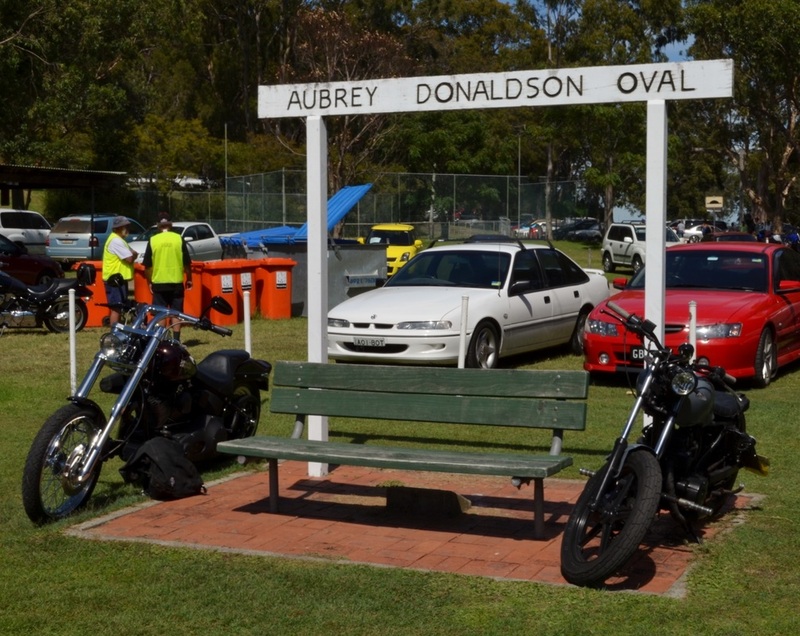 On Sunday the show and shine was at Toukley after which we went back to the caravan park for lunch and the presentation. 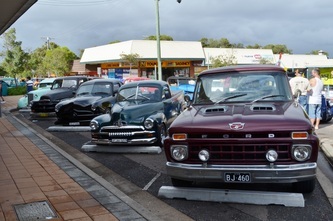 Thanks Easy Street for a great weekend and we will be back next year. MAD this year was cancelled in February due to wet weather and held in March on a fine and perfect day for the event. 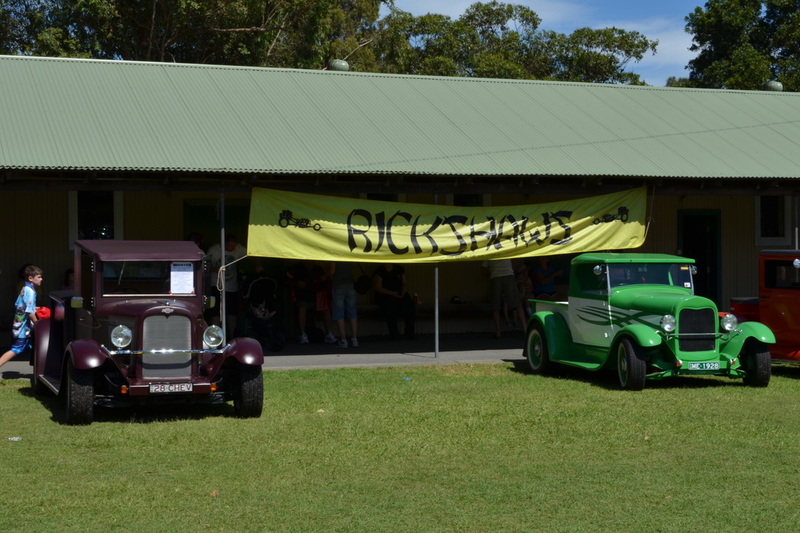 Numbers were down slightly on last year but it was still a very well attended event and a great success for Rickshaws who run the Show and Shine.